Oshawa is a city in Southern Ontario on the Lake Ontario shoreline. 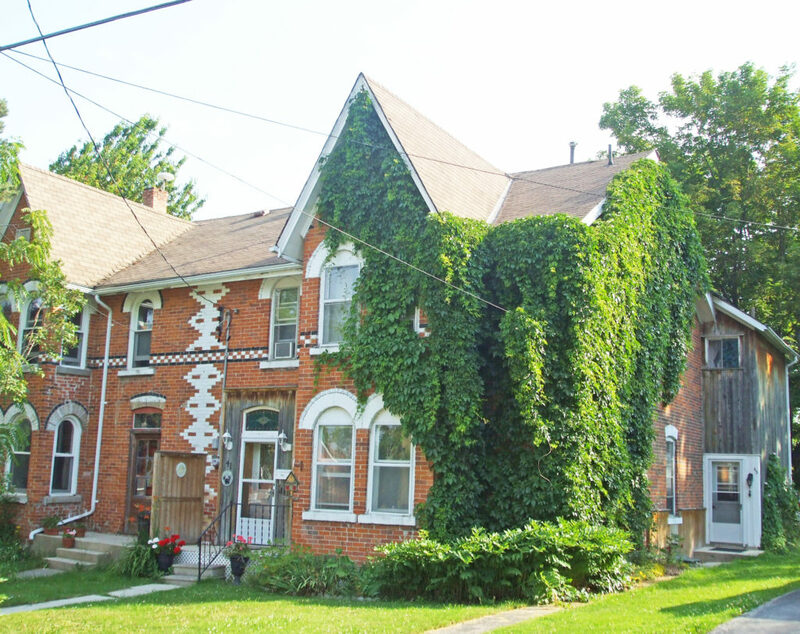 It is about sixty kilometers east of Downtown Toronto. The name Oshawa comes from the Ojibwa word meaning “the crossing place” or “where we must leave our canoes”. More than 5,000 people work and more than 2,400 university students study in the downtown core. Oshawa’s roots are tied to the automobile industry with the Canadian division of General Motors located here. It was founded in 1876 as the McLaughlin Carriage Company. 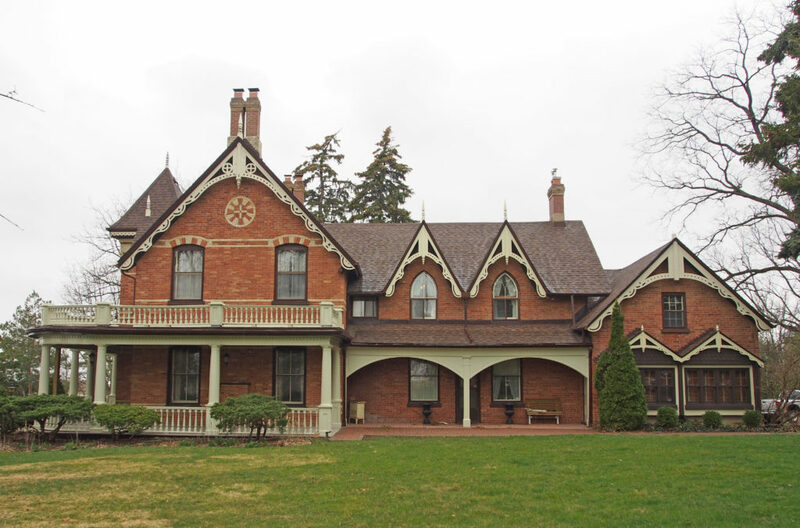 The lavish home of the carriage company’s founder, Parkwood Estate, is a National Historic Site of Canada. 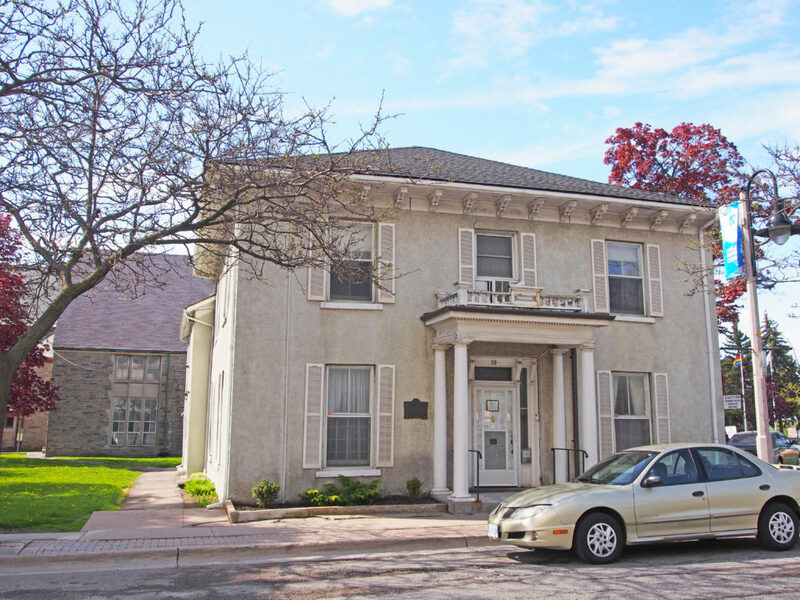 Historians believe that Oshawa began as a transfer point for the fur trade. Beaver and other animals trapped for their pelts by local natives were traded with the Coureurs des bois (voyagers). Furs were loaded onto canoes by the Mississauga Indians at the Oshawa harbor and transported to the trading posts located to the west at the mouth of the Credit River. Around 1760, the French constructed a trading post near the harbor location; this was abandoned after a few years, but its ruins provided shelter for the first residents of what later became Oshawa. In the late eighteenth century, a local resident, Roger Conant, started an export business shipping salmon to the United States. His success attracted further migration into the region. A large number of the founding immigrants were United Empire Loyalists, who left the United States to live under British rule. Later Irish and then French-Canadian immigration increased as did industrialization. Oshawa and the surrounding Ontario County were the settling grounds of a large number of nineteenth century Cornish immigrants. 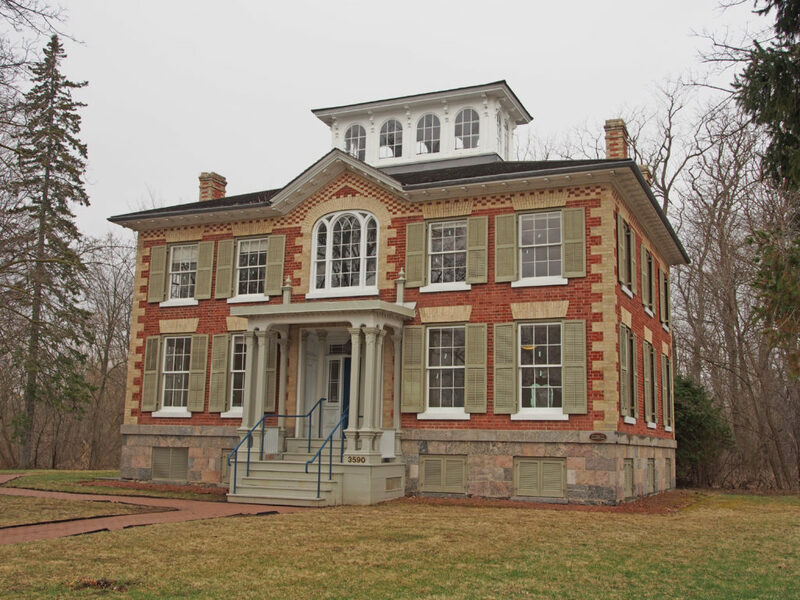 The surveys ordered by Governor John Graves Simcoe, and subsequent land grants, helped populate the area. 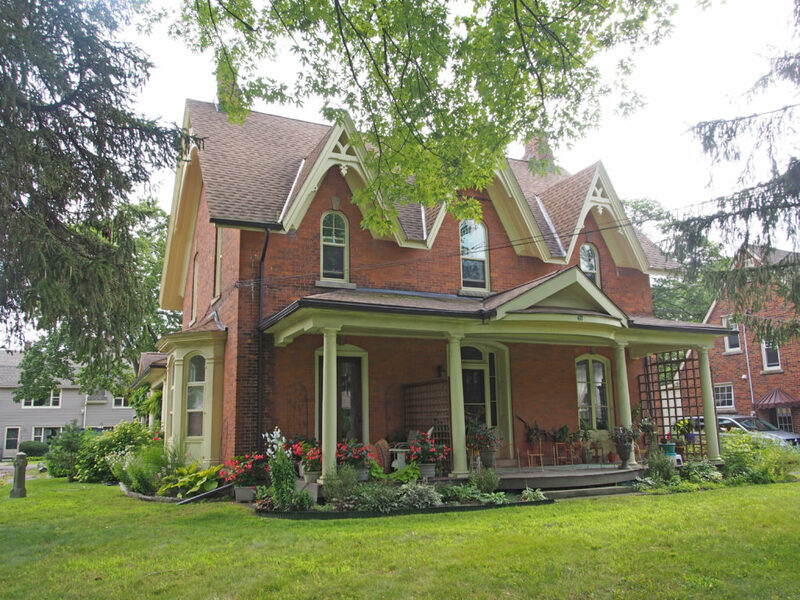 When Col. Asa Danforth laid out his York-to-Kingston road, it passed through the Oshawa area. In 1846 there were about 1,000 people in a community surrounded by farms. 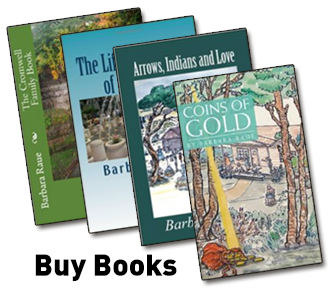 There were three churches, a post office, and tradesmen of various types, a foundry, a grist mill and a fulling mill, a brewery, two distilleries, a machine shop and four cabinet makers. The newly established village became an industrial center, and implement works, tanneries, asheries and wagon factories opened. 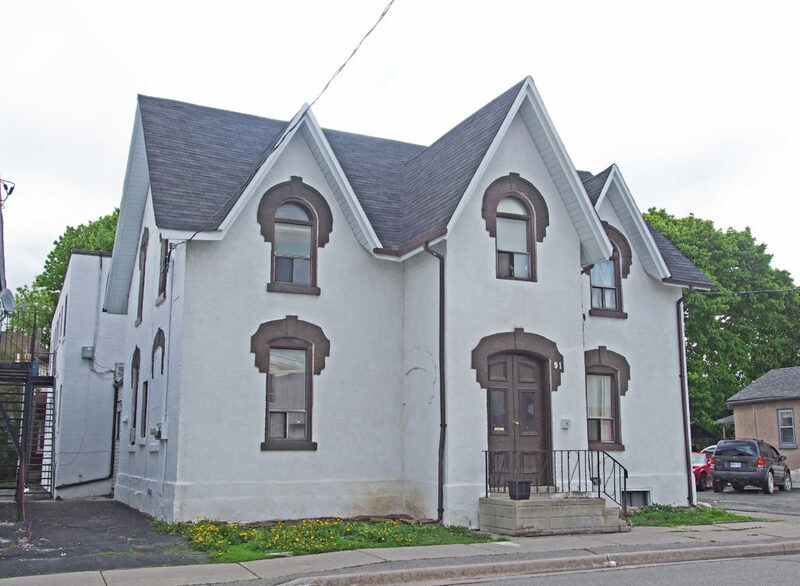 In 1876, Robert Samuel McLaughlin, Sr. moved his carriage works to Oshawa from Enniskillen to take advantage of its harbor and of the availability of a rail link not too far away. He constructed a two-storey building, which was soon added to. This building was heavily remodeled in 1929, receiving a new facade and being extended to the north. 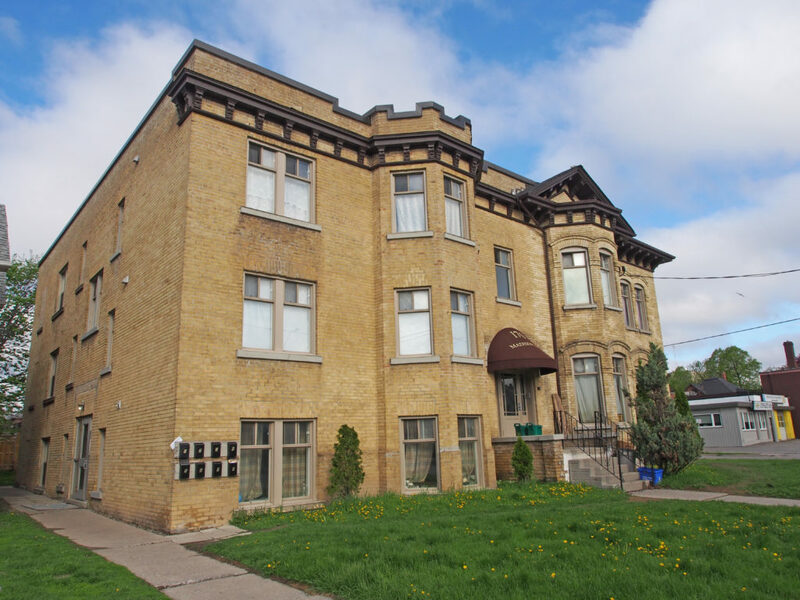 Around 1890, the carriage works relocated from its Simcoe Street address to an unused furniture factory a couple of blocks to the northeast, and this remained its site until the building burnt in 1899. 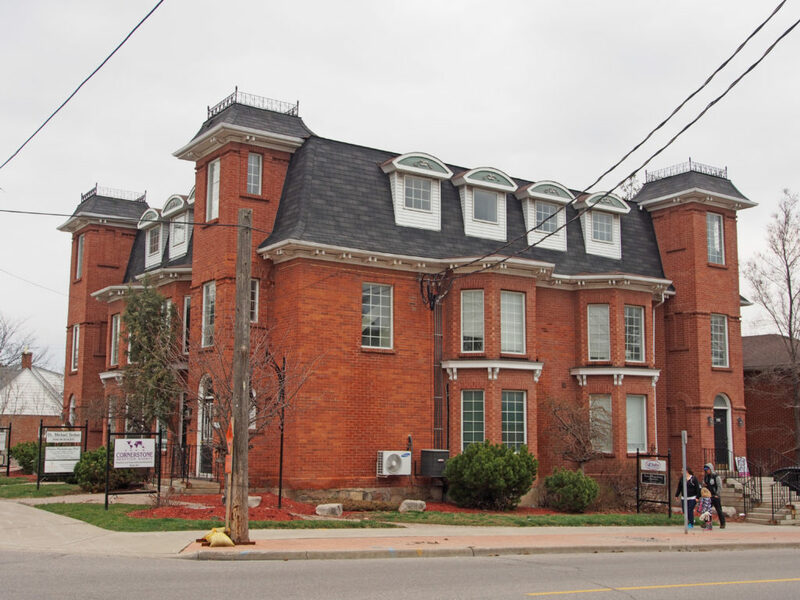 Offered assistance by the town, McLaughlin chose to stay in Oshawa, building a new factory across Mary Street from the old site. Rail service had been provided in 1890 by the Oshawa Railway; this was originally set up as a streetcar line, but by about 1910 a second freight line was built slightly to the east of Simcoe Street which provided streetcar and freight service, connected central Oshawa with the Grand Trunk (now Canadian National) Railway, and with the Canadian Northern (which ran through the very north of Oshawa) and the Canadian Pacific, built in 1912-13. Whitby is located in Durham Region in Southern Ontario, east of Ajax and west of Oshawa, on the north shore of Lake Ontario. 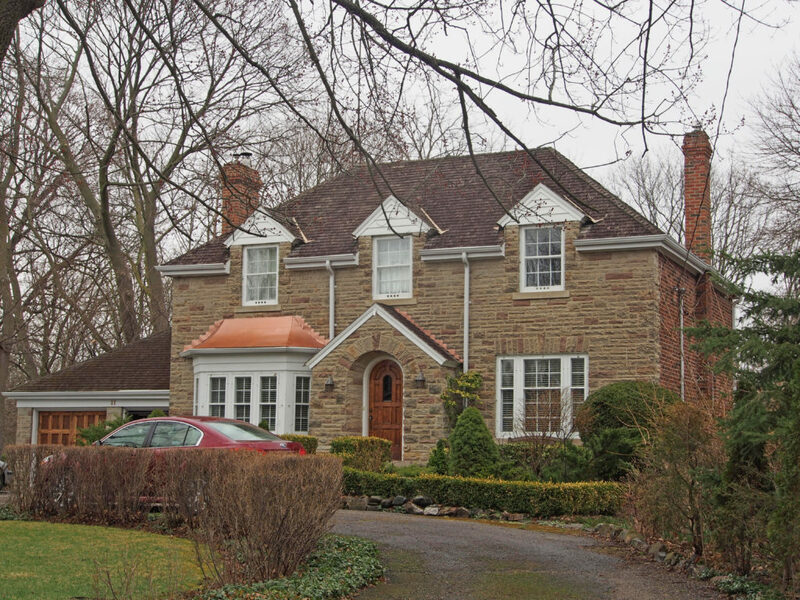 It is about twenty kilometers (twelve miles) east of the Toronto borough of Scarborough. 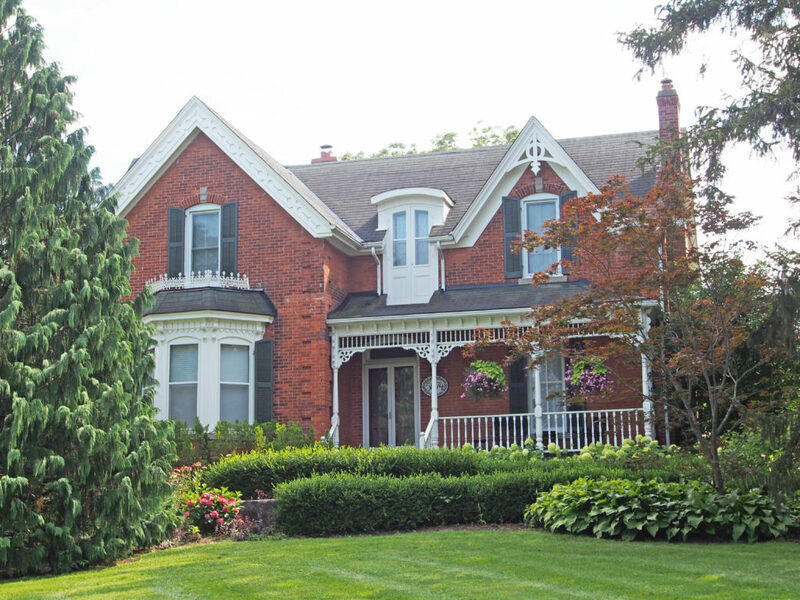 The southern part of Whitby is predominantly urban and an economic hub; the northern part is more rural and includes the communities of Ashburn, Brooklin, Myrtle, and Myrtle Station. Whitby was named after the seaport town of Whitby, Yorkshire, England. 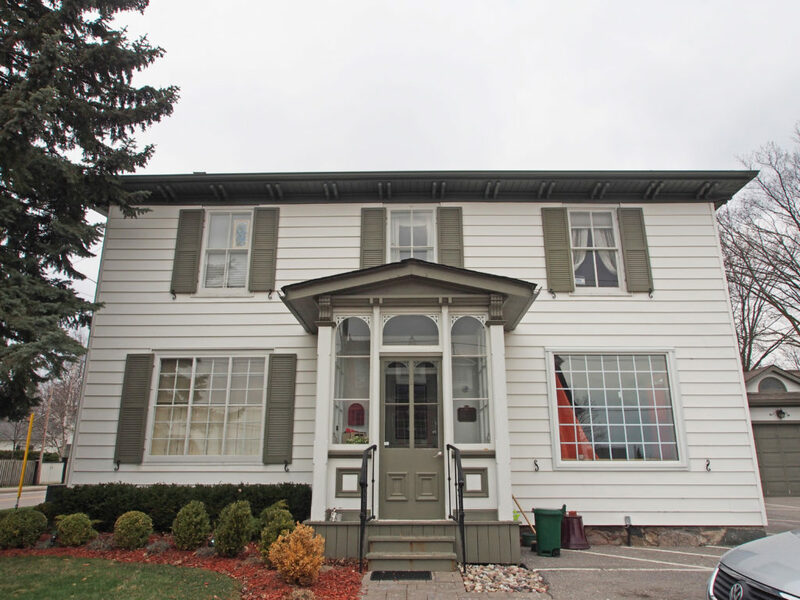 Settlement dates back to 1800, however, it was not until 1836 that a downtown business center was established by Whitby’s founder Peter Perry. Whitby’s chief asset was its natural harbor on Lake Ontario, from which grain from the farmland to the north was first shipped in 1833. In the 1840s, a road was built from Whitby Harbor to Lake Simcoe and Georgian Bay, to bring trade and settlement through the harbor to and from the rich land to the north. Many residents commute to work in other Greater Toronto Area communities, and General Motors Canada in Oshawa is a major employer for all of Durham Region. Whitby has a steel mill, a retail support center operated by Sobeys, and a major Liquor Control Board of Ontario warehouse. Four railways pass through Whitby. The Toronto-Montreal corridor main lines of the Canadian National Railway and Canadian Pacific Railway both pass east–west through the south end of town. A second CP line running from Toronto to Havelock passes through the northern part of Whitby. Via Rail trains travel through Whitby, but the nearest station is in Oshawa. GO Transit provides frequent service via its Lakeshore East line. 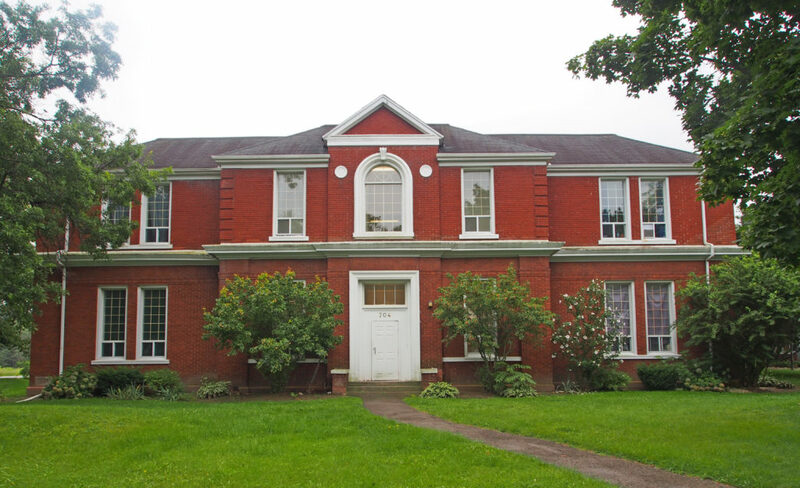 416 Centre Street South – Whitby Centennial Building was designed by Cumberland and Strom in the Greek Revival style. 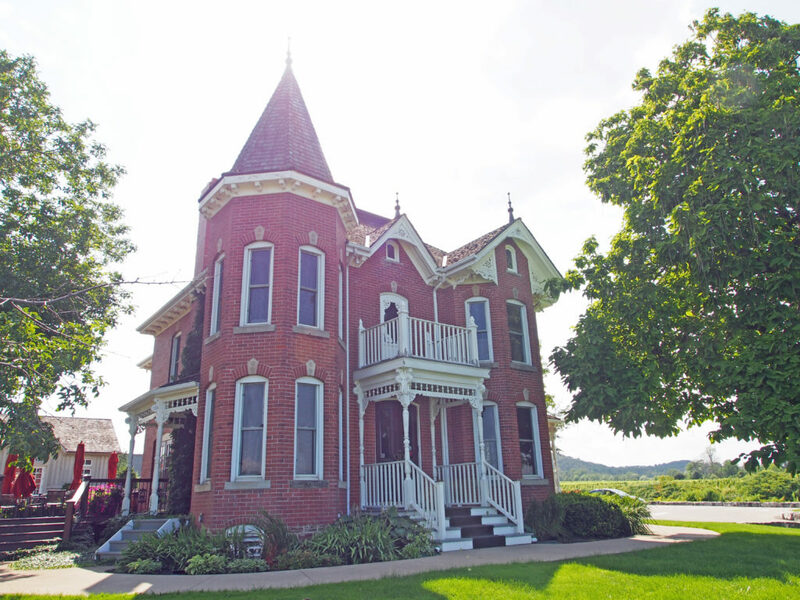 It was built in 1853 with the second floor added in 1910. 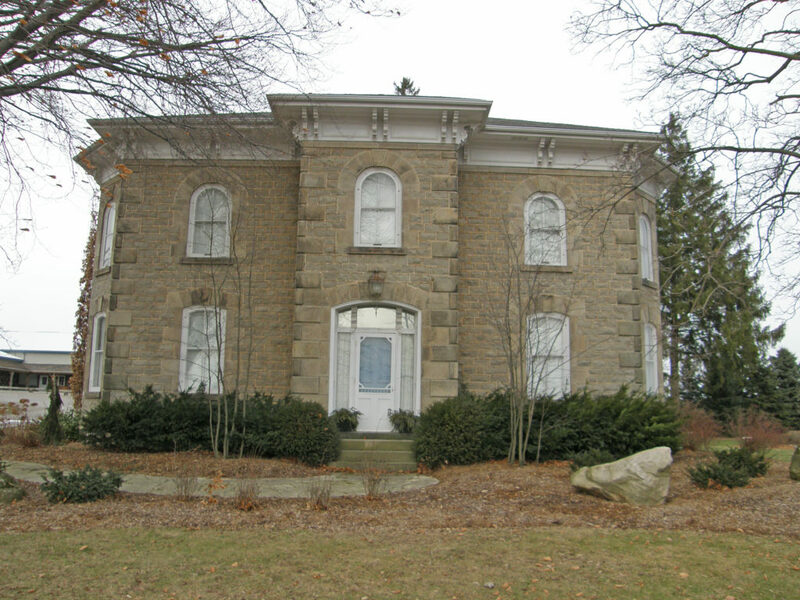 It served as Ontario County Court House from 1854 to 1964. 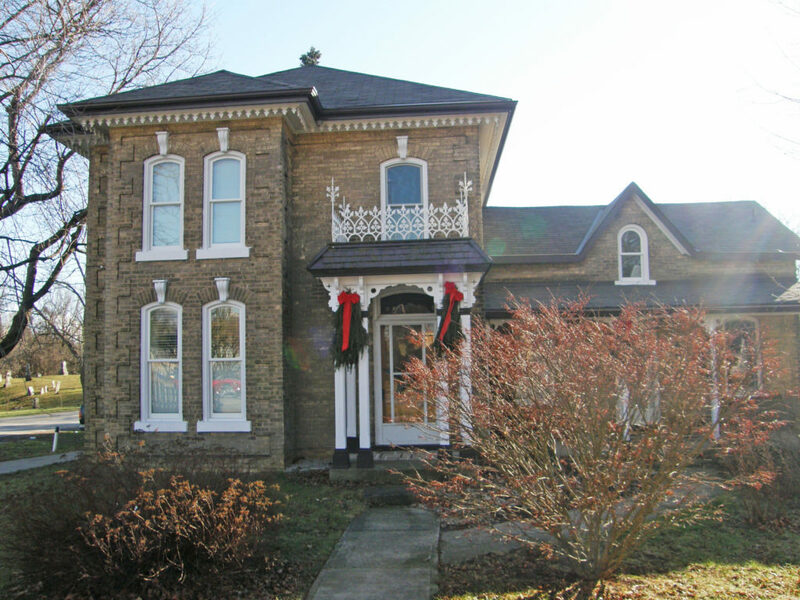 320 St. John Street West – c. 1881 – designed by Canadian architect, Henry Langley – high Victorian style – built for Judge George Dartnell – From 1899 to 1920, it was the home of Judge Duncan John McIntyre. 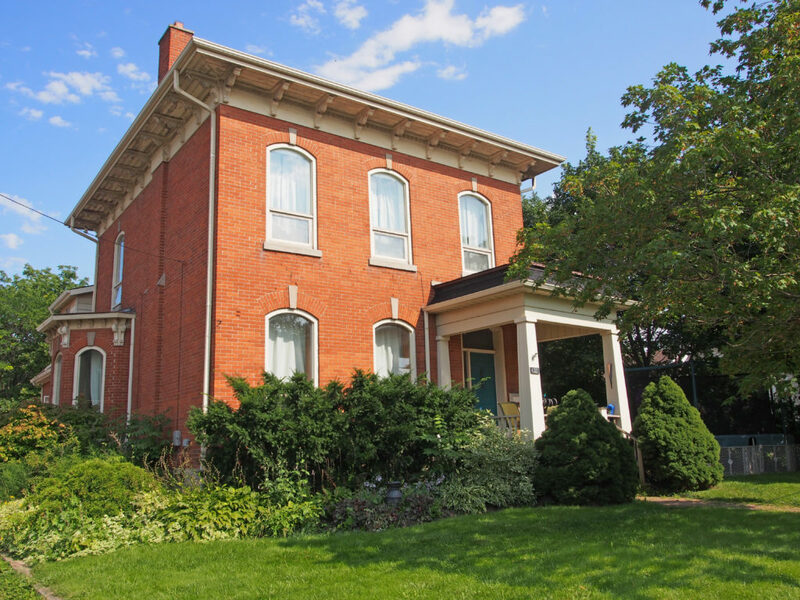 404 Dunlop Street West – c. 1888-89 – Queen Anne Revival style – asymmetrical design – built for George Ross – Mrs. Ross was president of Whitby Women’s Institute and founder of the Victorian Order of Nurses in Ontario County. 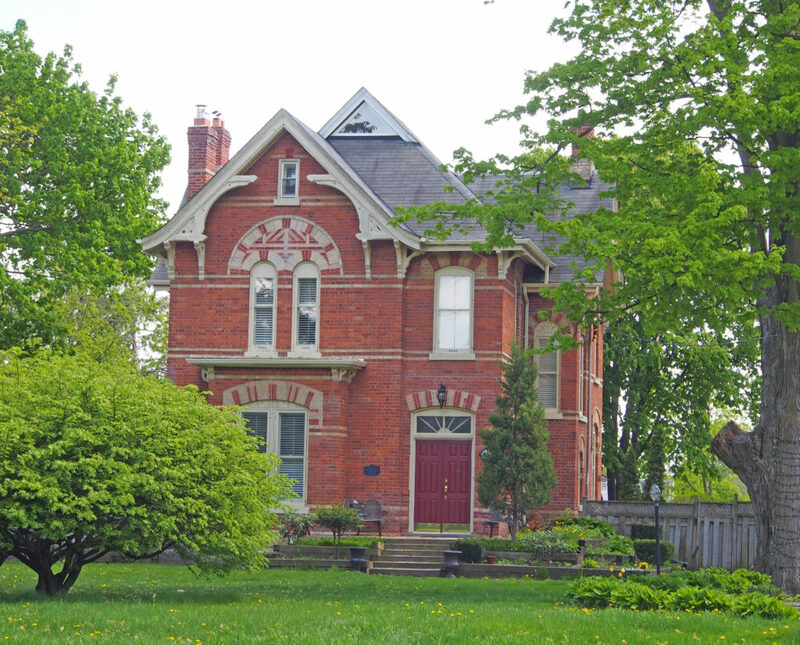 Flamborough is a former municipality in the city of Hamilton. 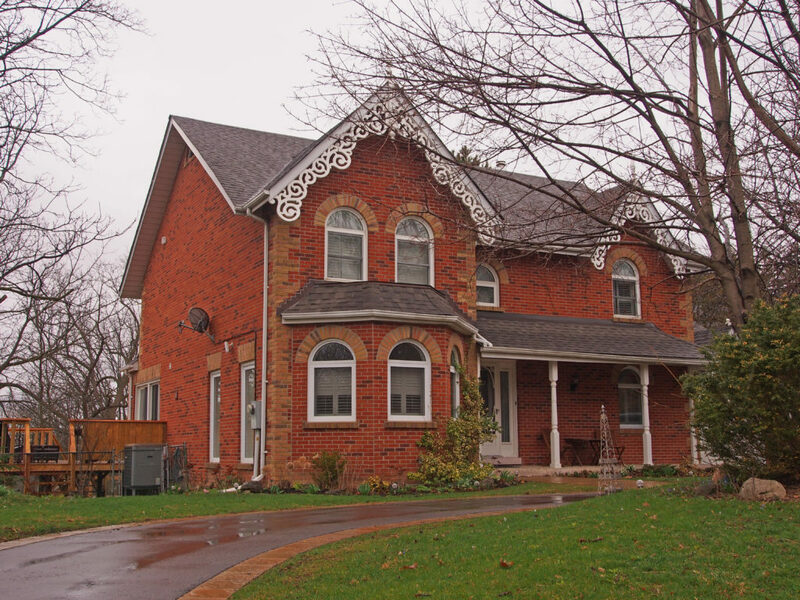 For most of its existence before amalgamation with Hamilton in 2001, Flamborough comprised the former townships of East Flamborough, West Flamborough, and Beverly, as well as the village of Waterdown. Other Flamborough communities include Carlisle, Christie’s Corners, Clappison’s Corners, Copetown, Freelton, Greensville, Lynden, Kirkwall, Millgrove, Mountsberg, Orkney, Peter’s Corners, Rockton, Troy, Sheffield, Valens, and Westover. After the American Revolution in 1783 and the creation of Upper Canada, land at the western end of Lake Ontario was surveyed and organized into townships, which included East Flamborough, West Flamborough and Beverly. Governor’s Road (also known as Queen’s Highway 99) was built on the border with neighboring Ancaster Township linking York (later Toronto) and London. 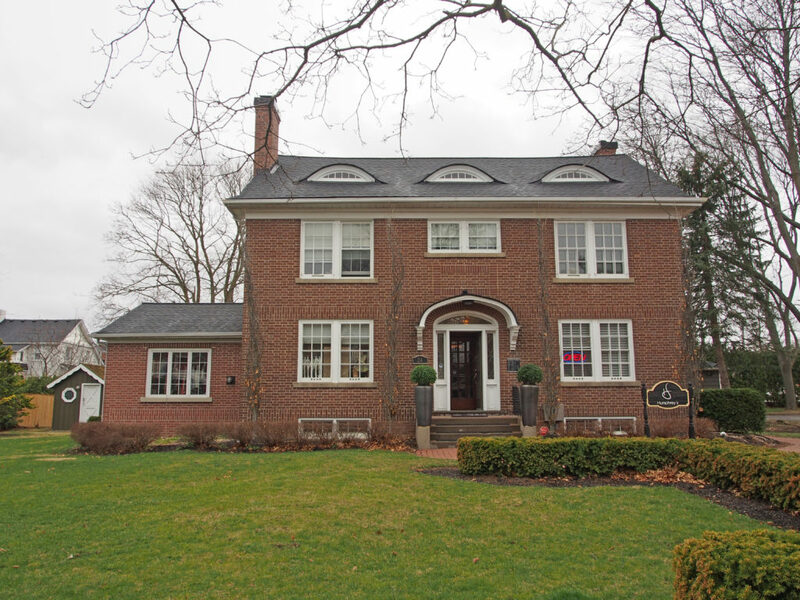 In 2001, the provincial government amalgamated Flamborough with Ancaster, Dundas, Glanbrook, Stoney Creek and Hamilton into the City of Hamilton. 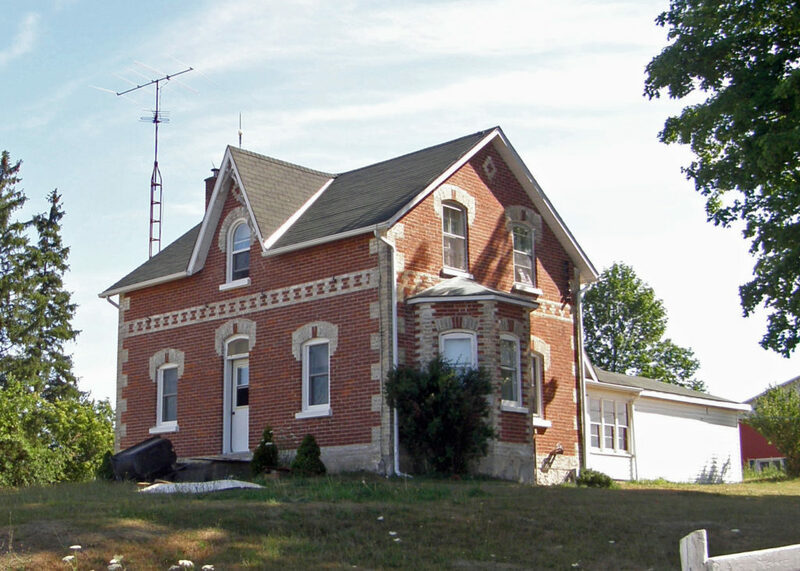 Copetown is a rural neighborhood located east of Brantford. William Cope, a United Empire Loyalist from the state of New York settled here in 1794. Jerseyville was initially settled by United Empire Loyalists from New Jersey in the late 1770s. The Brantford to Hamilton rail trail passes through Jerseyville in place of the old train tracks. 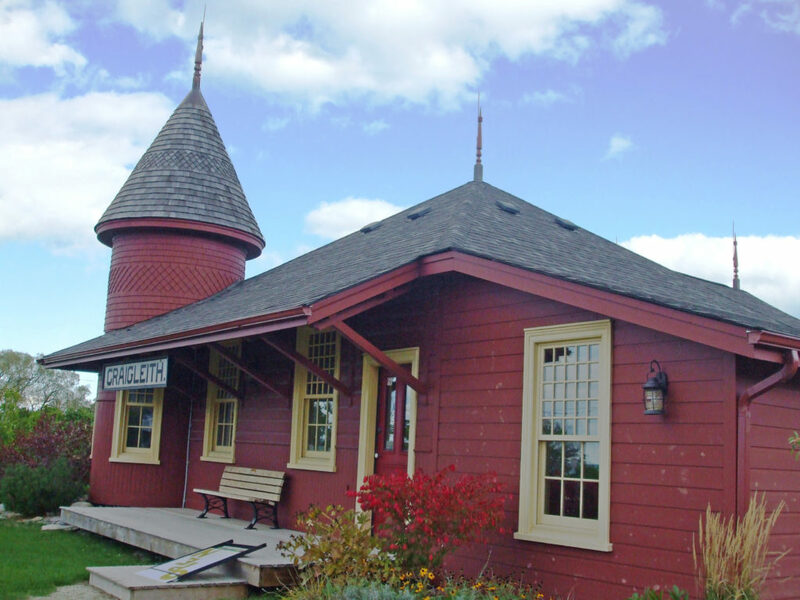 The original Jerseyville train station building can be found at Westfield Heritage Village in Rockton. There used to be a train station in Lynden that went to Hamilton. Currently Lynden has many farmers, small business entrepreneurs and commuters to Hamilton, Cambridge, Dundas, Brantford and Toronto. 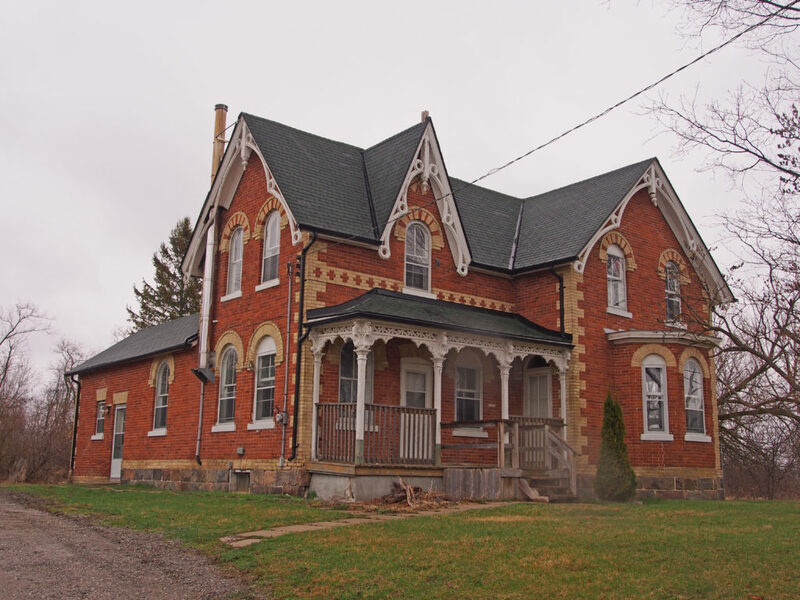 West Flamborough – 252 Highway 8 – McKinlay-McGinty House c. 1848 – Classical Revival architectural style – The front entrance is screened by four Tuscan wooden columns. The main door is flanked by pilasters of ashlar limestone set on a plinth and surmounted by a limestone lintel carved to simulate a rusticated voussoir. The door frame is flanked by sidelights with a four-light transom above. Above the entrance there is a Palladian-inspired window, set within an elliptical arch, with a central semi-circular headed window with Gothic glazing bars, flanked by a pair of lancet windows showing the growing influence of the Picturesque and early Gothic Revival movement. 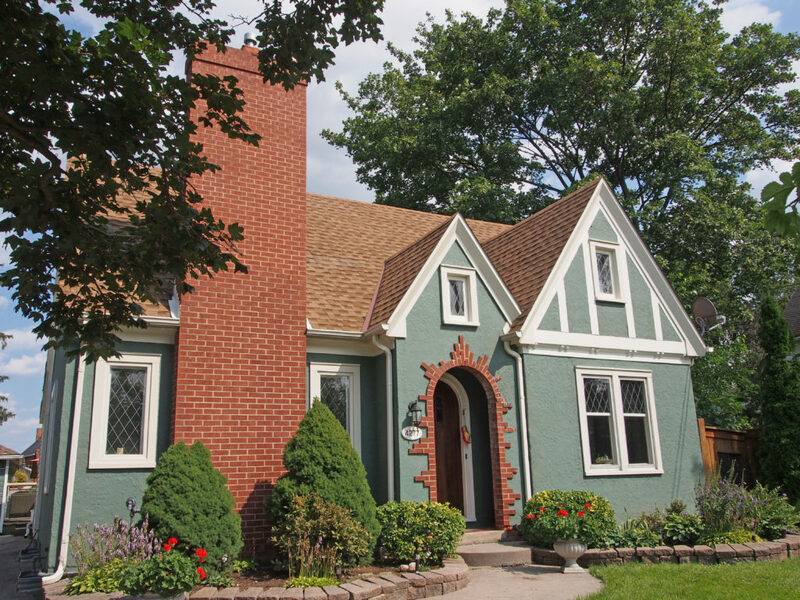 Above this window is a recessed yellow brick lozenge pattern detail below a low gable with return eaves. The front windows have shutters and rusticated voussoirs. 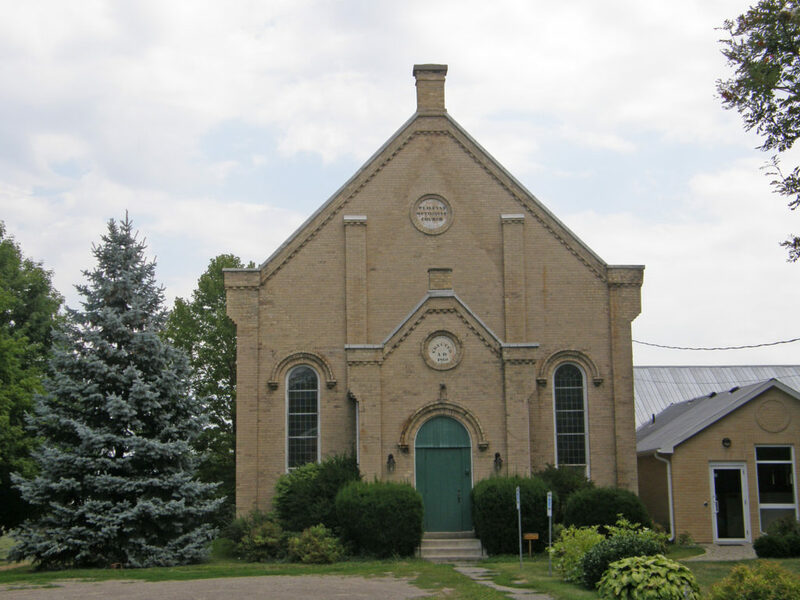 Chatsworth is a township in south-western Ontario in Grey County located at the headwaters of the Styx, Saugeen, Sauble, Bighead, Spey, and the old Sydenham Rivers. 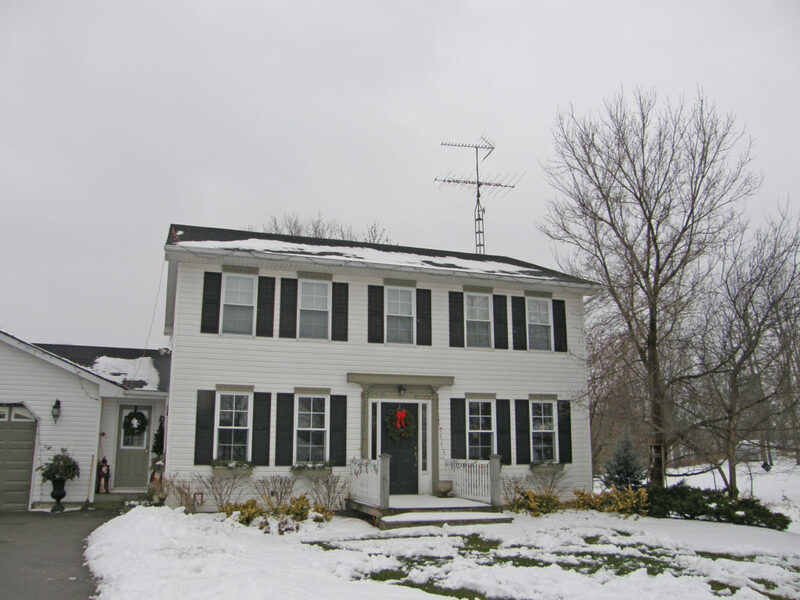 The current township was formed on January 1, 2001 with the amalgamation of Holland Township, Sullivan Township, and the village of Chatsworth. The first white settlers arrived in this area in the early nineteenth century. Canadian suffragette and activist Nellie McClung was born in the town of Chatsworth. The Sullivan Township area has a large Amish population. The township includes the town of Chatsworth, Arnott, Berkeley, Desboro, Dornoch, Glascott, Grimston, Harkaway, Hemstock Mill, Holford, Holland Centre, Keady, Keward, Kinghurst, Lily Oak, Lueck Mill, Marmion, Massie, Mooresburg, Mount Pleasant, Peabody, Scone, Strathaven, Walters Falls, Williams Lake, and Williamsford. Chatsworth is located south of Owen Sound and north of Durham where Highways 6 and 10 merge. The village neighbors Williamsford, Dornoch, and Desboro. The name of the town comes from Chatsworth House in Derbyshire, England near the home town of the postmaster. Chatsworth was founded in 1848 at the northern terminus of the Toronto-Sydenham Colonization Road. Modern Highway 10 follows most of the original road’s route. 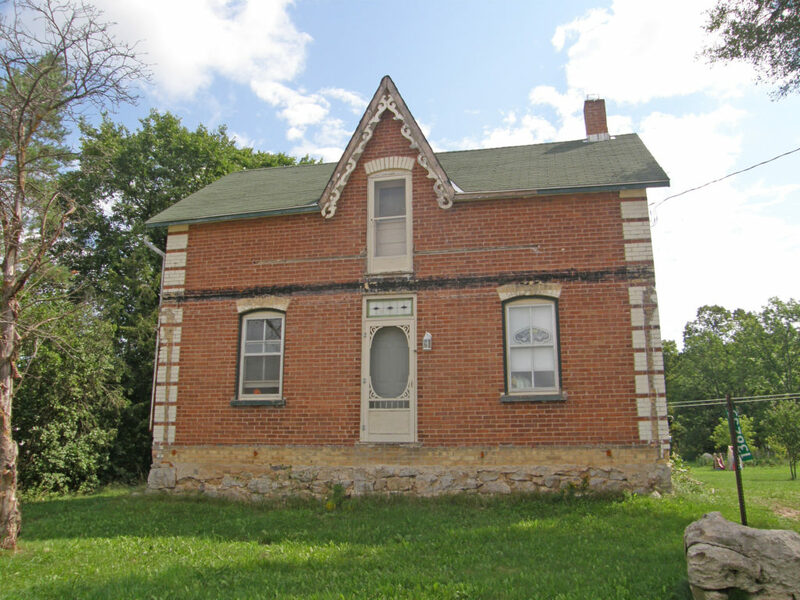 The first building in the village of Desboro in 1856 was a log school house. The area was originally called Brown’s Corners. At some point its name was changed to Donnybrook and then to Desborough after a village in central England. 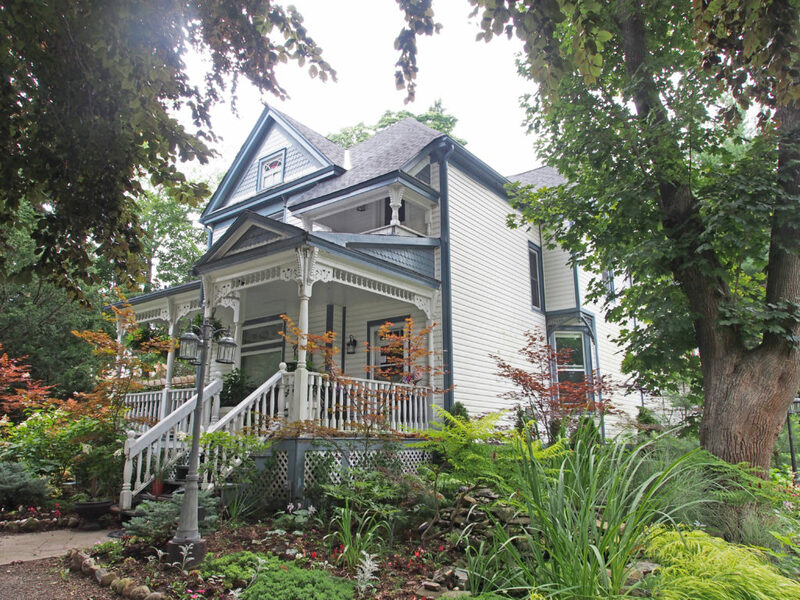 The first house and store were built in 1866 by George Smith. 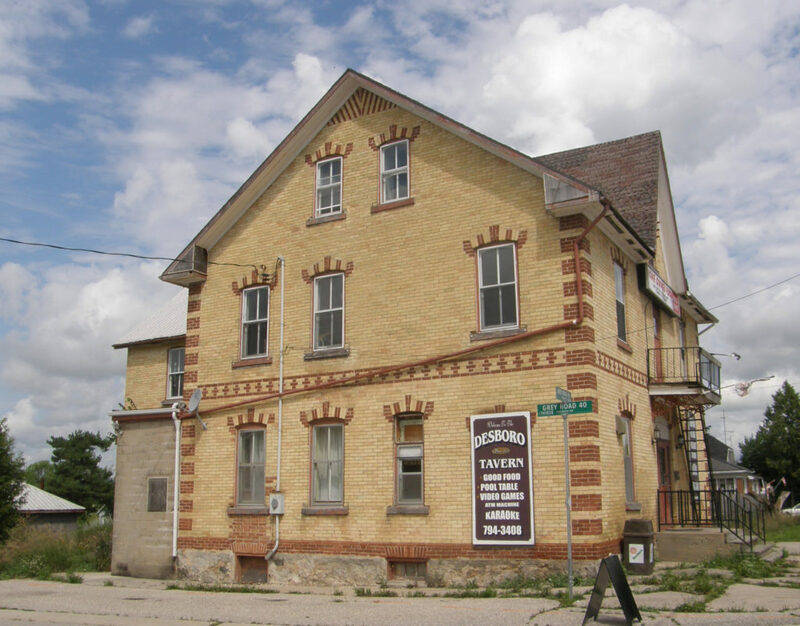 The Desboro hotel was built in 1869 and was one of the only rural taverns still operating in the township before it closed in 2011. 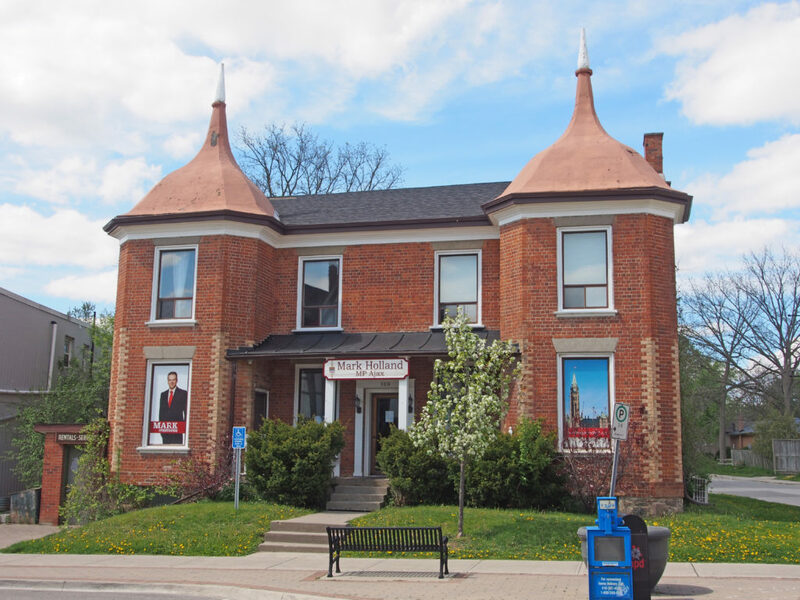 The town hall was built in 1875 and enlarged to a two-storey building in 1950. Desboro is about 13 kilometers west of Chatsworth and Williamsford. 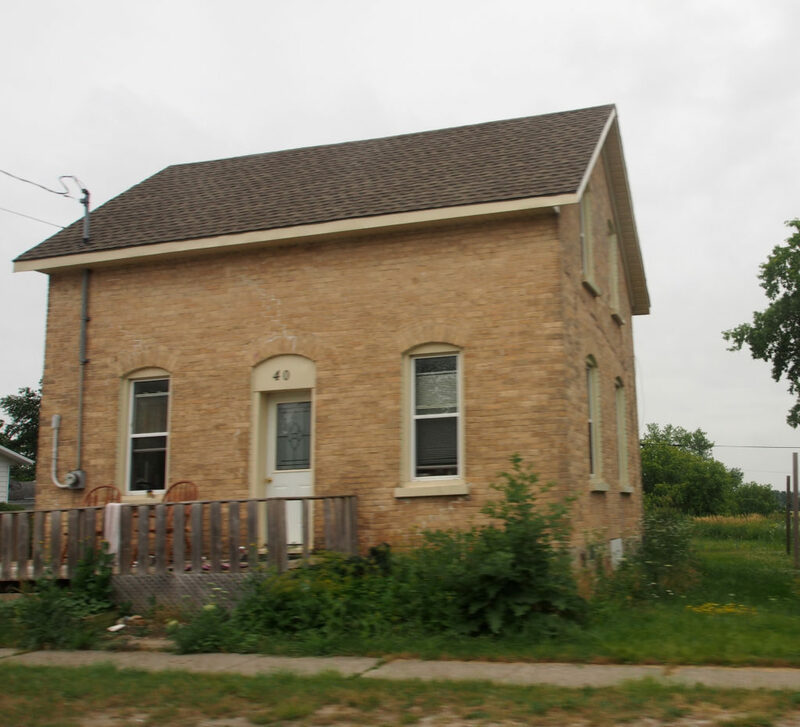 Keady is a small farming village, located at the intersection of Grey Roads 3 and 16. Keady saw its first settlers in the 1850s. 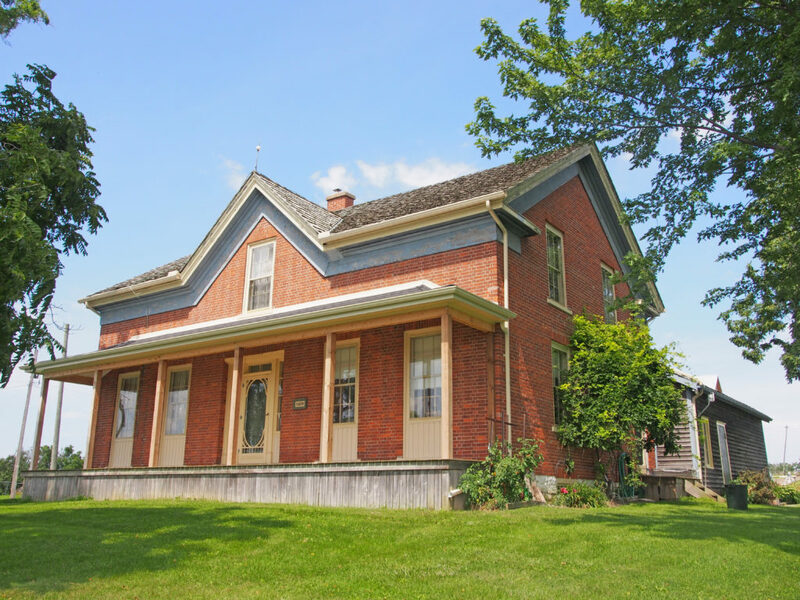 The original general store was built in the late 1860s and operated for almost 100 years before being converted into a residence. 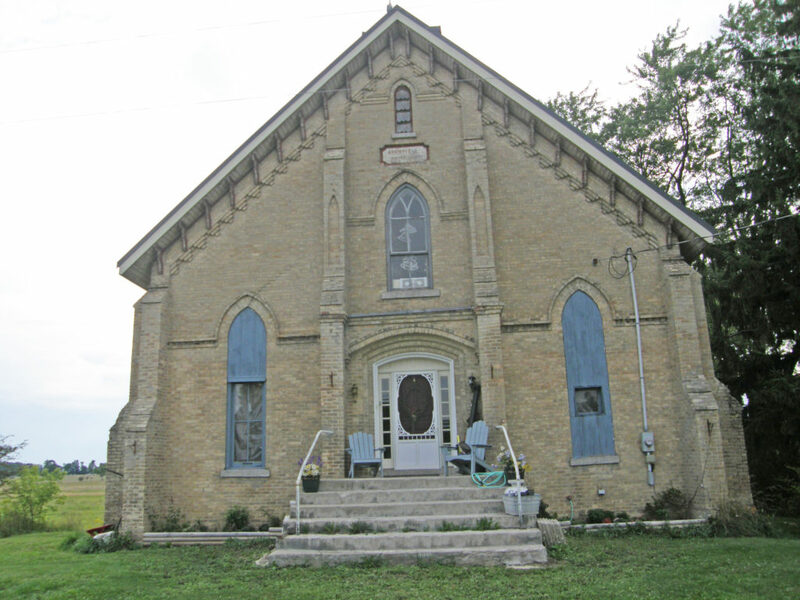 It has a Community Centre, licensed mechanic, livestock market, machine shop and a United Church, and is home to about 200 people. Keady is well known in the area for the weekly summer farmer’s market and numerous functions held at the Keady Community Centre. The village of Dornoch was settled by Bartholomew Griffin in 1841 when he encountered a crossroads that appealed to him. The area was originally called “Griffin’s Corners” after Griffin started the first general store. In the late 1850s the village was served by a stage coach that was running between Durham and Chatsworth. Around the turn of the century, the name was changed to Dornoch after the village in northern Scotland. The community center was built in 1952 and still serves Dornoch. 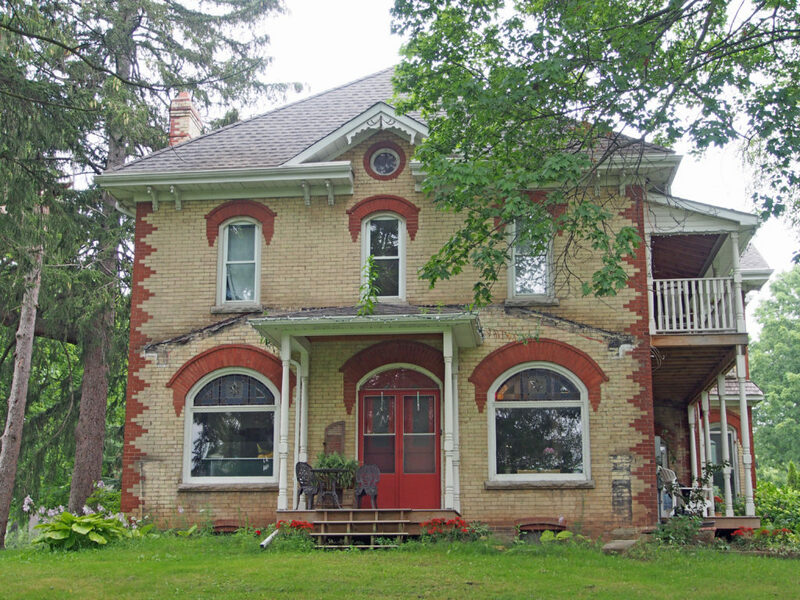 Dornoch is situated between Williamsford and Durham on Highway 6 and is 33 kilometers south of Owen Sound. Williamsford is a village on the North Saugeen River. 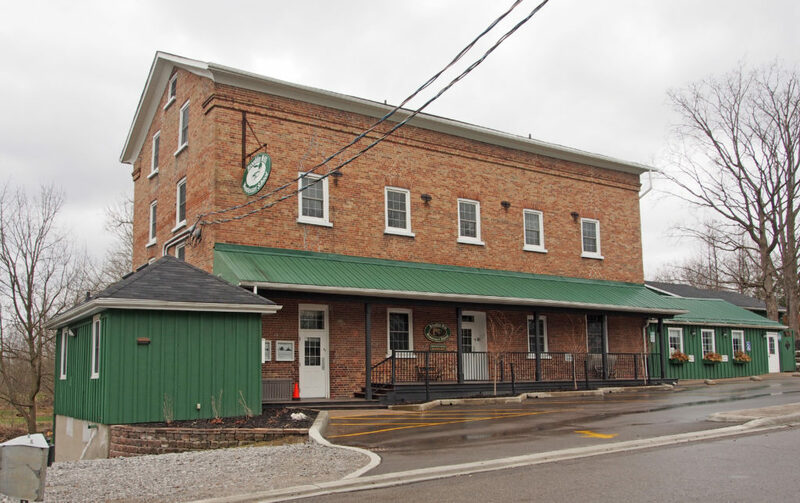 It has a general store, post office, a bookstore and restaurant housed in a historic grain mill. A small dam controls the river. It has several churches, and a community cemetery. 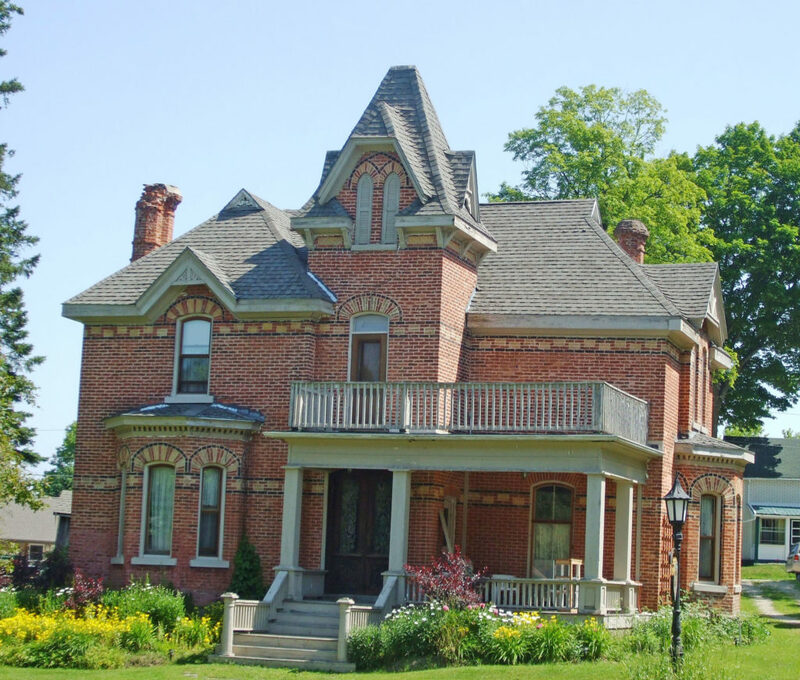 It is located on Highway 6 between Durham and Owen Sound. 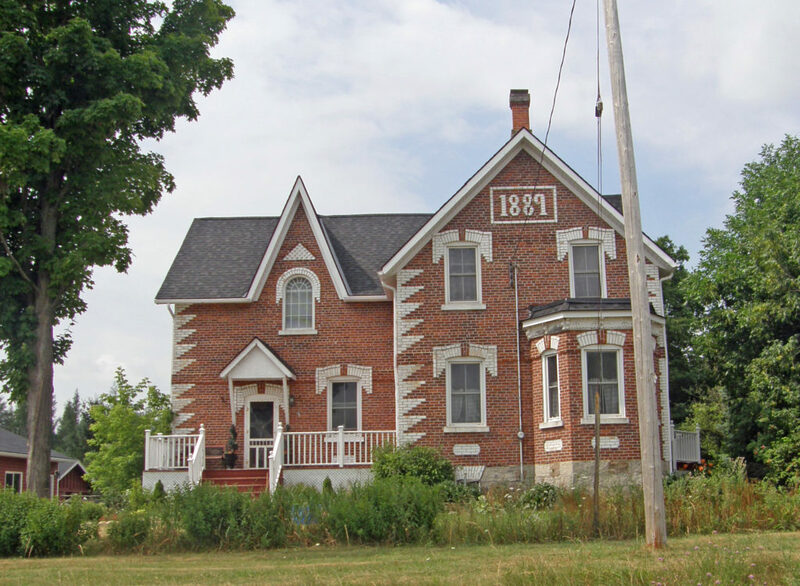 The village of Williamsford was first surveyed in 1858 comprising 400 acres in preparation for a railway which was to run from Toronto to Owen Sound. The post office was built in 1847 and the general store was built in the late 1800s. At the south end of the village sit the community centre grounds with a playground, a baseball diamond and a curling rink. The curling rink was completed in 2010 and has a lounge and two rinks. West Grey is a township in western Ontario in Grey County spanning across the River Styx, the Rocky Saugeen River, the Beatty Saugeen River, and the South Saugeen River. Unlike most rural communities, West Grey maintains its own police force, the West Grey Police Service. The municipality was formed on January 1, 2001, when the former Townships of Bentinck, Glenelg, and Normanby, the Village of Neustadt, and the Town of Durham were amalgamated in a county-wide reorganization. Elmwood is one of the communities in this township. 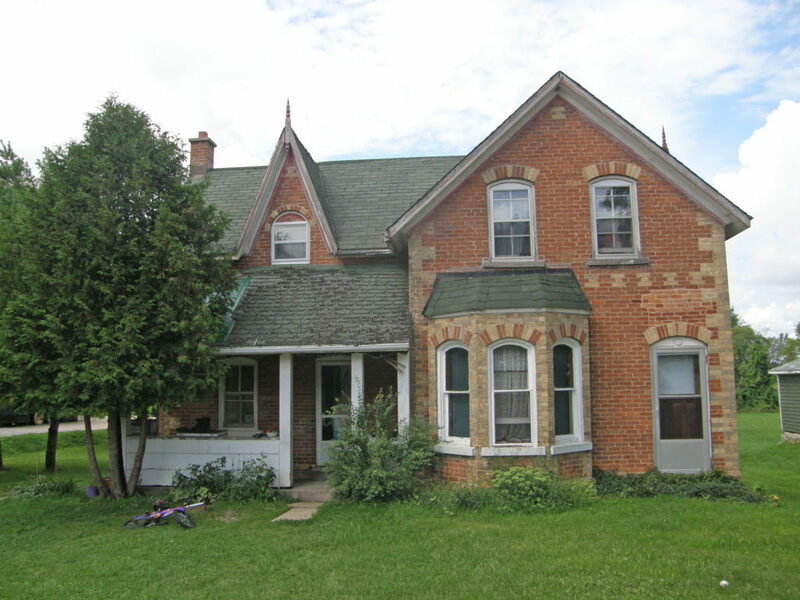 Elmwood is a village in Grey County on the county line between Bruce and Grey, about six miles (10 kilometers) north of Hanover. 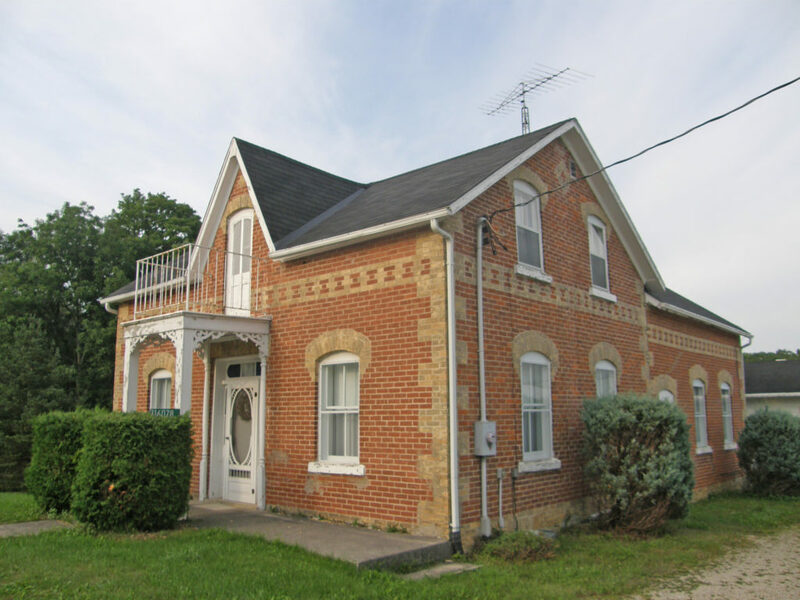 It was a location in which Mennonites were to be found from before 1870, when ministers from Waterloo County were sent to Brant Township every eight weeks to conduct services which alternated in the homes of Mennonite families living there. 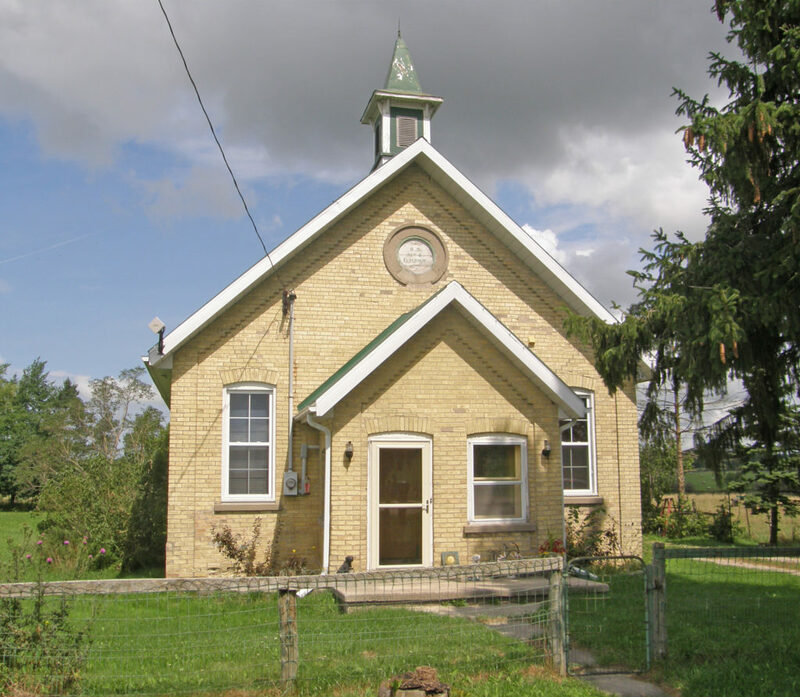 In 1875, when the Mennonite Brethren in Christ (MBC) were organized in Ontario, Elmwood was one of their earliest places of worship. It was the village into which the retired farmers moved when they left the farms in that community. Duncan is located south of Thornbury. Euphrasia is a former township in Grey County. Since 2001 it is a part of the municipality of Grey Highlands. 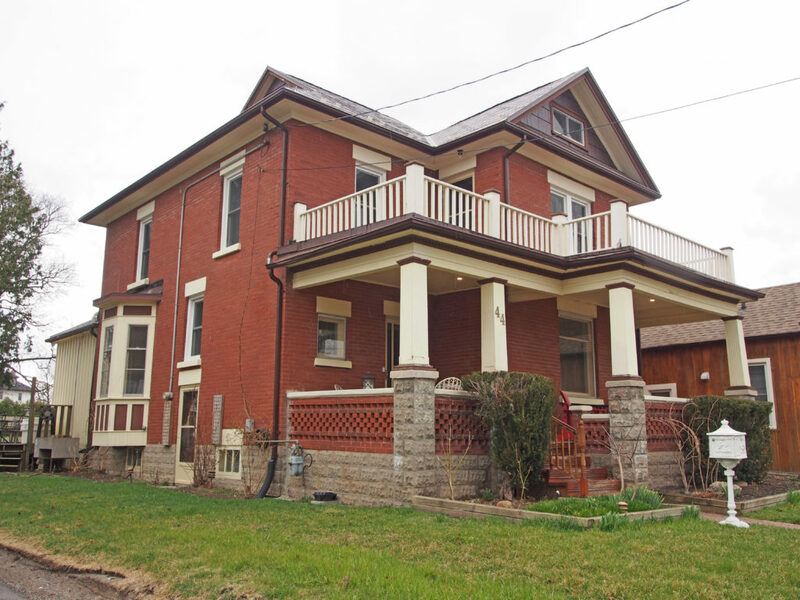 Euphrasia is located east of Beaverdale, north of Wodehouse and southwest of Beaver Valley. Euphrasia has an elevation of 433 meters. Markdale is a community in Grey County. 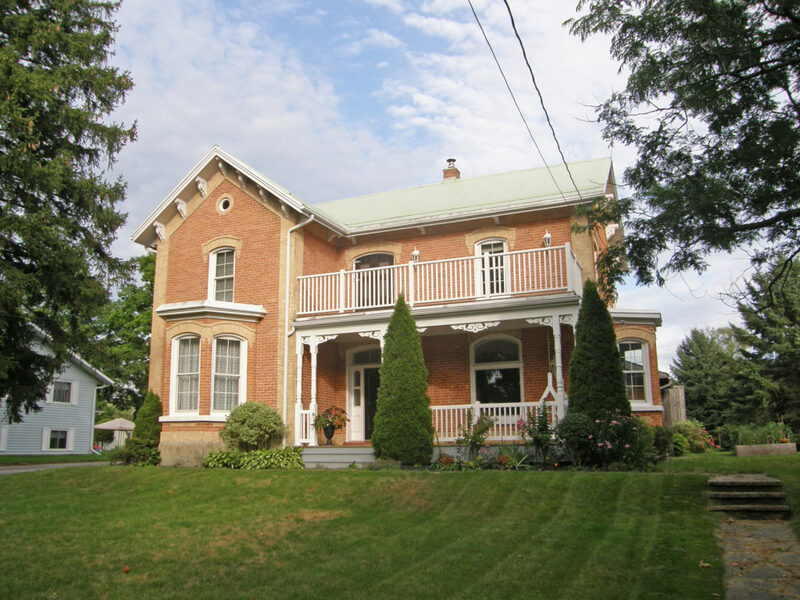 Markdale was first settled in 1846. In 2001, Markdale was amalgamated with the townships of Artemesia, Euphrasia and Osprey to form Grey Highlands. On August 20, 2009, an F2 tornado originating in Durham touched down in Markdale and caused some local damage. 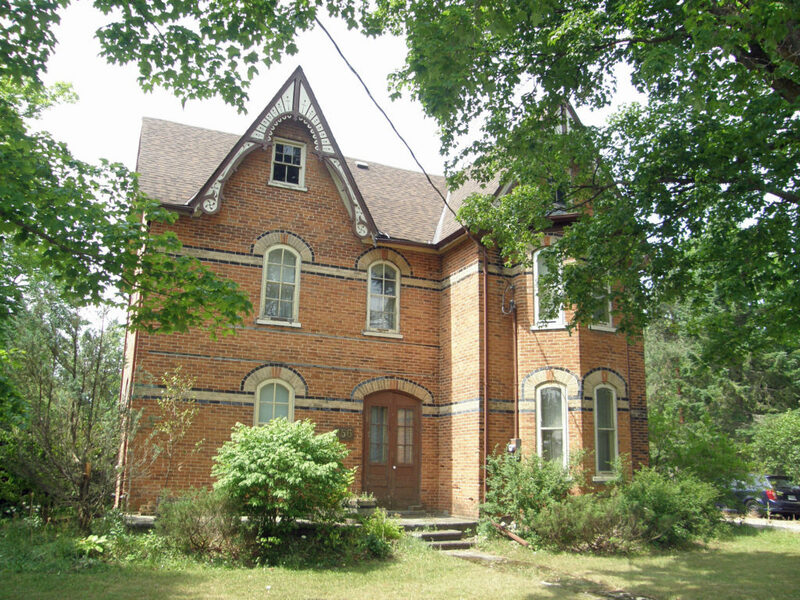 Arkwright was an important community in the early days of Bruce County’s history. First settled in the 1850s, it gained prominence as both a supply centre and busy stopping place along the stage route. At its height Arkwright boasted two hotels, two stores, a wagon shop, two blacksmiths and a physician. A sawmill was located close by. 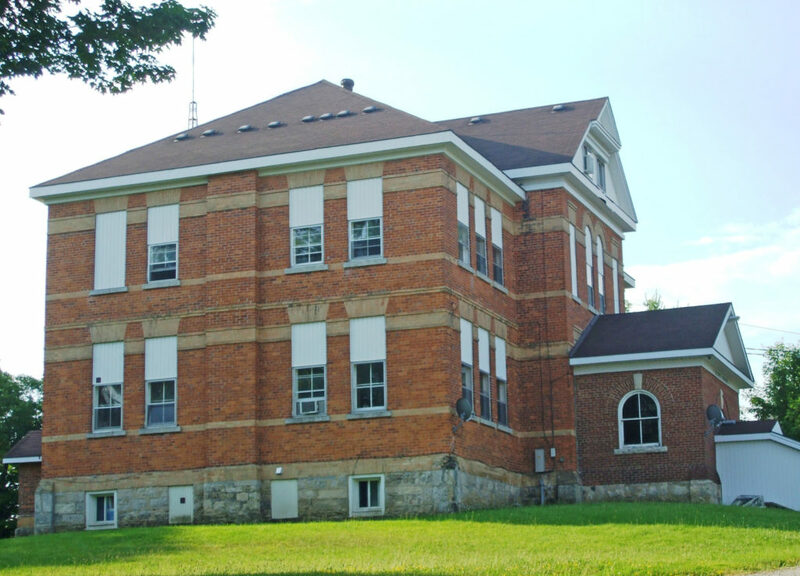 There was also a school and two Methodist churches that later merged. A post office operated from 1857 to 1915 in one of the general stores. Arkwright served as the seat of township government for many years. Lack of a railway prevented Arkwright from attracting any major industries. 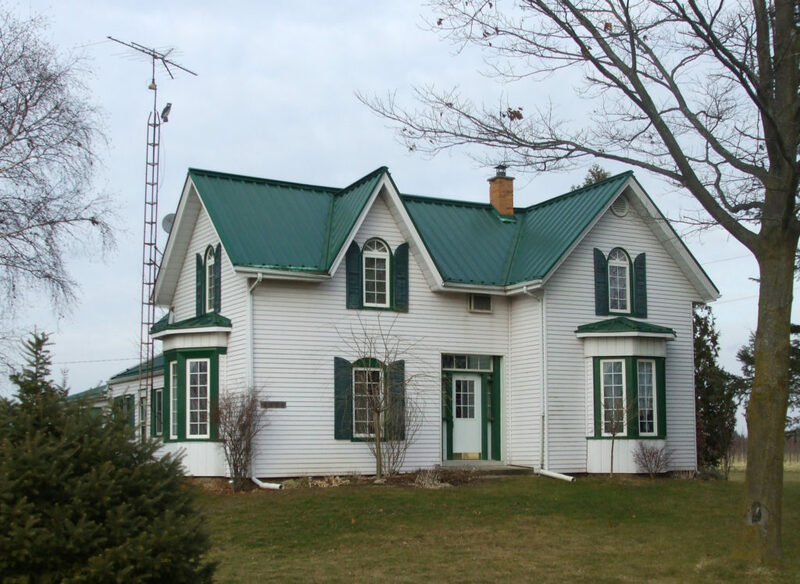 Tara is located in the municipality of Arran-Elderslie in Bruce County and is located on the Sauble River. Tara was named after a town in County Meath, Ireland which served as the seat of Irish royalty. Soon after the survey of the township was completed in 1851, John Hamilton and Richard Berford, early settlers in the area, located here along the river. The opening of the Owen Sound Post road stimulated the growth of a small community. Situated in a rich agricultural region with abundant water power, the settlement developed quickly. By 1861 Tara had saw and grist mills, a foundry producing agricultural implements, wagon works and a tannery. Hamilton opened a hotel to serve the incoming settlers of the surrounding townships. A post-office opened in 1862. In 1880, the local newspaper, The Tara Leader was first published. 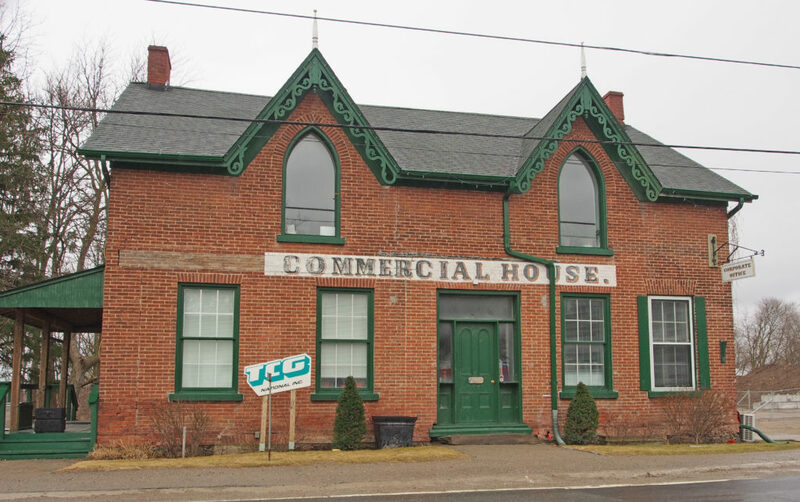 Tara became a thriving commercial and manufacturing center and, in anticipation of the arrival of the Stratford and Huron Railway, it was incorporated as a village on January 1, 1881. 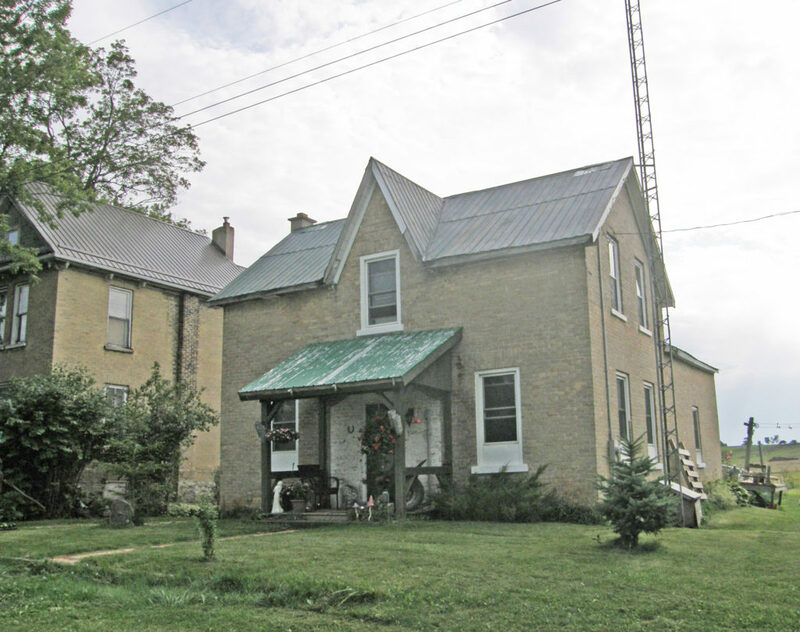 Williscroft was a farming hamlet, located in Bruce County, first settled around 1850. By 1856 it had a post office, followed by a school in 1858. The village quickly grew to include a blacksmith shop, a store, two coopers, a door and sash building business, and saw and grist mills. A Baptist church was added in 1875. Later industries in Williscroft included a cheese factory and woodworking and carriage shops. 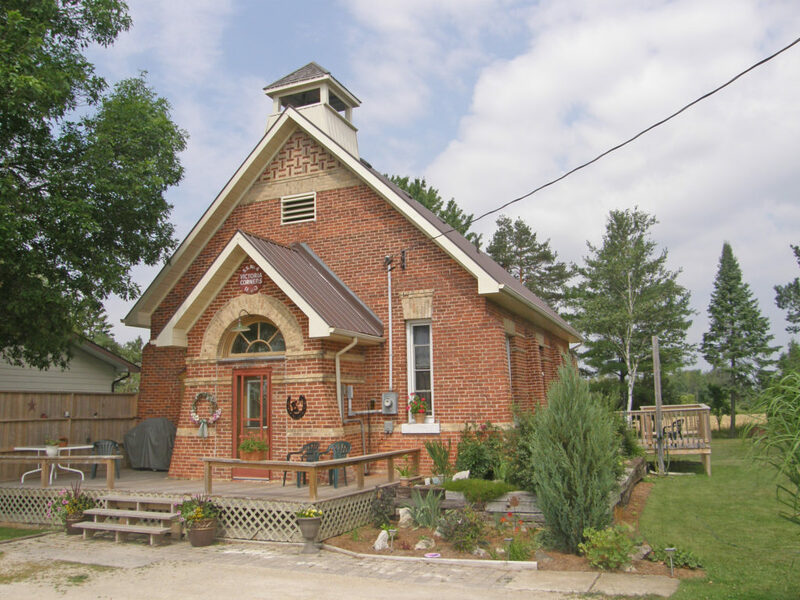 Farm based organizations, which took hold during the 1880s, led to the construction of a large Grange Hall, also used as a community and social center, and later as an Orange Lodge. The Beaver Valley is located in southern Ontario at the southern tip of Georgian Bay. The Beaver River flows north through the valley emptying into Georgian Bay in the town of Thornbury. It is a productive agricultural area producing 25% of Ontario’s apple crop on 7,500 acres of apple orchards. The main towns in the valley from Flesherton at the south end are Kimberley and Thornbury. Grey Road 13 follows the meandering Beaver River along the valley floor. It rises briefly before crossing the river again at Heathcote. Clarksburg, the hidden gateway between the picturesque backroads of the Beaver Valley, the slopes of the Blue Mountains, and the shores of Georgian Bay, is located just south of Thornbury on Grey Road 13. The Beaver River cascades through a series of picturesque rapids from Clendenan Dam through the village and north to Georgian Bay. In 1858 William Jabez Marsh travelled from Holland Landing to purchase 500 acres of Crown land adjacent to the village of Thornbury. After choosing a location for his own farm, he donated 2.5 acres for the building of a church and rectory. 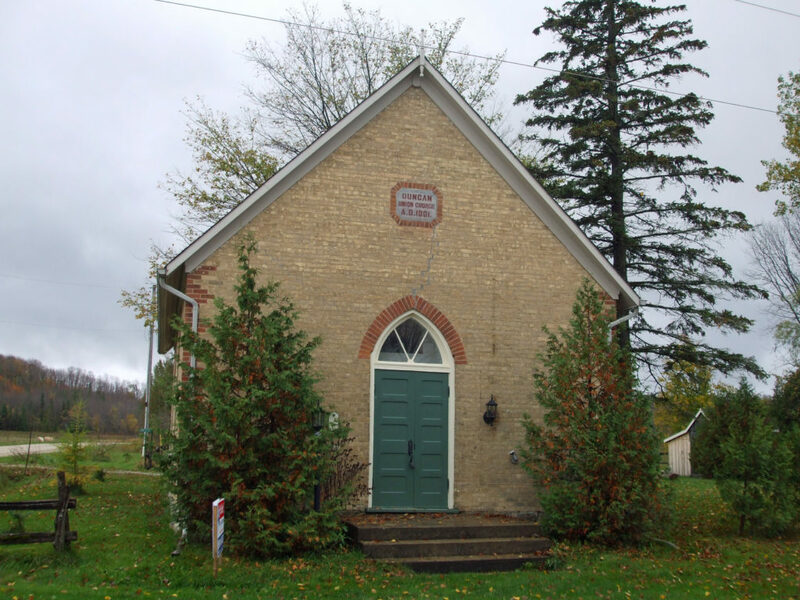 The first church was a frame building erected in 1863 and named St. George’s and was located in the newly established village of Clarksburg immediately adjacent to the border with Thornbury in order to serve both municipalities. The original church served until 1899 when it was replaced by the present brick structure erected on the same site. 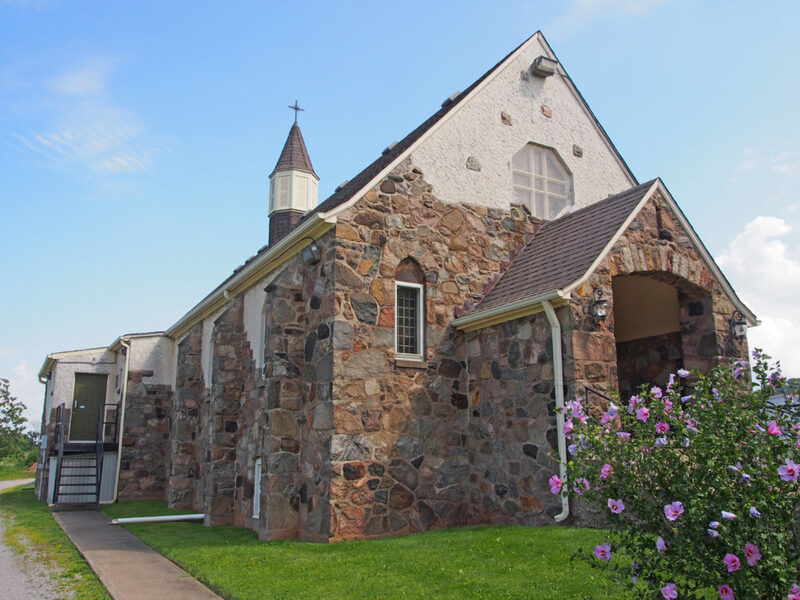 Once the brick church was completed, the original frame building was dismantled and transported in mid-winter by horse-drawn sleighs to Beaverdale where it was reassembled and continued to serve the congregation there for another 50 years. 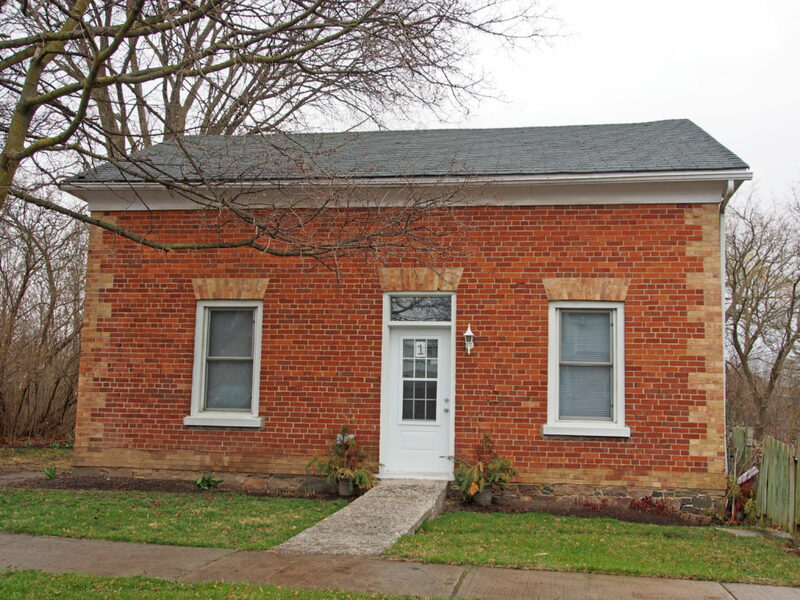 The brick rectory next to the church was built in 1867 and has been well maintained. Markdale is located on Highway 10 north of Flesherton. 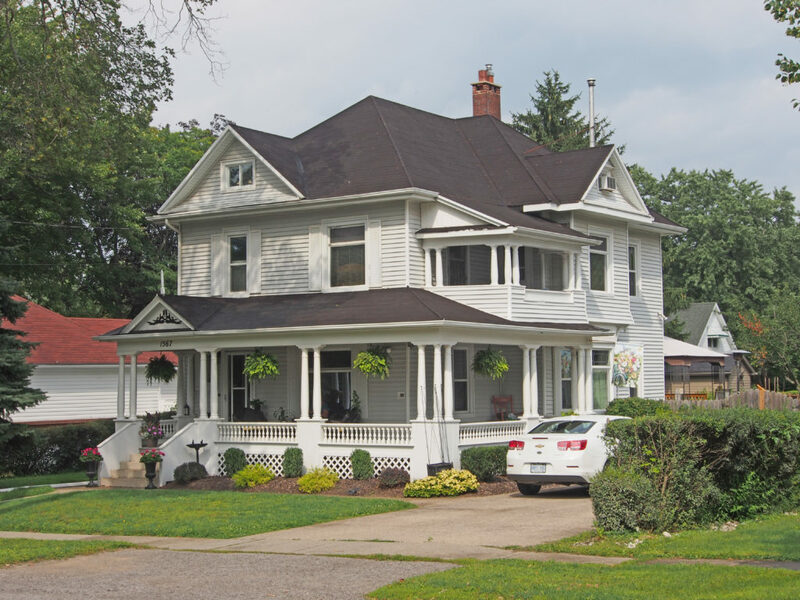 Settlement began in 1849, and it was incorporated as a village in 1888 with a thriving business center, three churches, a bank, a school, a wagon shop and a drug store. The beautiful Beaver Valley lies just a few miles to the east of Markdale. Craigleith is located east of Thornbury on Georgian Bay. The name is Gaelic meaning rocky bay and the town was given the name by Andrew Craig Fleming, one of the community’s earliest settlers. 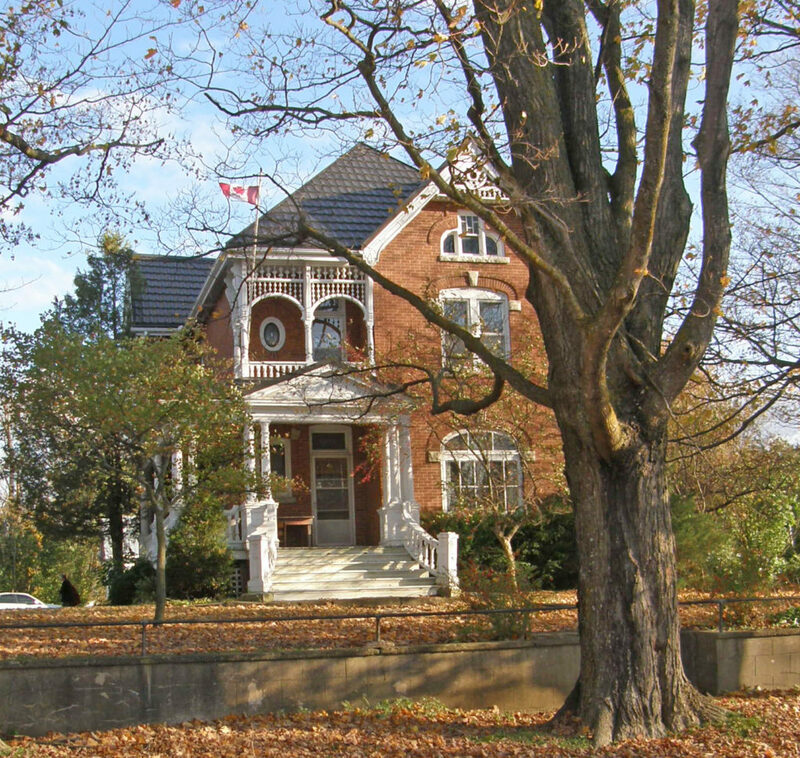 Craigleith was the home of Sir Sandford Fleming who contributed to the establishment of standard time earning him the title of “The Father of Standard Time.” Fleming also designed the first Canadian postage stamp; issued in 1851, it cost three pennies and depicted the beaver, now the national animal of Canada. 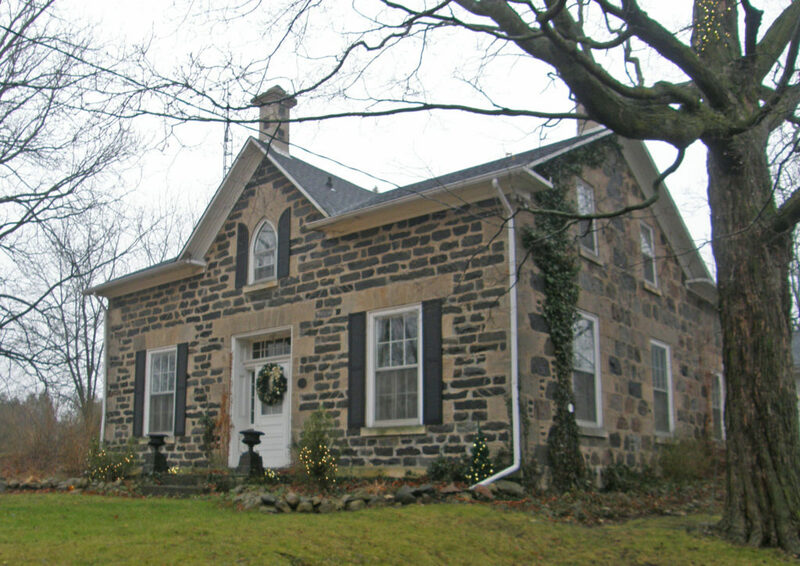 The Sanford family began operating a quarry and lumber mill in Craigleith which provided essential building materials to their new settlement. On November 24, 1872 the steamer “Mary Ward” ran aground two kilometers offshore as she was traveling from Sarnia to Collingwood. A group of local fishermen rescued those remaining on board; however, the last of three rescue boats capsized and eight passengers drowned. One of the last remaining wooden CNR stations is located here. Flesherton is located at the junction of Highway 10 and Grey County Road 4. In 1850, 25-year-old William Kingston Flesher surveyed a portion of the Township of Artemesia. The north-south Toronto-Sydenham Road and east-west Durham Road which both ran through the township, were built shortly after the survey was finished, thereby opening the area to settlement. The intersection of the two roads which lay in a small valley was named Artemesia Corners. 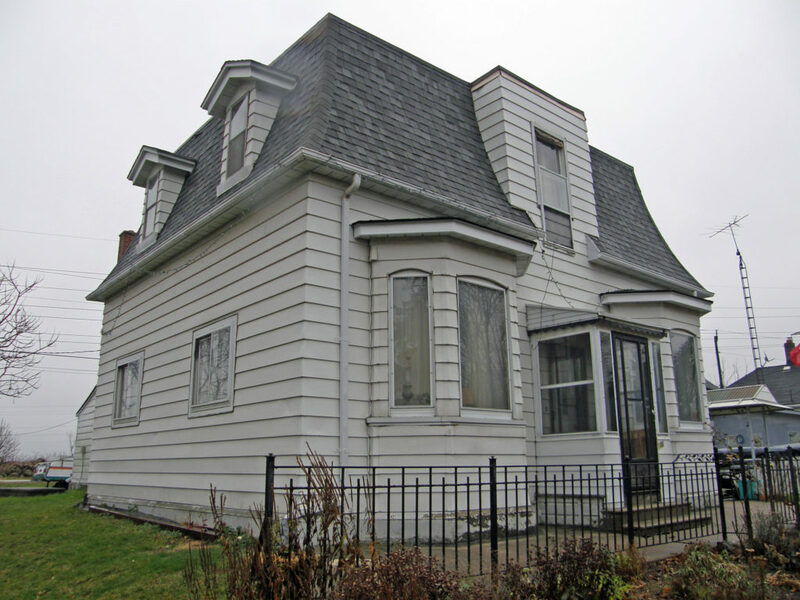 As was usual for the time, Flesher was paid for his work in property within the survey area. He chose the valley containing Artemesia Corners and laid out a portion in village lots. Aaron Munshaw arrived as the first settler and built a tavern on the southeast corner of the intersection of the two roads. In 1864 as the village grew, Munshaw built a larger inn and stagecoach stop that incorporated some parts of the original hotel. This building, operated as a hotel by the Munshaw family until the 1960s, is now known as Munshaw House and still stands on the original spot. Throughout the 1850s many Scottish immigrants arrived to claim lots and began to clear the land. 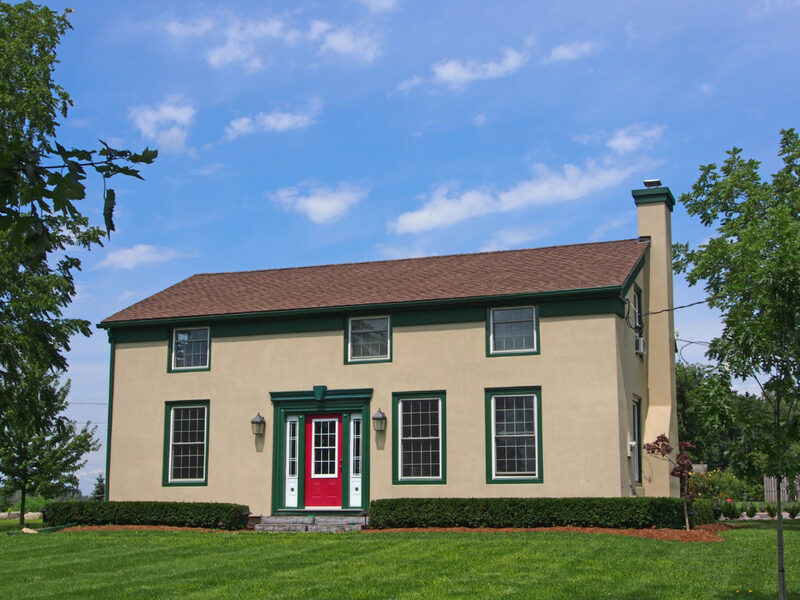 Mr. Flesher continued to develop the valley economy building a sawmill and a grist mill on the Boyne River that flowed through the bottom of the valley. He encouraged other businesses to settle in the area. In his honor, the name of the settlement was changed to Flesherton. The red brick Methodist Church was built in 1877. 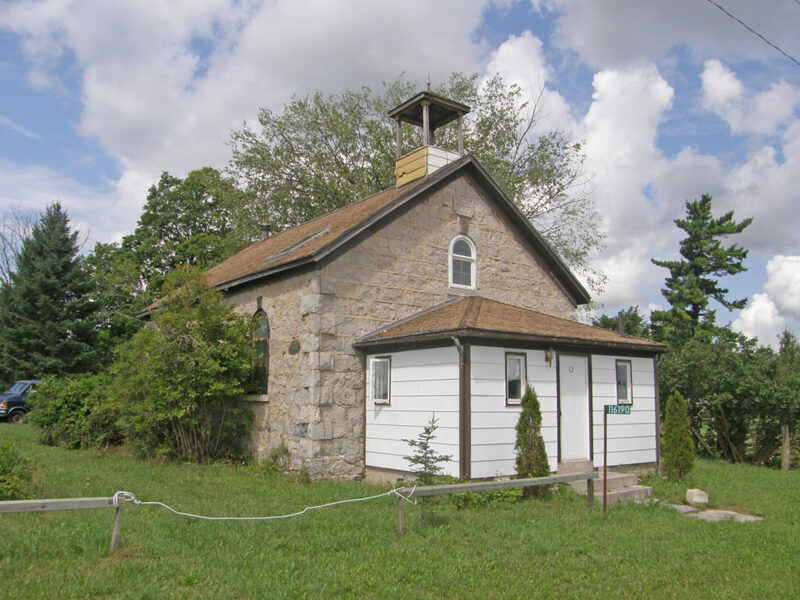 In 1879 Chalmers Presbyterian Church was built where the Toronto-Sydenham Road crossed the Boyne River. In 1926 the Methodist Church joined with Chalmers Presbyterian to form St. John’s United Church. The combined congregation chose to retain the highly visible Methodist building and sold the much smaller Presbyterian building. Leith, located on the south shore of Georgian Bay, is nine kilometers northeast of the city of Owen Sound. 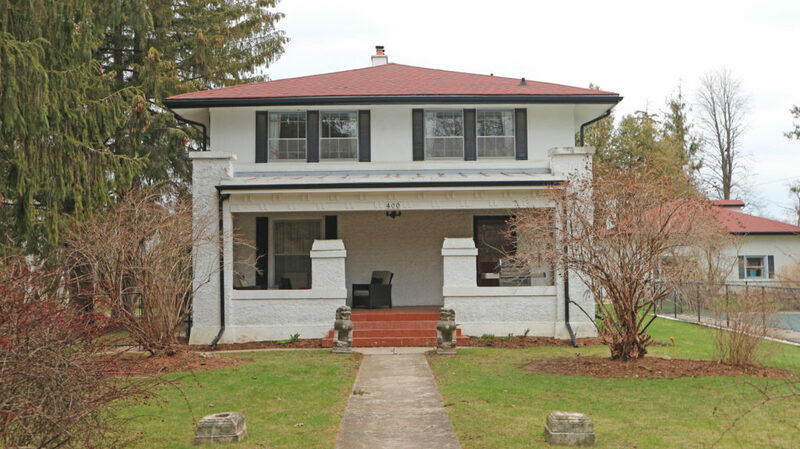 It is the boyhood home of the renowned Canadian landscape artist Tom Thomson who is buried in the pioneer cemetery behind Leith United Church. 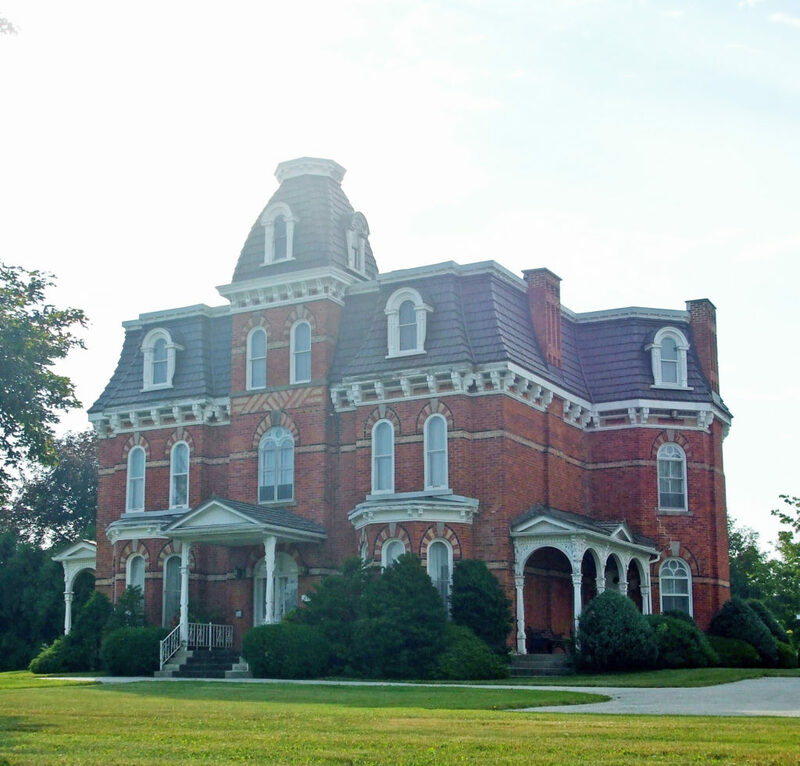 Heathcote is located in Grey County on the Beaver Road and Concession Road 13 south of Thornbury. William Fleming settled here in the 1840s and for a time the place was called Williamstown after him. That name was already in use elsewhere in Ontario, so when the post office opened in 1859, this community was called Heathcote, possibly after a place of that name in Derbyshire, England. Meaford is located on the southern shore of Georgian Bay, on Highway 26 between Thornbury and Owen Sound. In 1837 inhabitants of St. Vincent Township petitioned the government requesting that land at the mouth of the Bighead River be reserved as a landing place. In 1841 there was a saw mill, a grist mill, several roads had been constructed to the landing place, and a post office was established. The town plot of Meaford was laid out in 1845. 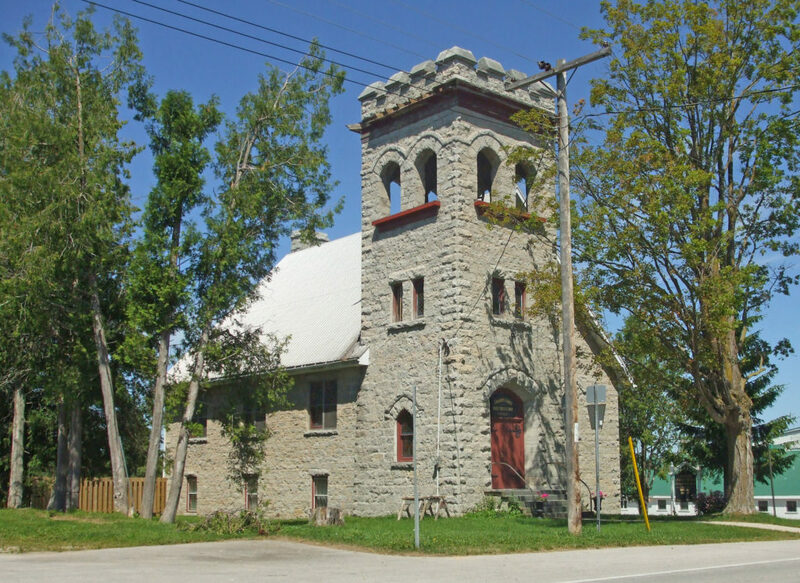 Meaford Town Hall was built in 1908-09 with Palladian lines and stately Doric columns after the original building built in 1864 had become dilapidated and was destroyed by fire on October 5, 1907. Local contractor James Sparling recycled as much of the original town hall’s brick as possible in the construction of the new building. 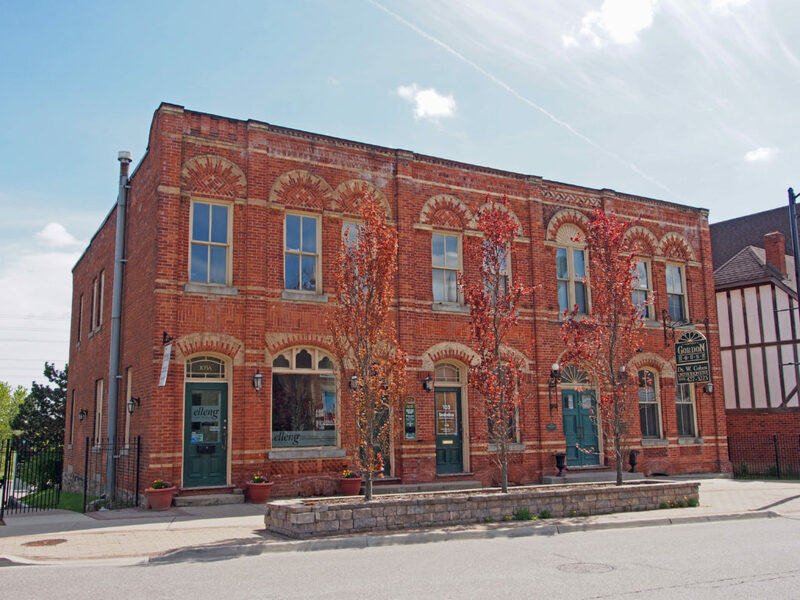 Like many public buildings across small-town Ontario, Meaford Hall was made to be more than a town hall. The building housed the council chambers and town offices. The chambers also served as a court room and there were two tiny jail cells in the basement. 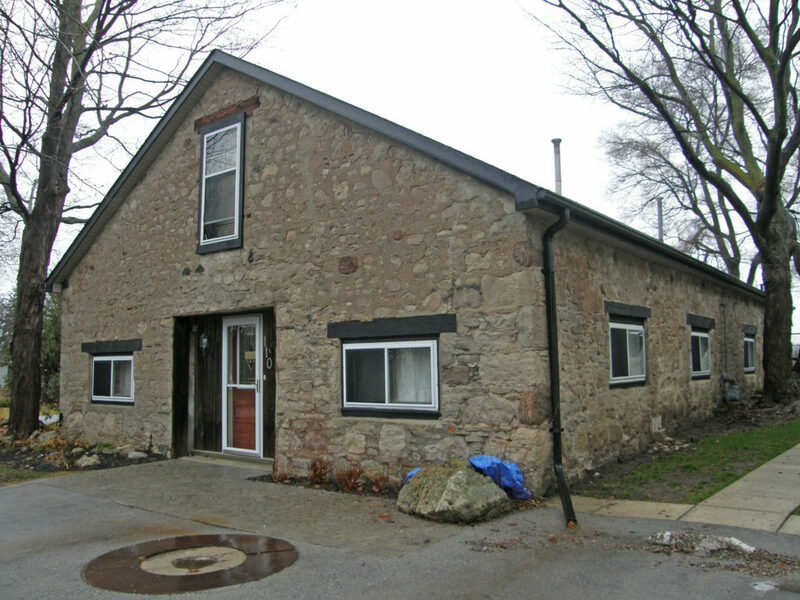 At the other end of the building was the Meaford Public Library. Farmers used the basement on market day, and the space has been used for a ballroom, meeting area, and Boy Scouts hall. 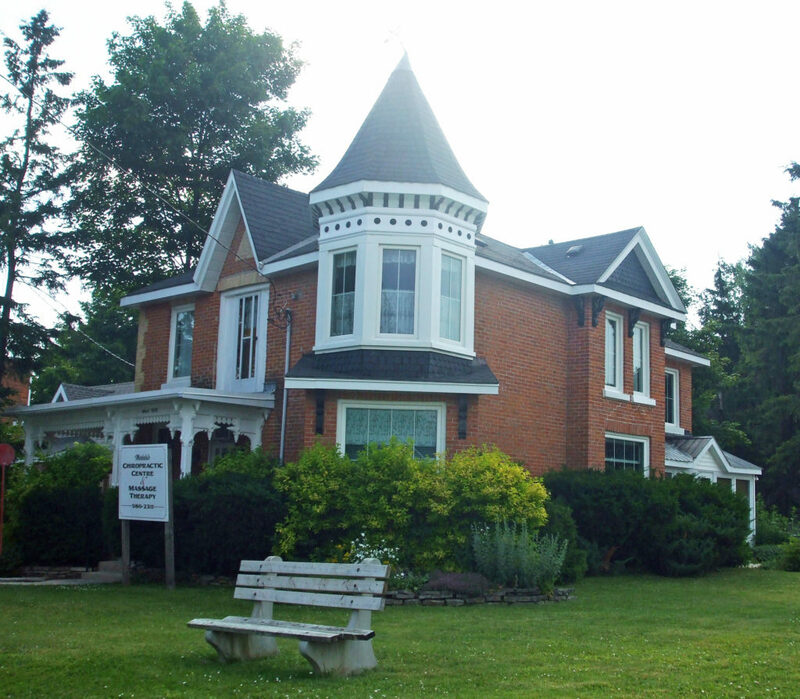 It has housed the Women’s Institute, the Meaford Quilters, a Senior Citizens’ Club, and the Senior Men’s Euchre club. 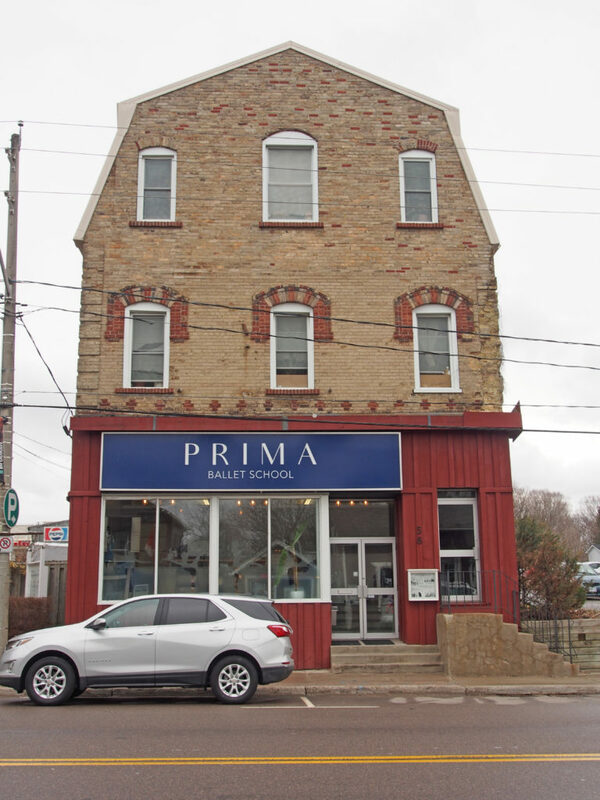 The second floor Opera House was the cultural heart of the community. Local plays, high school graduations, concerts and famous speakers have all made use of the theatre. In 1967, the library moved to a bigger space in the old post office. 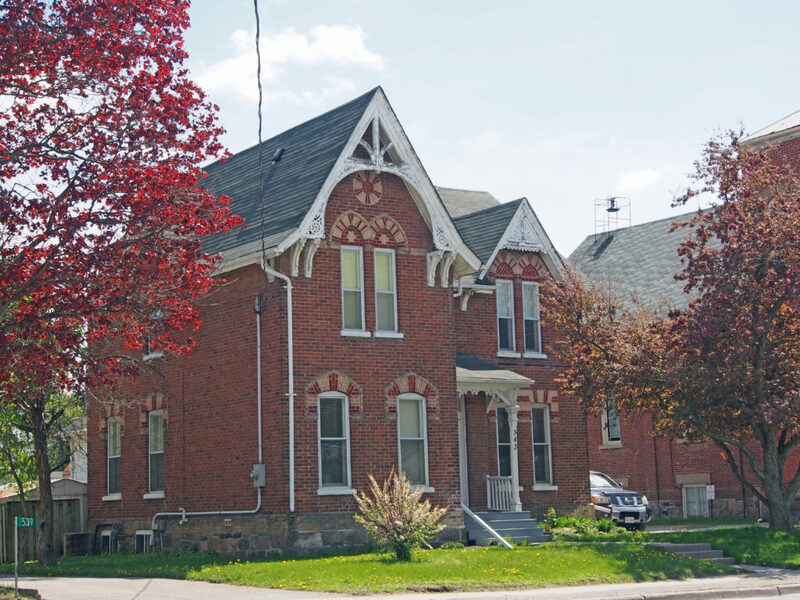 The Meaford Police Department left the hall in 1996. The town vacated the old offices in 2002. 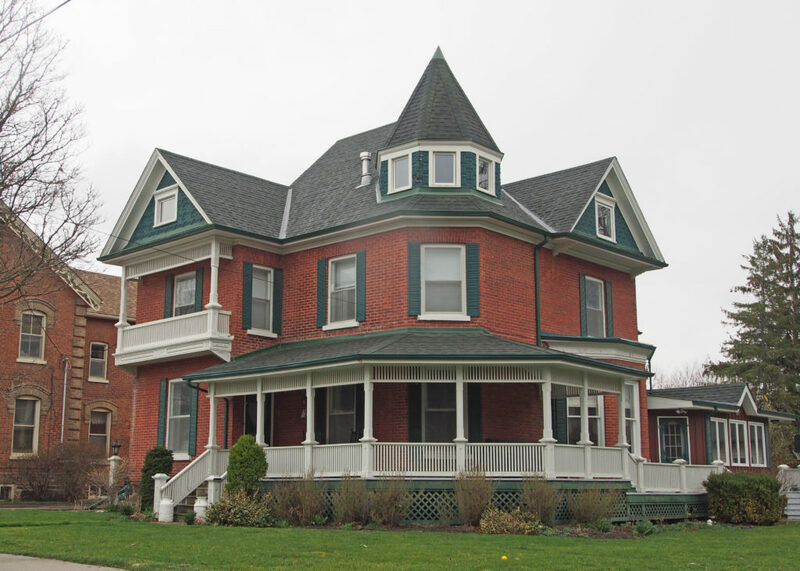 In 2003, Meaford secured a grant to restore and renovate the building. Thousands of volunteer hours later, the Meaford Hall Arts and Cultural Centre opened for business in the spring of 2006. The building housing the current museum was built in 1895 as the towns Pumping Station. The Public Utilities Department was later relocated to the Pump House and the building was called the “Power House.” During the 1940s, the chimney was removed. 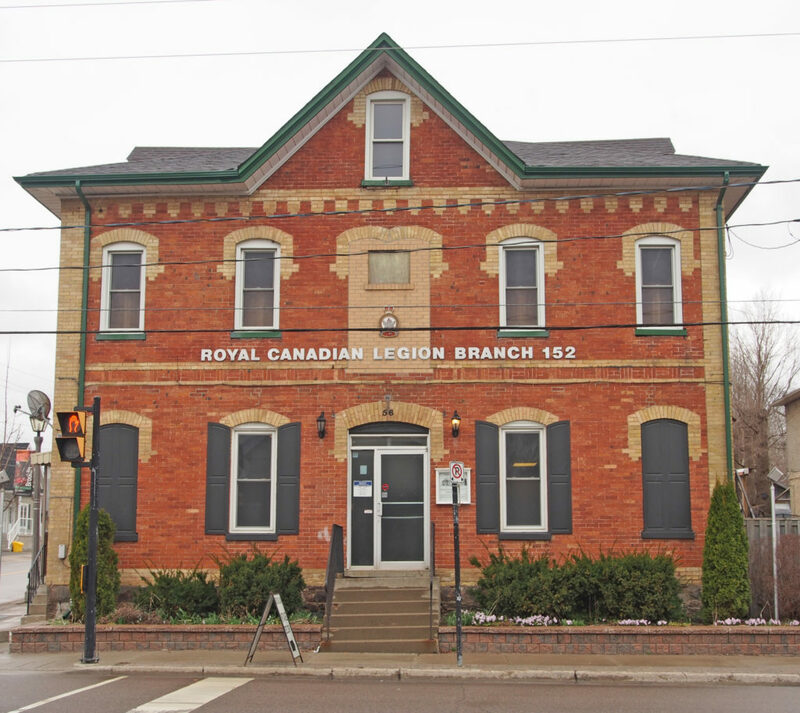 Cyrus Sing, a local citizen, donated his collection of memorabilia to the Town, and the building which had been vacant for a while was converted to a museum and opened to the public on July 1, 1961. 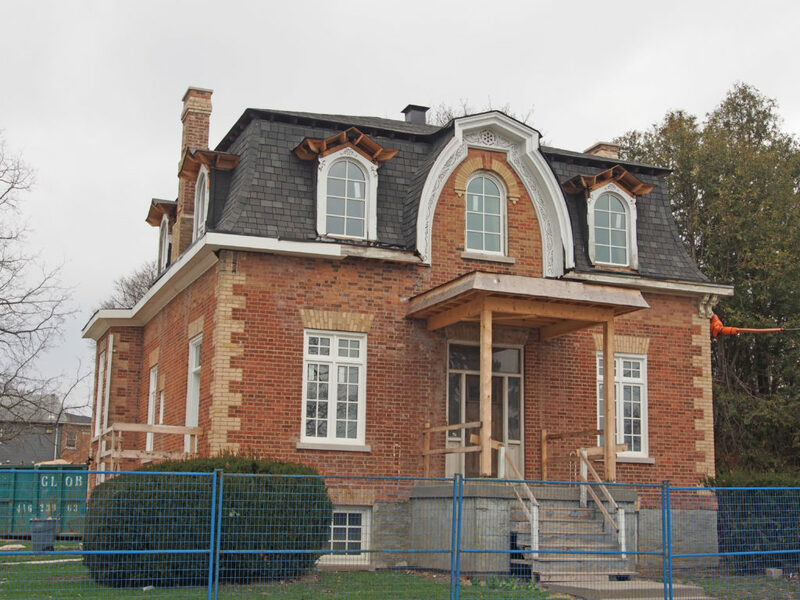 Due to a continually expanding collection, several renovations and additions have been made to the building over the years. Born in Nova Scotia, Margaret Marshall Saunders (1861-1947) was a novelist whose second book “Beautiful Joe” achieved international recognition. Inspired by a visit to Meaford in 1892, it is based on the story of a dog rescued from a brutal master by a local miller, William Moore. In 1994 the Beautiful Joe Heritage Society was formed to honor the life and story of Beautiful Joe and the literary and humane achievements of Margaret Saunders. Beautiful Joe Park is located in Meaford. 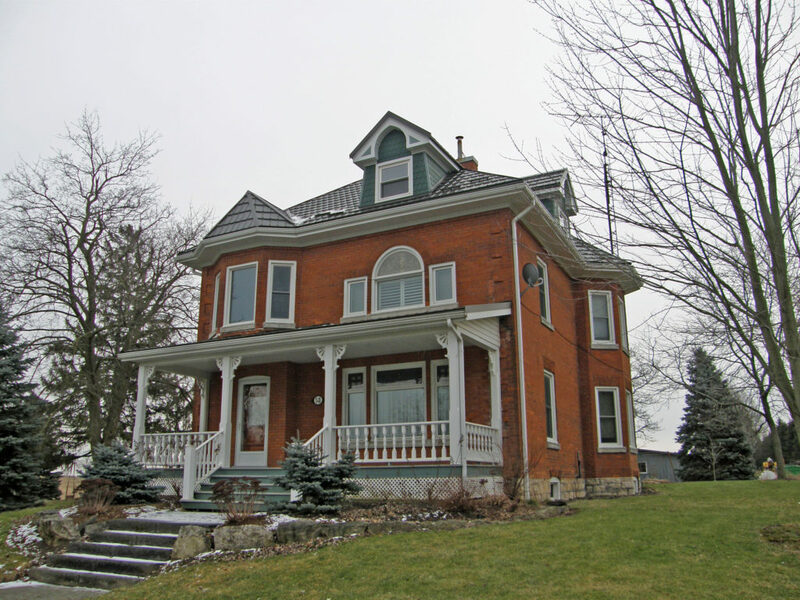 Victoria Corners is located on 21st Sideroad near Loree Forest and north of the hamlet of Banks. Thornbury is located on Georgian Bay between Meaford and Collingwood. The Township of Thornbury was incorporated in 1833. In 1855 the town’s first business, a milling operation, was set up, followed by a general store, blacksmith, cooper and fanning mill shops, grist and saw mills, and a post office. 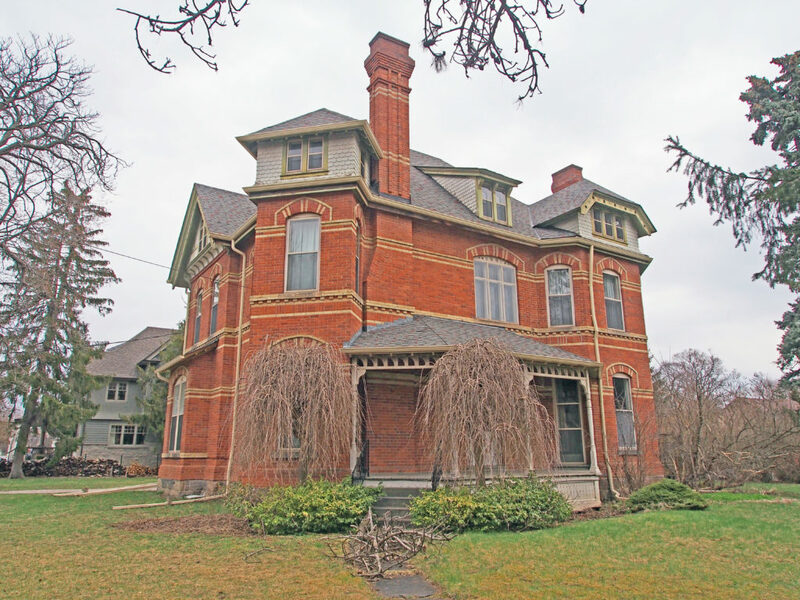 In 1887, feeling they were unfairly burdened with high taxes, the businessmen of Thornbury petitioned for independence from the Town of Collingwood. 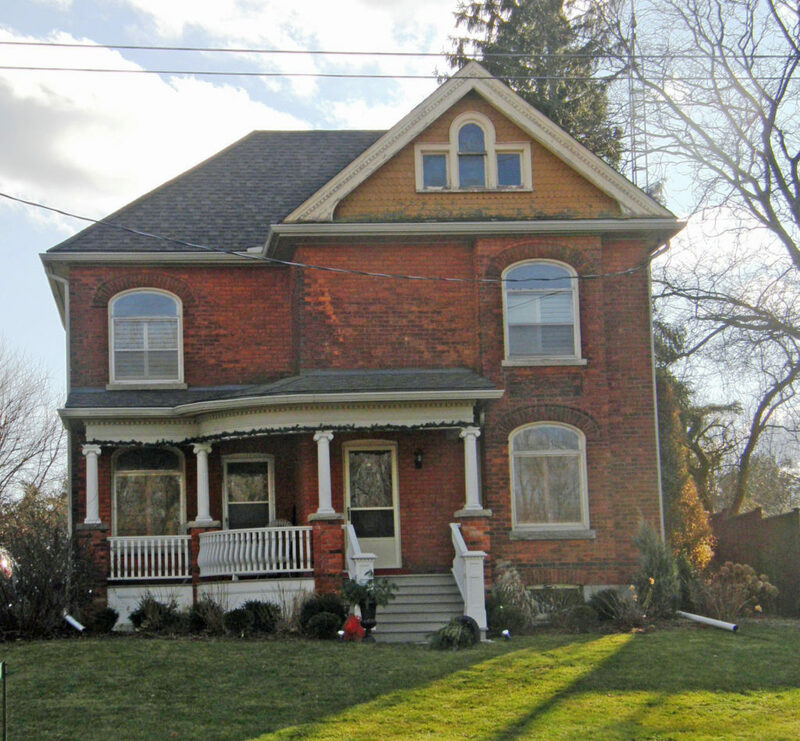 After much negotiating, they received it and the Township of Thornbury became the Town of Thornbury. The apple packing industry took root in Thornbury in 1885. At the Thornbury Village Cider House, they produce Premium Apple Cider from apples grown in the area, cider that is light, crisp and refreshing. 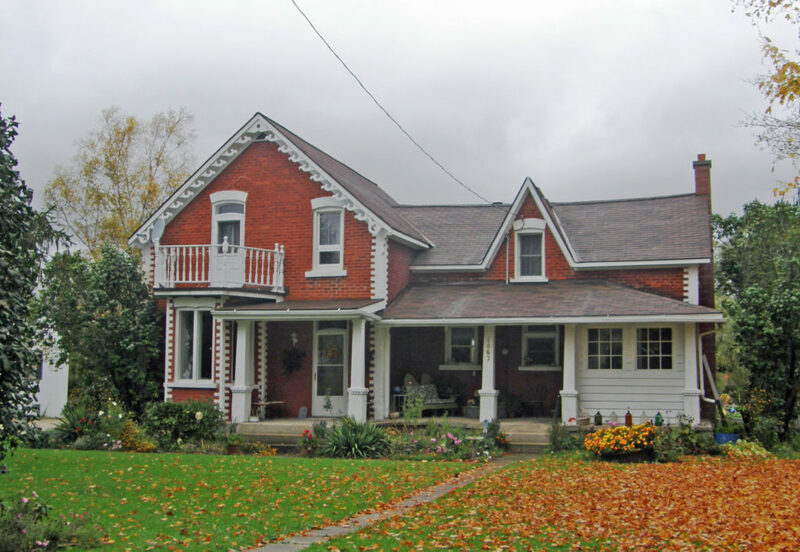 On January 1, 2001, the Town of Thornbury and the small settlements in the Township of Collingwood were amalgamated. Thornbury is the primary population center. 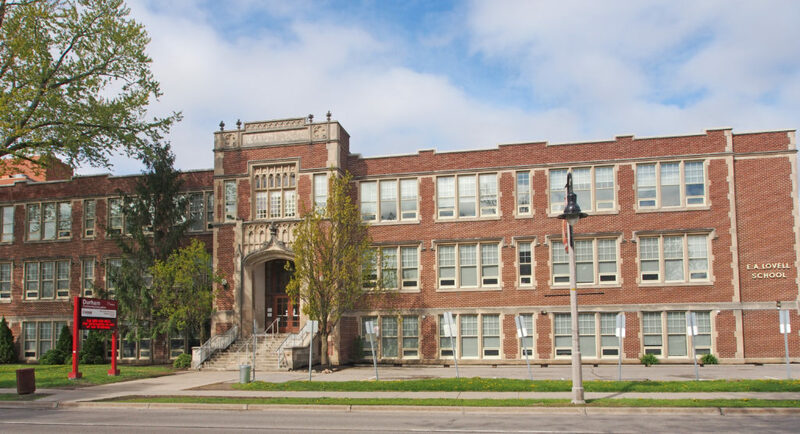 The town’s territory includes the communities of Banks, Camperdown, Castle Glen Estates, Christie Beach, Clarksburg, Craigleith, Duncan, Gibraltar, Heathcote, Kolapore, Little Germany, Lora Bay, Loree, Ravenna, Red Wing, Slabtown and Victoria Corners. Walter’s Falls is located south of Owen Sound on Grey County Road 29. It was the site of a saw mill and woolen mill. The saw mill burned down but the woolen mill remains. Water from Walter’s Creek flows to form Walter’s Falls. 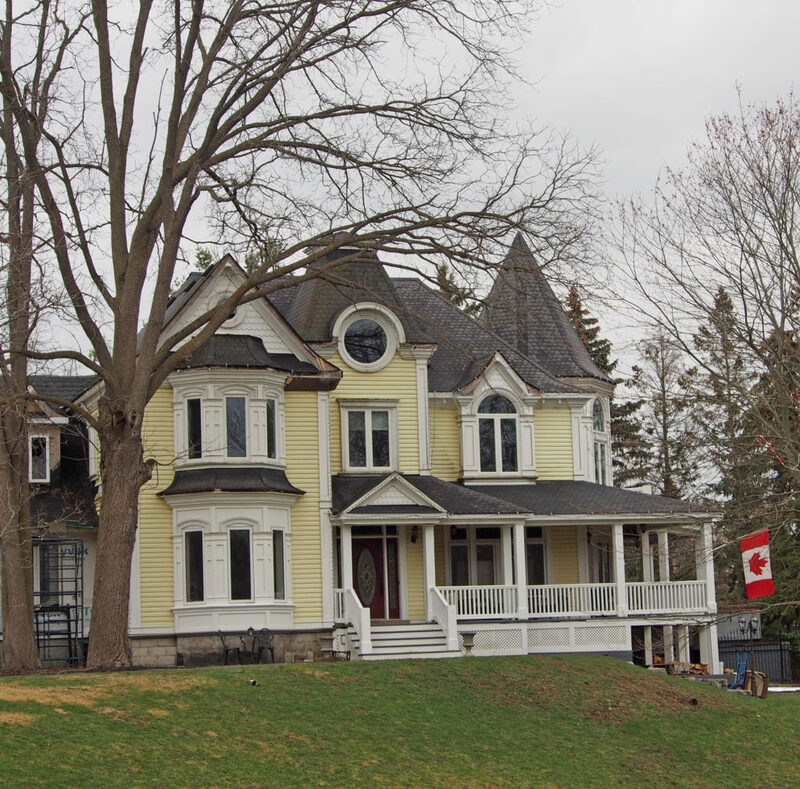 Craigleith – In 1872 Andrew Grieg Fleming, father of Sir Sanford Fleming, sold a parcel of land to the Northern Railway Company for the purpose of building a train station to serve his newly founded community. The station building was constructed from local timber between 1878 and 1881 and included a rounded turret. By 1881 there were six trains a day at the Craigleith station. In 1882, the Northern Railway was purchased by the Grand Trunk Railway. In 1923 the Grand Trunk became part of the Canadian National Railway. The convenience of the railway allowed businesses to be created and to prosper. In the 1940s the ski industry in Ontario began to grow with weekend ski trains from Toronto. Passenger service to the Craigleith station ended in 1960. In 1966 the station and lilac grove were saved from destruction by Kenn and Suyrea Knapman who re-opened the station as a restaurant and museum. 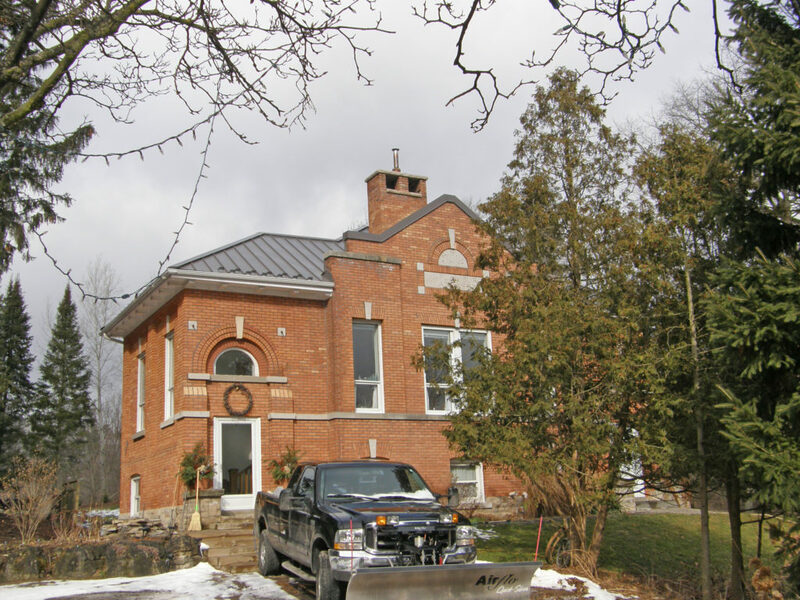 In 2001 the Craigleith Depo was purchased by The Blue Mountains. 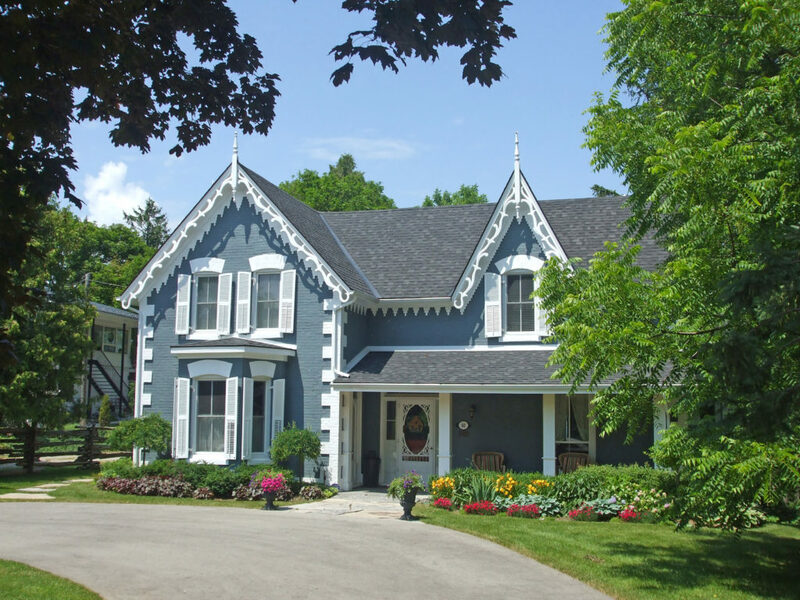 Fenwick is a community in the in the town of Pelham located in the Niagara Region. Welland is the closest city center. The community was named in 1853. The name probably comes from Fenwick, East Ayrshire in Scotland, which was the birthplace of Dr. John Fraser, who was reeve of Pelham Township at the time. Ridgeville is a community within the town of Pelham. It borders the western limit of Fonthill. It derives its name from its location on the south western ridge of the Fonthill Kame. 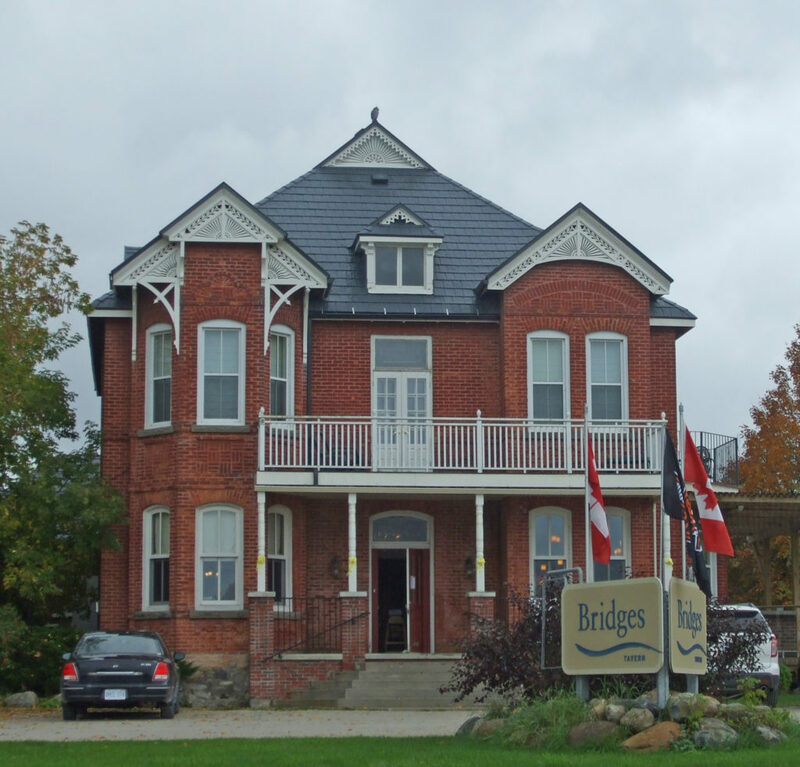 It has a post office, a rural mail route named Ridgeville, a small number of shops found along Canboro Road, including a bakery, chocolate shop and specialty home and bath shops, the local high school, Gwennol Organic Blueberry Farm and the Berry Patch Tea Room. Fonthill is a community in the town of Pelham. It has a few small industries, but is primarily a residential suburb known for its fruit orchards, nature trails, and neighborly attitude. Fonthill shares its name with the Fonthill Kame, on which it is located, formed by glacial deposits. Effingham Creek, a cold-water stream, originates in the glacial silts and sands of Short Hills area of the moraine, northwest of Fonthill. Effingham Creek is a tributary to Twelve-Mile Creek, which empties into Lake Ontario. The Fonthill Kame is a geological feature in the form of a large, isolated hill composed of sand and gravel deposited by the retreating glaciers of the last ice age. The Fonthill Kame rises about 75 meters (246 feet) above the surrounding land and is the highest elevation in the region. The kame is 6 kilometers (4 miles) east to west and 3 kilometers (2 miles) north to south. It slopes gradually on the west side, more steeply on the south and east and merges with the Short Hills Provincial Park area of the Niagara Escarpment on the north. The Fonthill Kame influences the climate of Pelham by sheltering it from the winds from the southwest. This provides good growing conditions for fruit crops, including the grape vines that supply the local wine industry. It is also mined for sand and gravel. Letters written by Henry Giles, a settler who came to the area in 1840, suggest that he chose the name Fonthill because the area looked similar to the area around Fonthill Abbey in England. The village’s first post office was established in 1856. 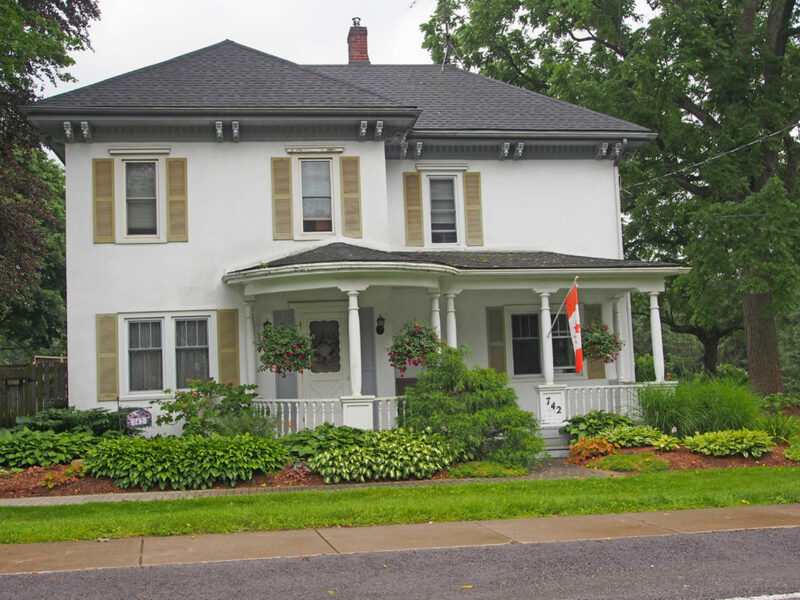 On June 10, 2006, Fonthill celebrated its 150th anniversary. The celebration was marked by the opening of the band stand (a replica of the original bandstand that existed in the early 1900s), historical displays and a variety of musical and artistic presentations. On a clear day, the tall buildings of Niagara Falls to the East and the Toronto skyline to the North are clearly visible from a vantage point near Effingham Street and south Tice Road just west of Fonthill. This also allows views of Lake Ontario, Lake Erie, and the skyline of Buffalo. 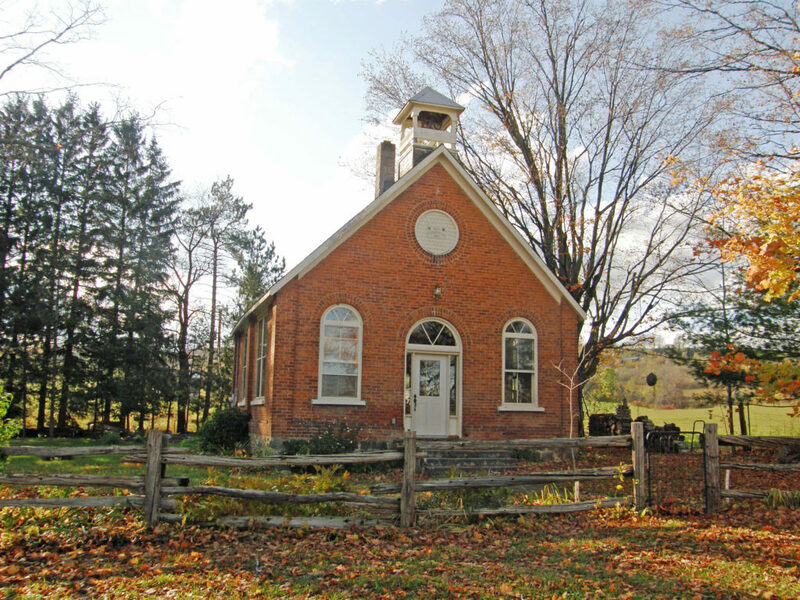 In 1970, the Town of Pelham unified five historical communities: Fonthill, Ridgeville, Effingham, North Pelham and Fenwick into a single town covering more than one hundred and twenty-six thousand square kilometers. This integration brought together a mix of farming (agriculture) and commercialism. The Town of Pelham is located in the center of Niagara Region. The town’s southern boundary is formed by the Welland River, a meandering waterway that flows into the Niagara River. To the west is the township of West Lincoln, to the east the city of Welland, and to the north the city of St. Catharines. Pelham Township was part of Welland County since the late 1780s. The Town of Pelham derived its name from Pelham Township which was named by John Graves Simcoe in the 1790s. Simcoe gave names to the Townships of Niagara that were created to provide land for Loyalist refugees, disbanded troops former rangers and others after the British defeat in the Revolutionary War (which ended in 1783). The policy of Simcoe was to adopt township names from England. 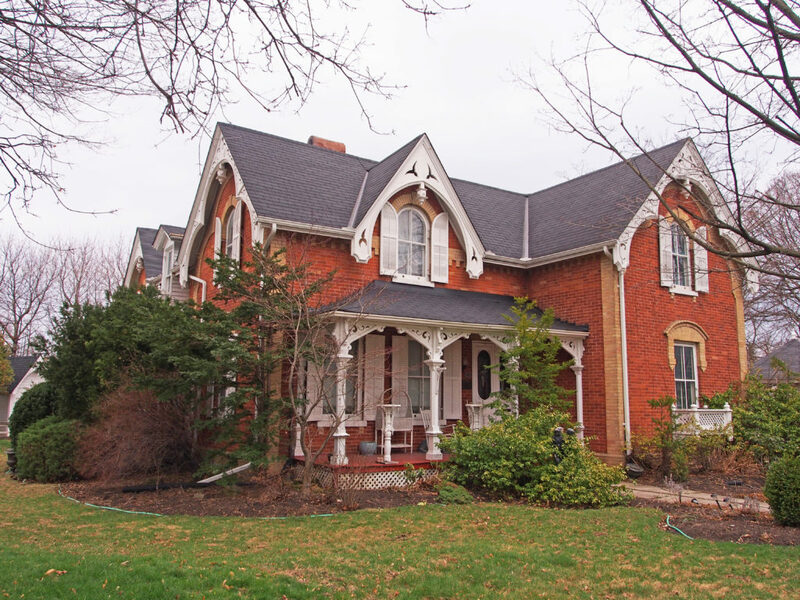 90 Canboro Road, Fonthill – The Wilson-Hansler-Stirtzinger House was built by John Wilson in 1876 of triple brick in the Gothic style. The walls are two feet thick and the floors are made of a mixture of cherry and maple woods. 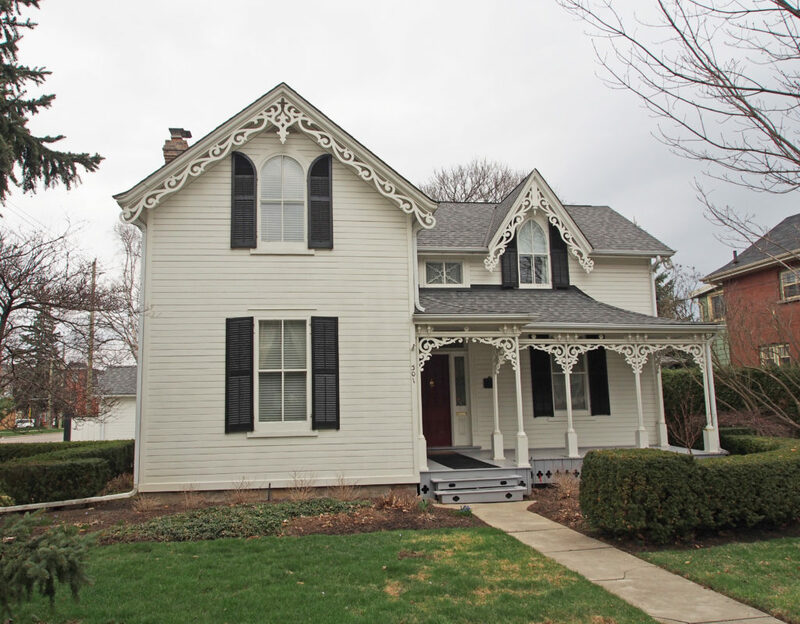 There is verge board trim on the gables, and a pediment above the door with sidelights and transom windows. 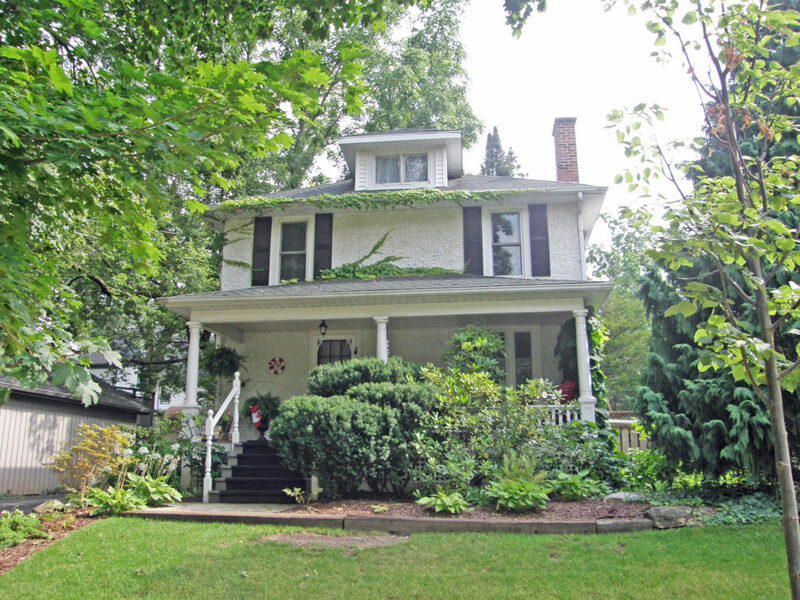 The house passed onto the family of Dr. John Hansler, and then to his nephew John Loyal Stirtzinger in 1926. 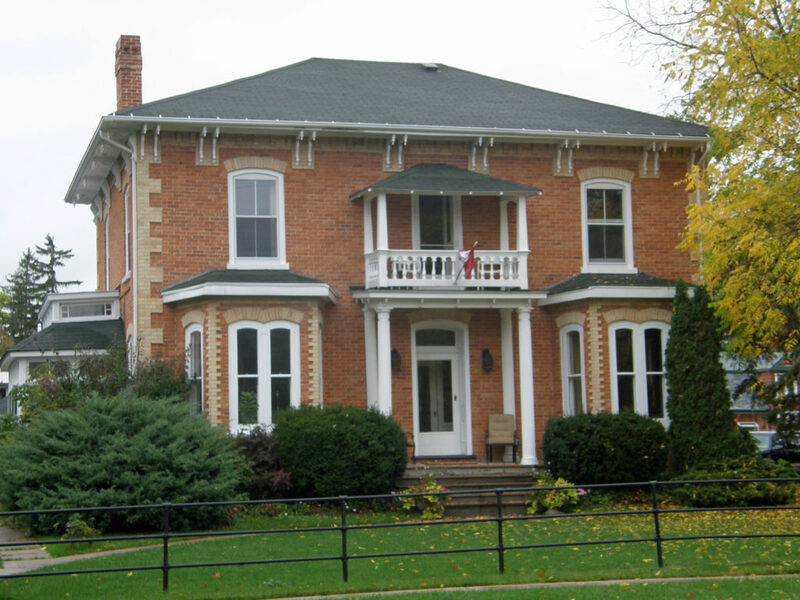 The house still remains on the property owned by descendants of Stirtzinger. Outside the house, the original Hansler carriage step and one of the hitching posts still stands. 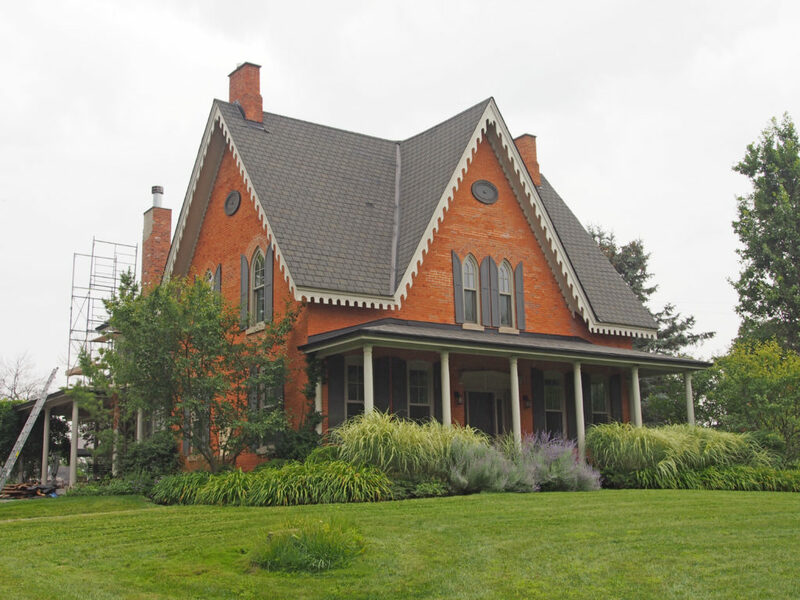 711 Tice Road – The Rice Moore House has been designated a heritage site for its architectural value. 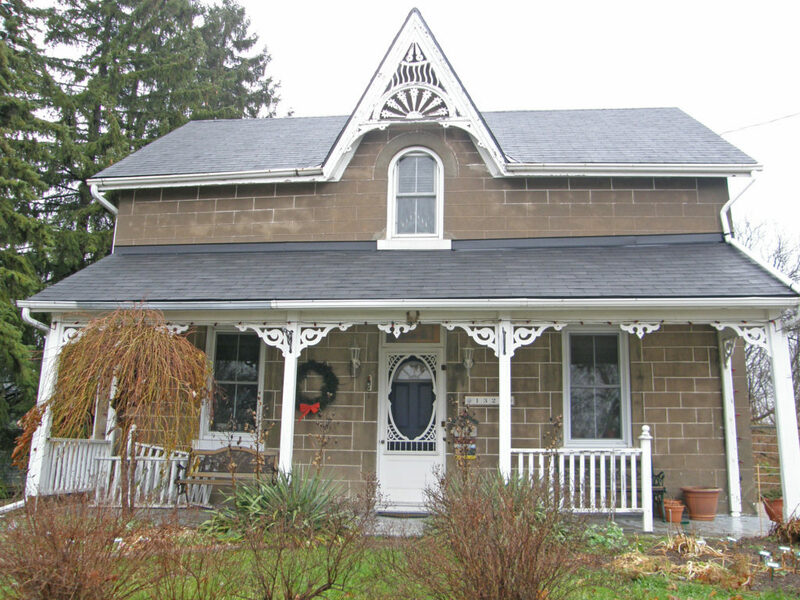 There is barge board trim around roof line, and steeply pitched gables. 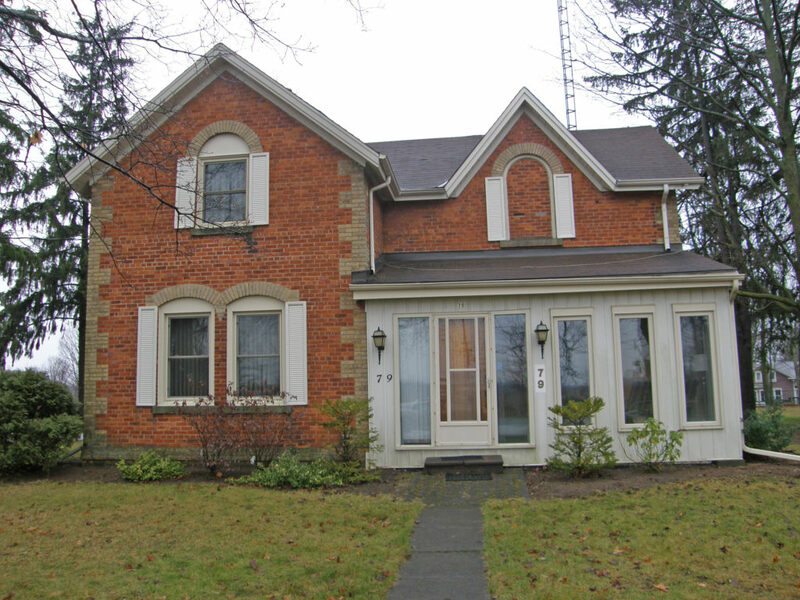 Clinton Township included the villages of Beamsville, Vineland, Campden and Tintern. Many of the early settlers were Mennonites who emigrated from Pennsylvania. Beamsville, Ontario was named after Jacob Beam, a United Empire Loyalist. 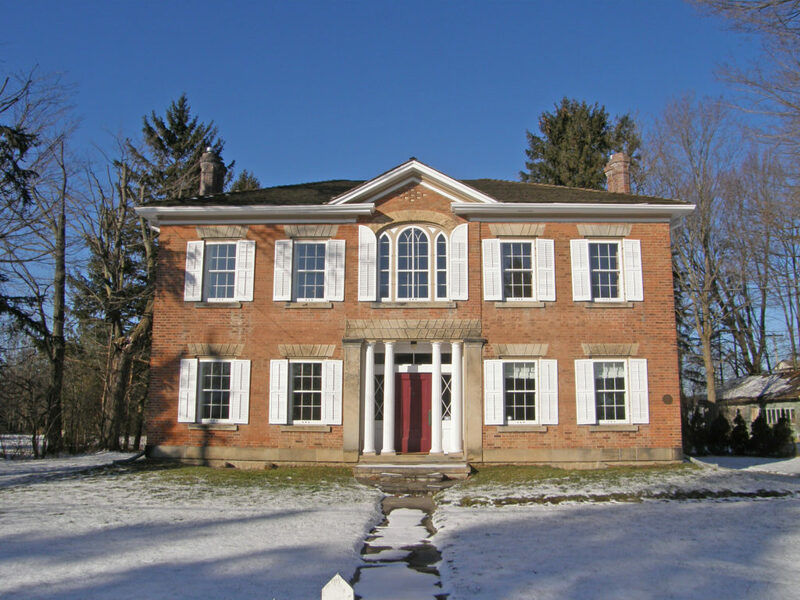 Jacob and Catharine, along with their daughter Catharine and son-in-law Samuel Merrell, immigrated to Canada from New Jersey in 1788, and founded Beamsville. It was located on the Great Western Railway. In 1898, hockey players in the town of Beamsville were the first to make use of a hockey net. 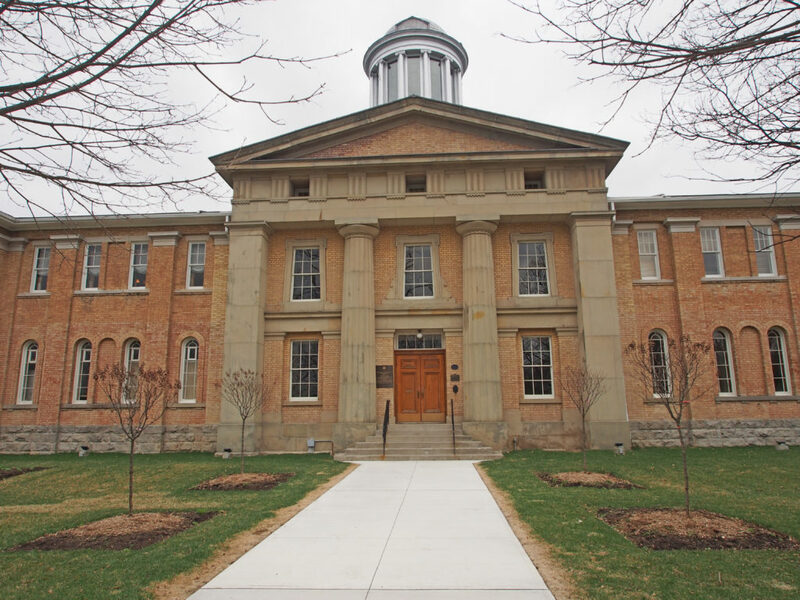 In 1970, the Town of Beamsville was amalgamated with Clinton Township and half of Louth Township to form the larger Town of Lincoln. 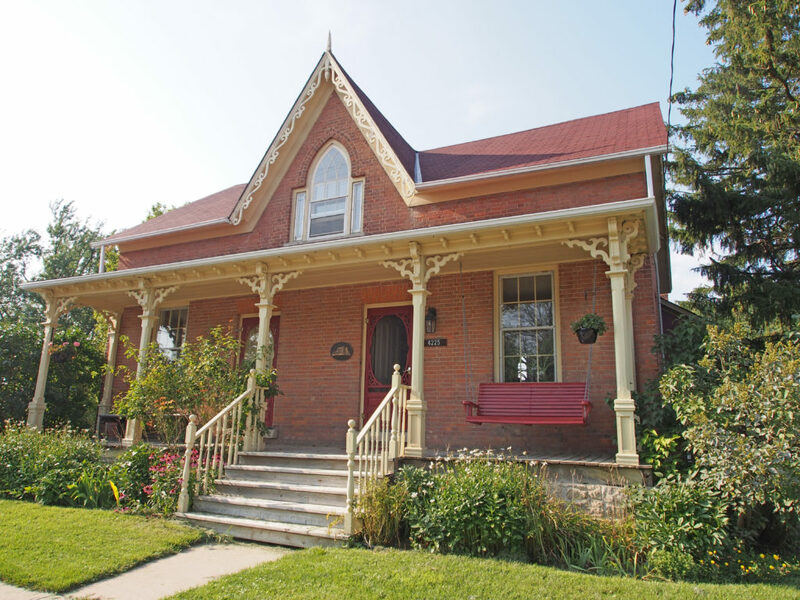 Beamsville is in the heart of Ontario’s wine country in the Niagara Peninsula. Many wineries from the area have received top awards, including Grape King at the Niagara Grape & Wine Festival, as well as international awards. Vineland is bordered by the Twenty Mile Creek and Jordan to the east, Lake Ontario to the north, Beamsville to the west, and Pelham to the south. Vineland is primarily an agricultural community with many fruit farms and wineries. Vineland’s fruit crops include cherries, peaches, apples and pears. Most of the early settlers of Jordan were German in origin, and were devout practicing Mennonites. With a large natural harbor at the mouth of Twenty Creek, Jordan became a busy shipping center for the export of logs for boat masts, tan bark, hides, ashes used in industrial centers for the manufacture of soap, as well as grain, flour, fruit and fruit products. A small ship building industry existed for a time on the banks of the Twenty. Ball’s Falls is a historical ghost town located in the Niagara Region and dates back to the early 19th century when it was established by Jacob Ball, a United Empire Loyalist. After the American Revolution, Jacob and his family were forced from their home and potash works in New York. Twenty Mile Creek, which runs through the area, has two waterfalls. The Ball brothers built a grist mill, a saw mill at the lower falls and a woolen mill at the upper falls. In the late 1850s, the Great Western Railway was established and many industries moved away from here to be closer to the railway. In 1962 Manly Ball sold the land to the Niagara Peninsula Conservation Area and the town, now known as Ball’s Falls, is a tourist attraction. The first settlers of Campden were former members of Butler’s Rangers who were granted land for their services to the Crown following the American Revolution. Benjamin Doyle was one of these and he severed part of his land to the newly arrived Pennsylvania Dutch, which included Jacob Moyer and his seven sons. In 1862 when a post office was established, the hamlet was named Campden. 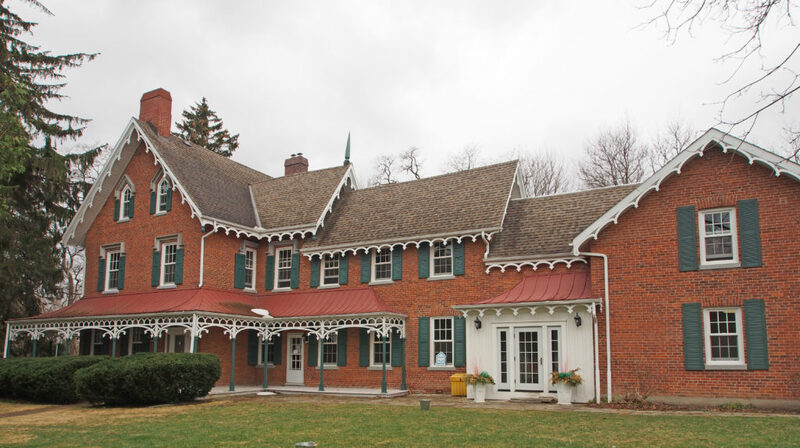 5600 King Street West, Beamsville – The property was a Crown Grant of 52 acres to a loyalist from New Jersey named William W. Kitchen around 1790. He married Alice Beam and together they had nine children. William and Alice’s youngest son, Jacob married Jane Dennis. 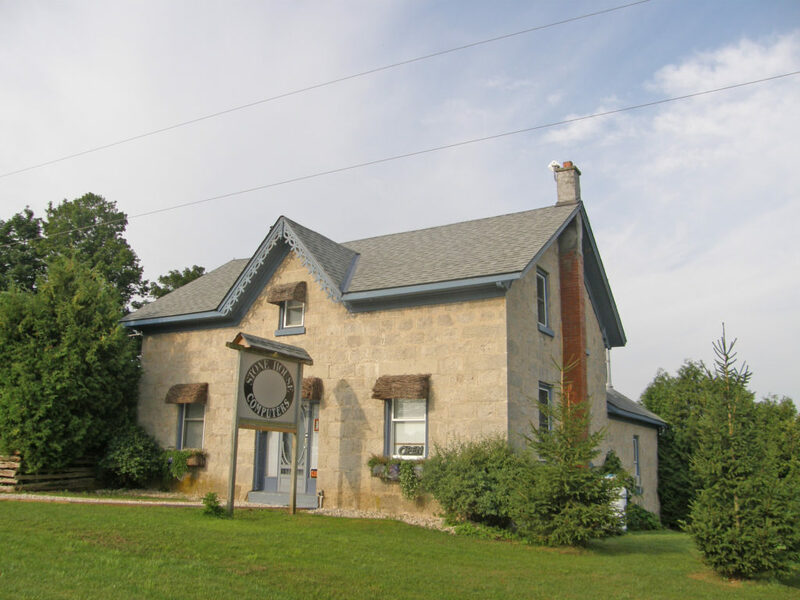 Their only son, William Dennis Kitchen married Margaret Henry and built the house in 1885 on the bench of the escarpment, just west of the Thirty Mile Creek. 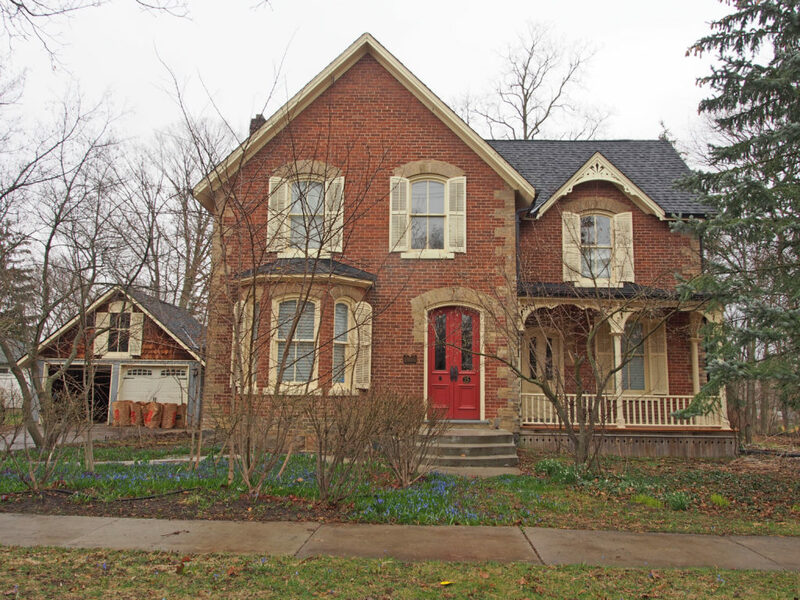 The house was built in the Queen Anne Revival style with red bricks. 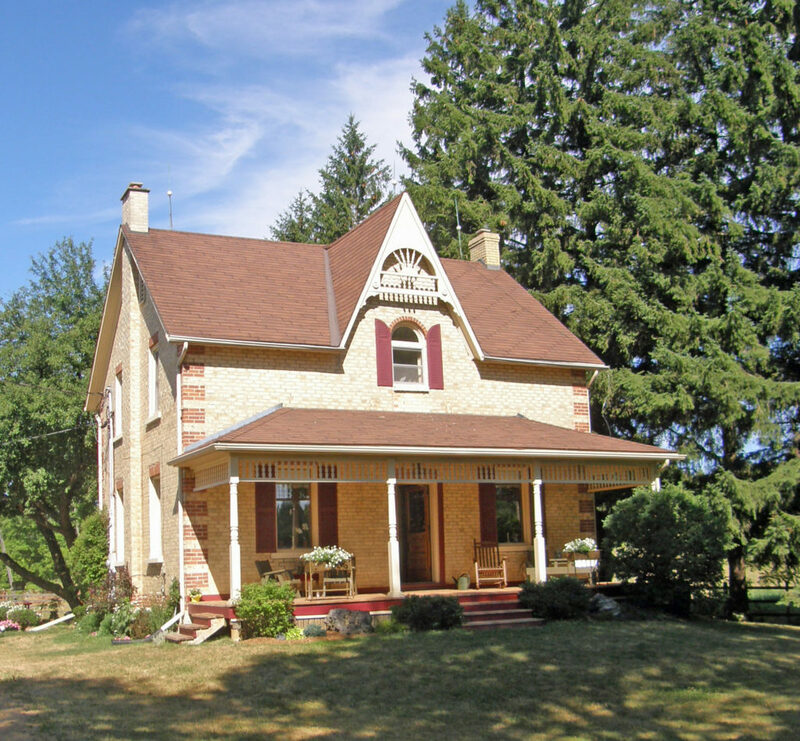 The turret has square and rounded cedar shingles, topped with a finial. 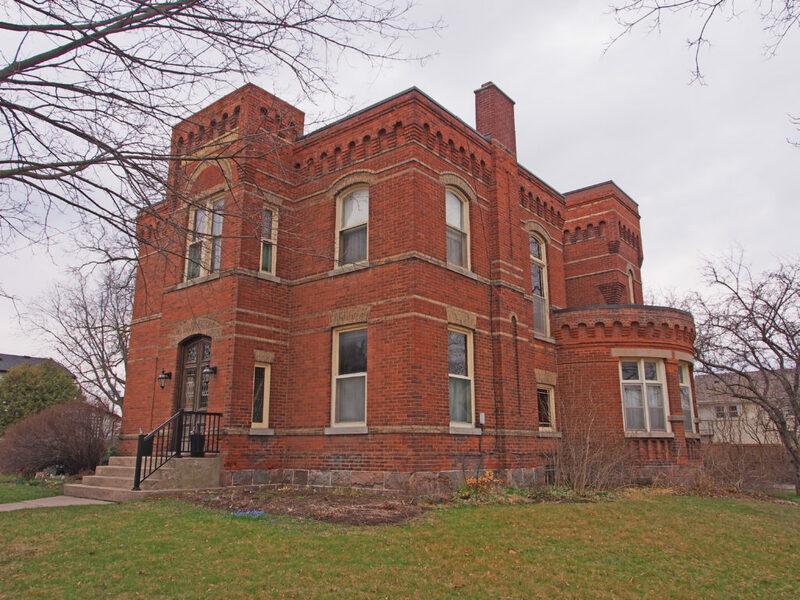 There are two tall corbeled chimneys, and a hipped roof with a flat belvedere. The gables have carved fretwork brackets and barge board. The tall bay windows are topped with segmental arches and decorative keystones. 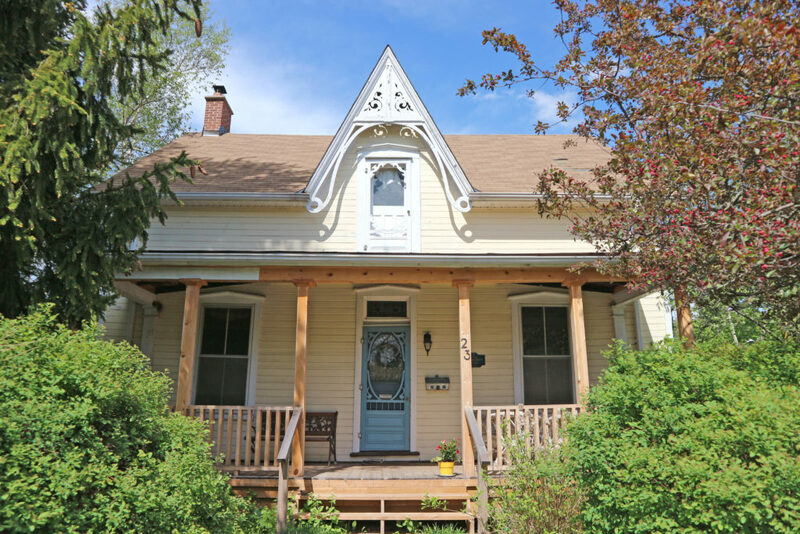 The front porch has an overhead balcony, and like the side porches, features turned posts, balustrades, spandrels and brackets. 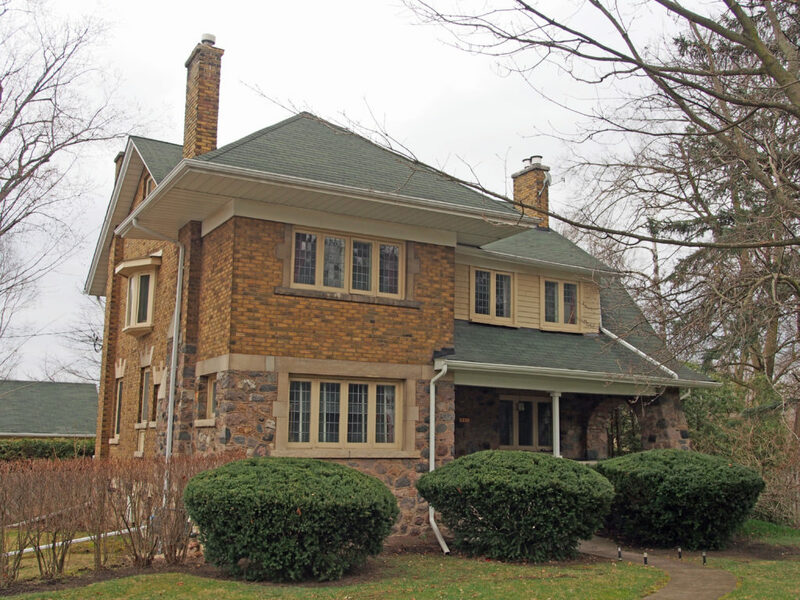 Purchased by the Longwell family in the 1920s, Doug and Jean Longwell continued to live there until the 1980s. 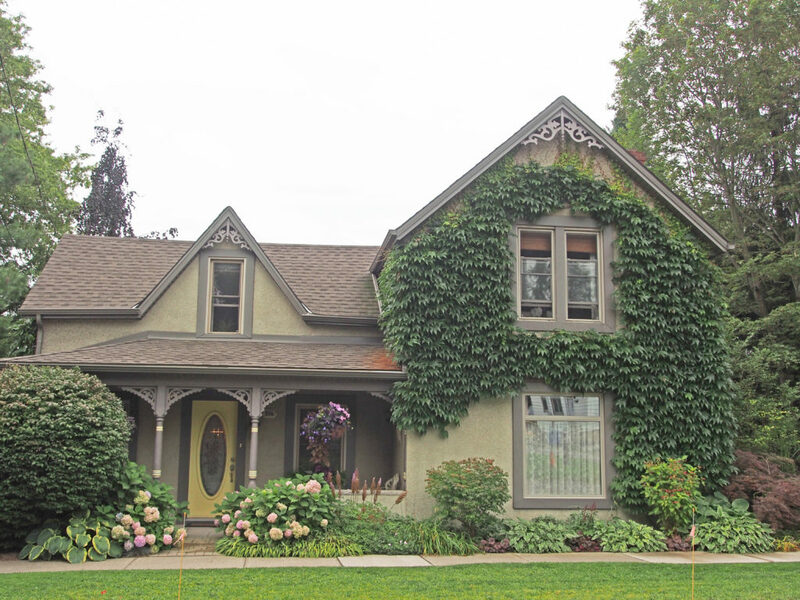 From 1999 to 2009, the house was owned and restored by Norman and Sherry Beal, who transformed the property into an estate winery. 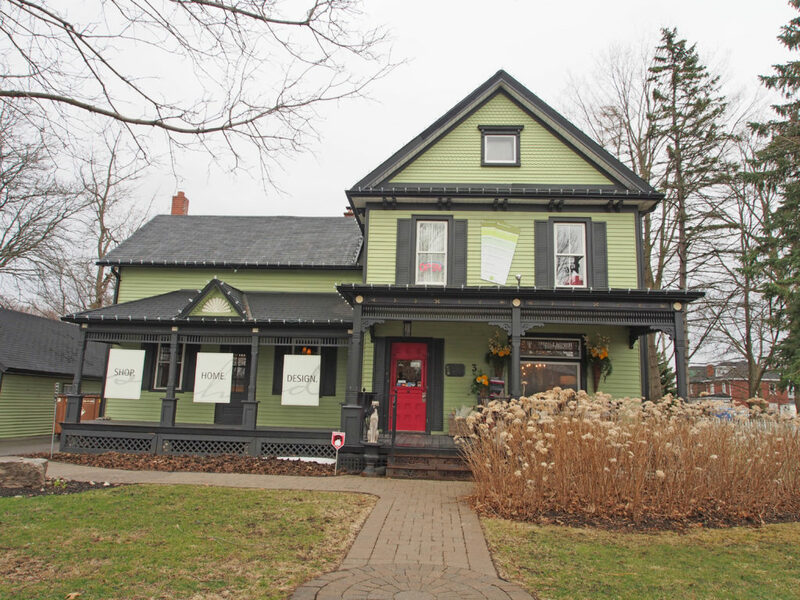 In 2009 Wendy Midgley and her husband Chef Ross Midgley purchased the Kitchen House and the Coach House from the Beals. 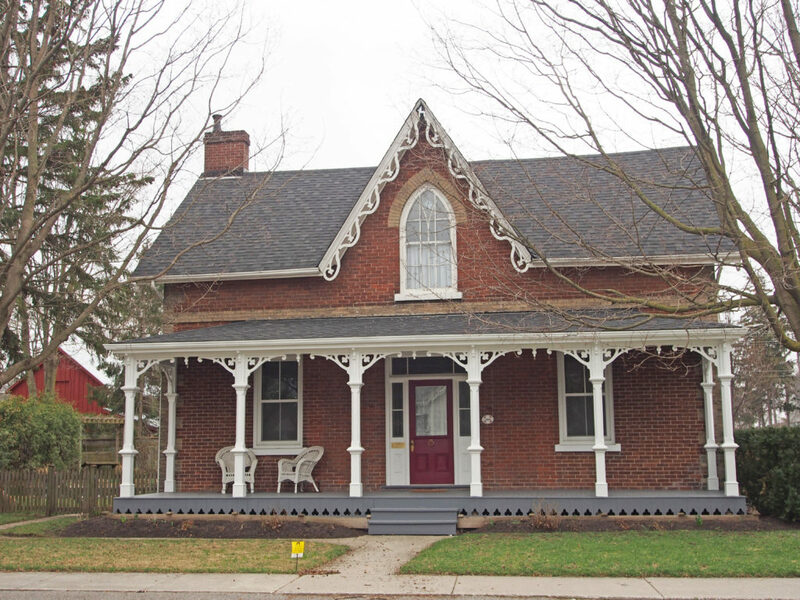 5053 King Street, Beamsville – Beam Barnes House c. 1855 – The property was originally granted by the Crown to Samuel Corwin in 1803. His wife was Anna Beam, daughter of Loyalist pioneer Jacob Beam. 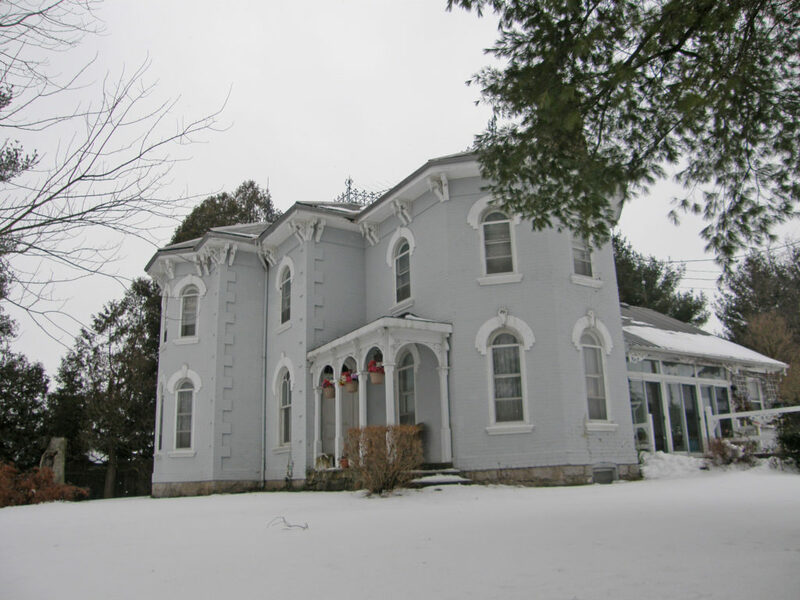 Her brother, Jacob Beam Jr. built the house between 1852 and 1855. 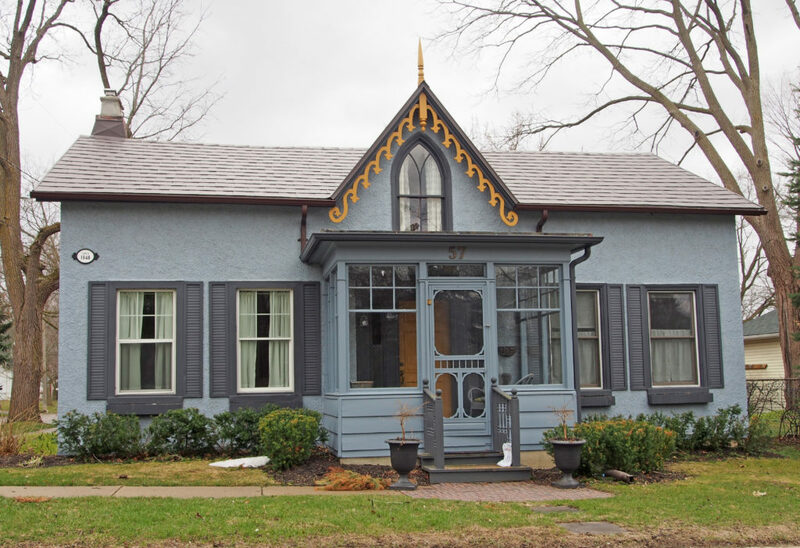 The frame house is an early version of the Gothic Revival style. Notable features are steeply pitched gable roofs with carved finials and cut out quatrefoils worked into the barge board on both the front façade and east wing. 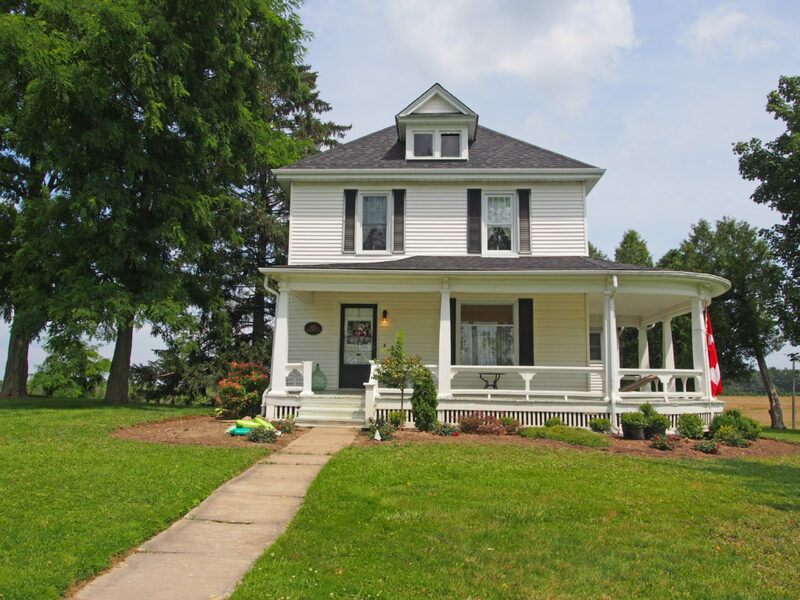 The veranda has simple square posts, and the front door has a paned transom and sidelights. The tops of the slender but widely framed windows are surrounded with shaped lintels and decorative keystones. 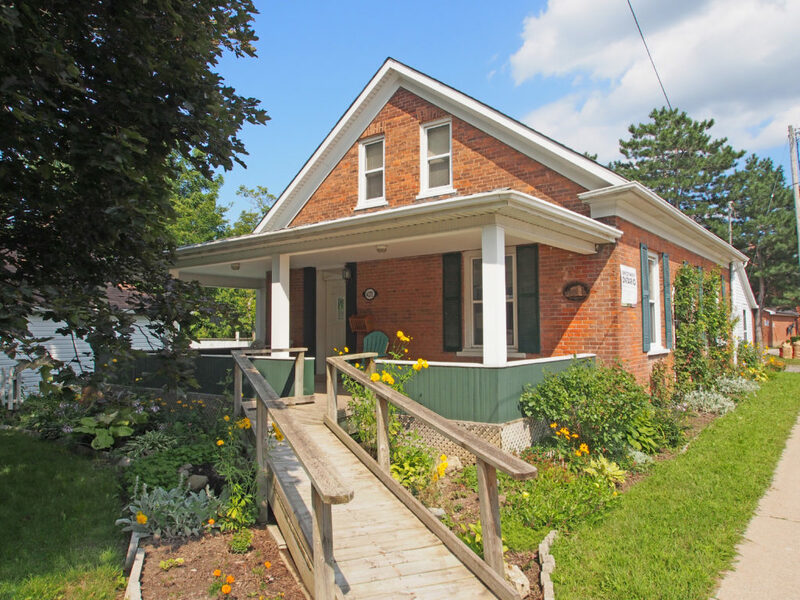 4918 King Street, Beamsville – Woodburn Cottage – The land was originally deeded by Crown Patent to Jacob Beam in 1801. 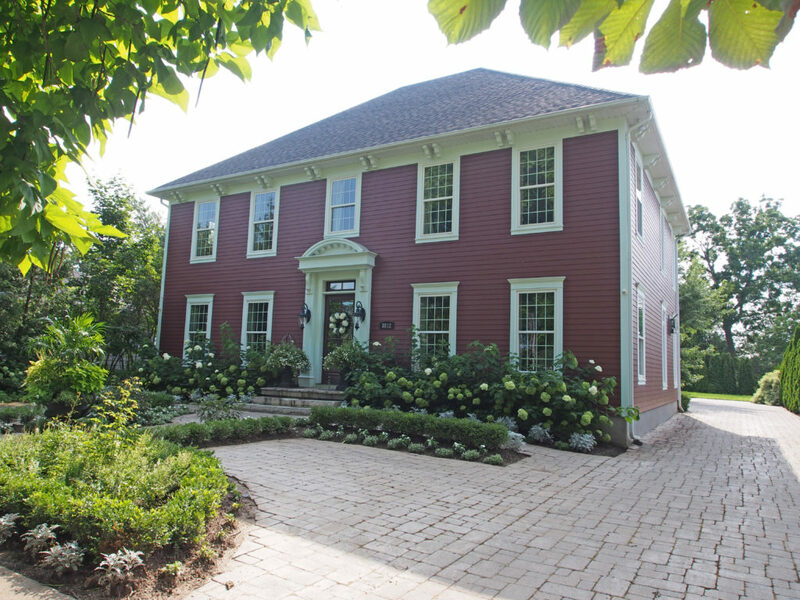 The house built about 1834 for James B. Osborne, a merchant, postmaster and private banker. He was a prominent member of the community. The name “Woodburn” is said to have derived from James Osborne’s second wife’s family. The house is Regency Cottage in style. 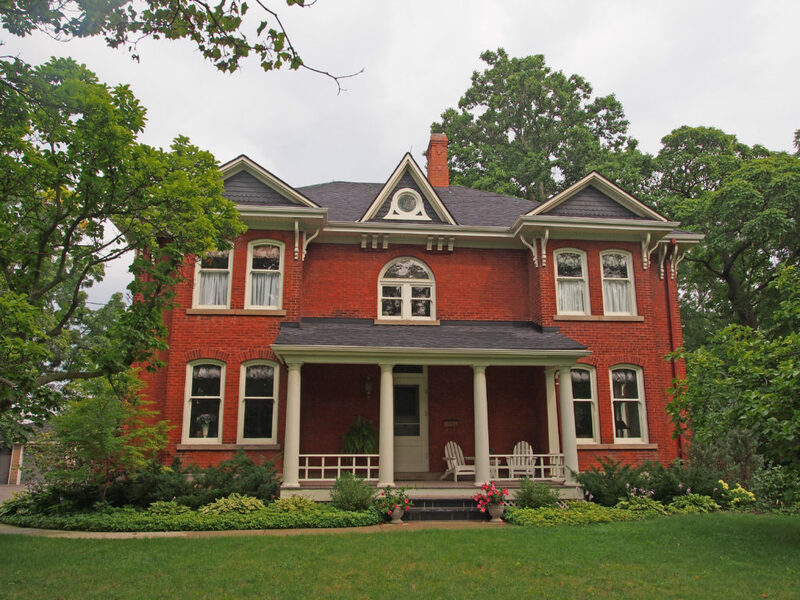 It is built of Flemish double stretcher bond red brick on top of a fieldstone foundation. 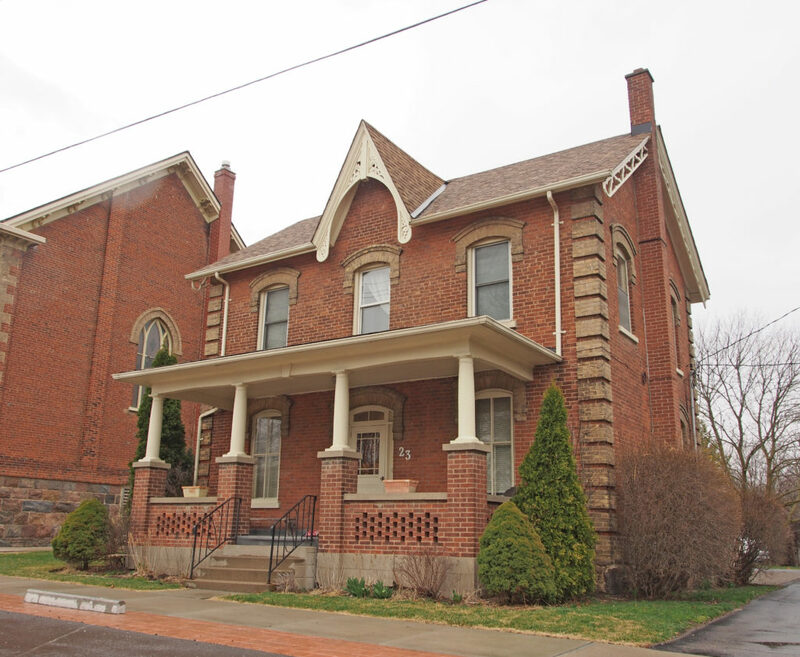 The front façade has an impressive double door with sidelights and a fan transom housed in an arched brick surround. Flanking the doorway are four large, shuttered windows, each with twelve panes and flat stone lintels on top. The hipped roof has double-flued, corbeled chimneys on each corner and has a large belvedere on top. 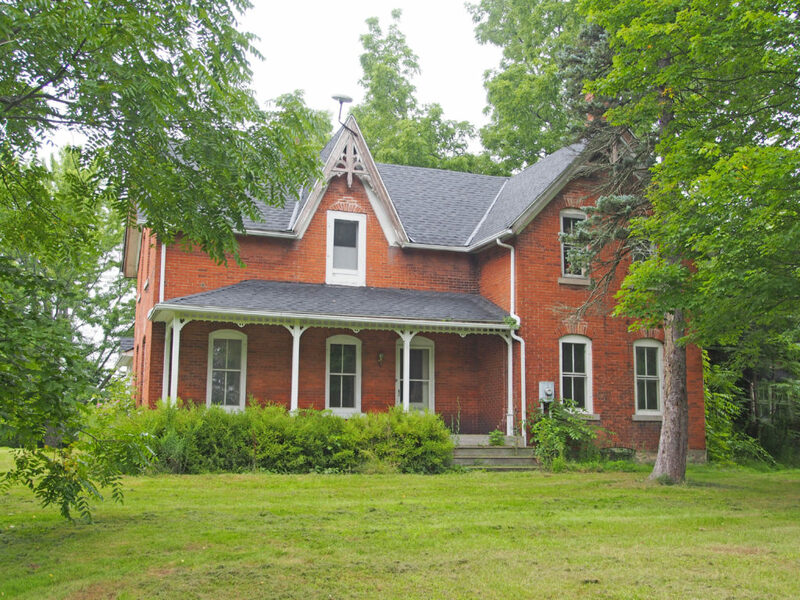 4271 Queen Street, Beamsville – Originally built as a school in 1847, the house is supported by a rubble stone foundation and hand-hewn beams. 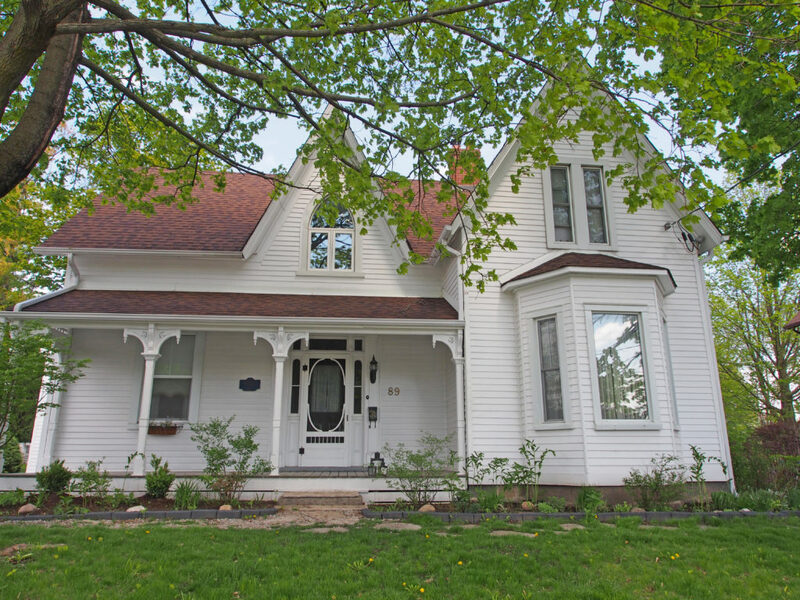 The house has a pitched gable roof and large double-hung windows. 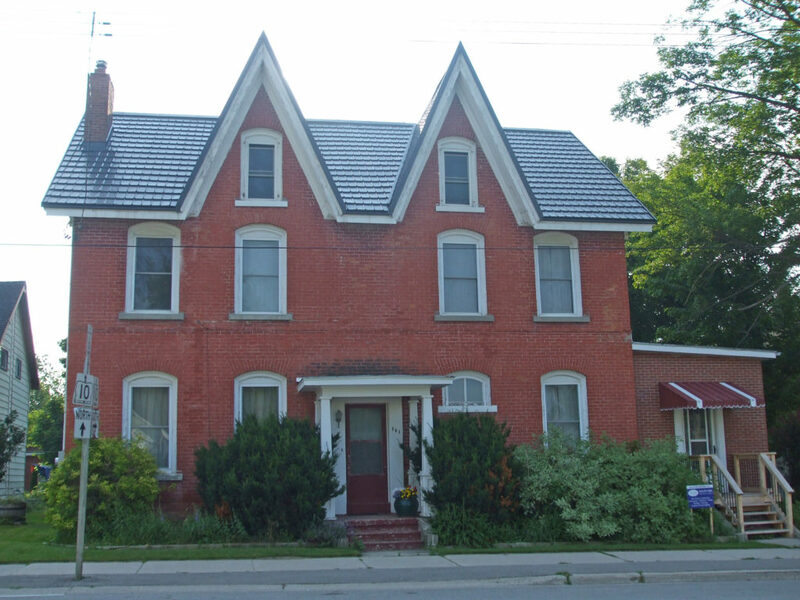 There are two pairs of smaller windows in both the front and back gables. It is now the Adult Learning & Resource Center for Niagara West. 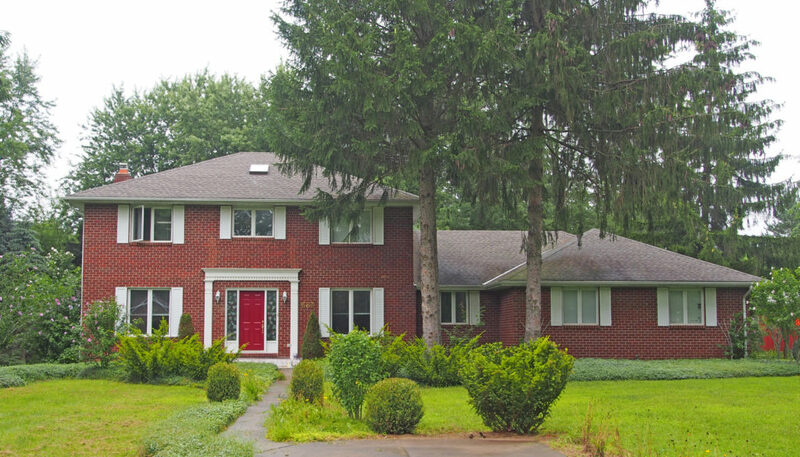 5567 Fly Road – The property was originally a Crown grant to Paul Marlatt in 1796. The Marlatts were part of the Huguenot migration from France to Virginia in the late 17th century. They moved to this area in the 1780s-1790s. 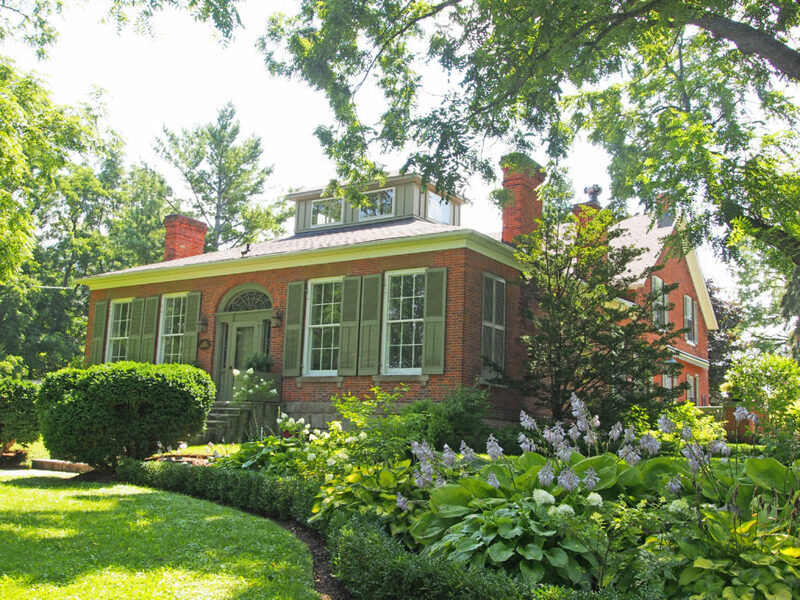 James Durham bought the property in 1830 and he had the house built in 1832. 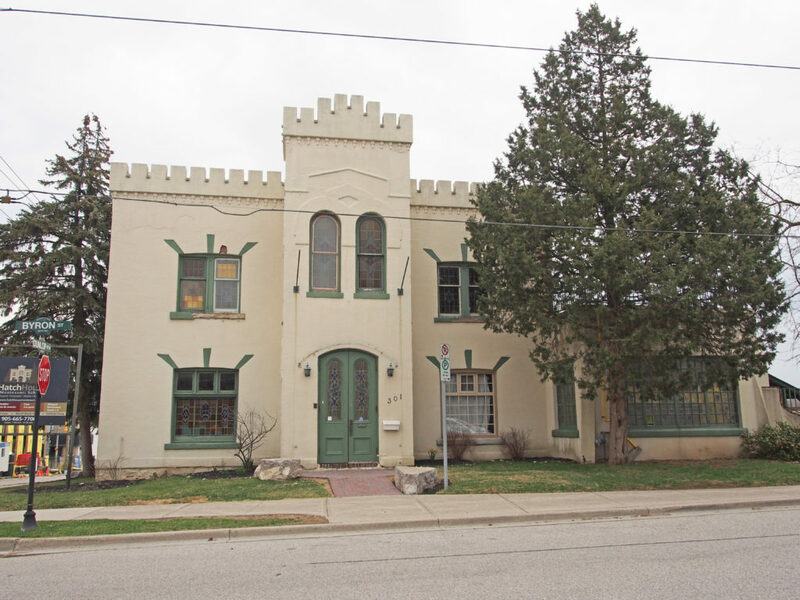 The two-storey white stucco house has multiple-paned 12-over-12 windows and sidelights flanking either side of the front door. 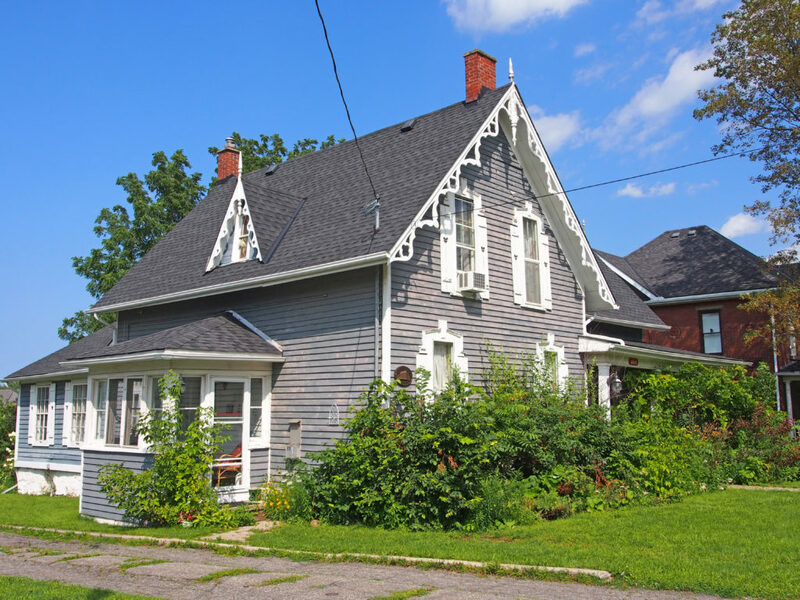 5031 Philp Road – Tufford Easton House – 1906 – Four-square asymmetrical 2½ storey house has a hip roof with a triangular-pediment-gabled dormer. 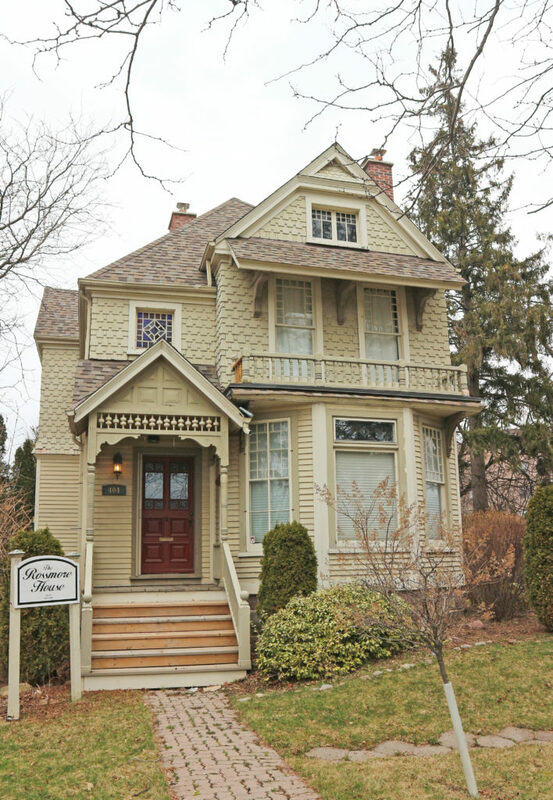 It has a Queen Anne style wraparound veranda supported by seven square pillars. 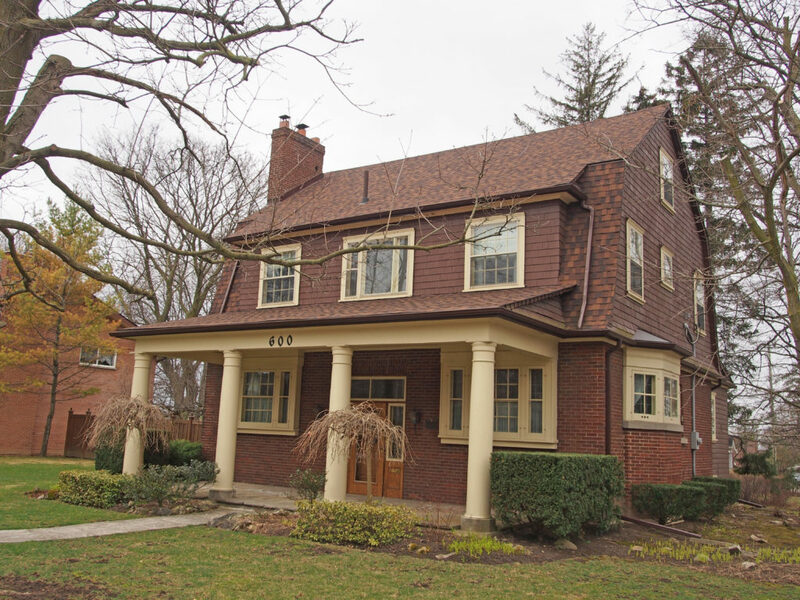 5499 Philp Road – The present house, of Neo-Classic Vernacular design, dates to about 1850 and utilizes hand-hewn beams and Flemish and triple brick construction. The five-bay façade has original windows and doors, with the front door flanked with sidelights and overhead transom. The main barn is a good unaltered example of an early 1800s Loyalist Barn in the English three bay style. 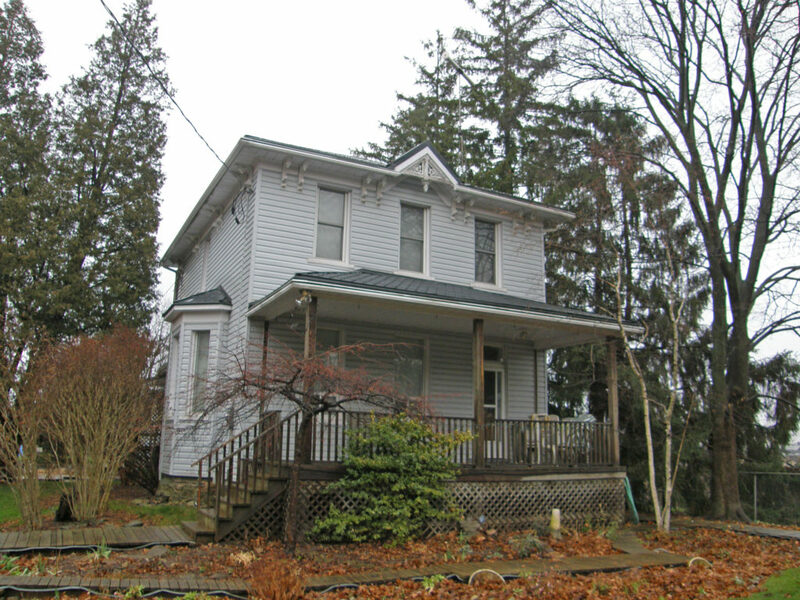 3150 Culp Road, Vineland – Overholdt House – The house was built in 1900 by a wealthy shipping merchant named Moses Overholdt. 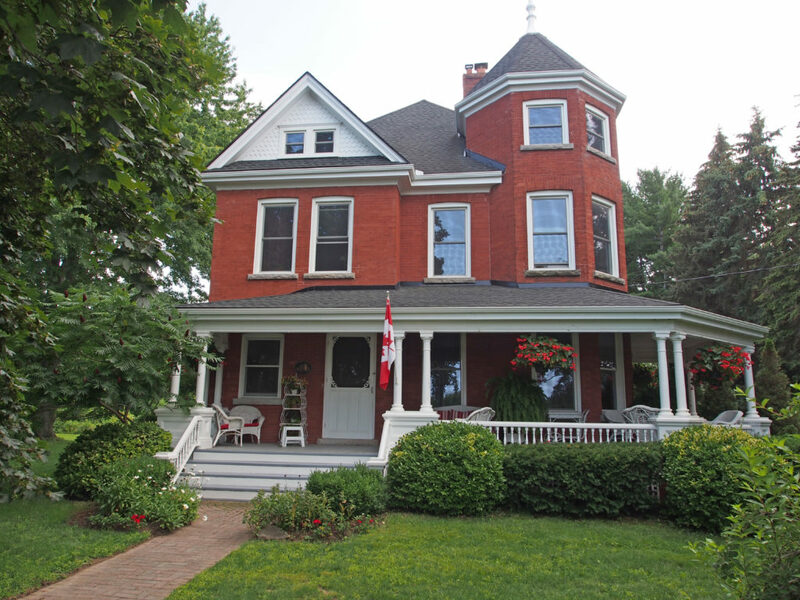 Built in red brick in the Queen Anne style, the house features a hipped room with diamond-shingled gables with Palladian windows on the sides, a three-storey hexagonal tower protruding from the northwest corner and topped with a finial, a wrap-around veranda with double piers on large bases, a tall corbeled chimney, and segmented, double-hung windows throughout. 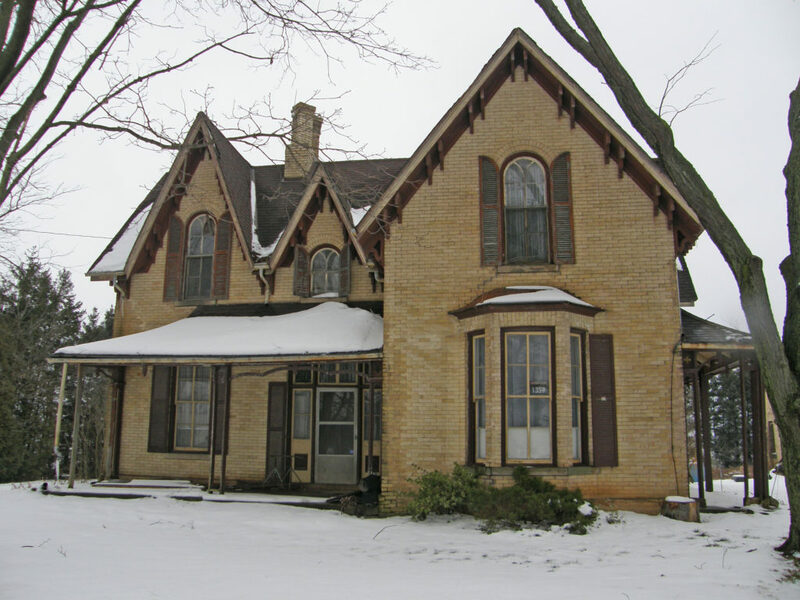 3812 Main Street, Jordan Station – The Honsberger-Griffith house was erected in 1851 by Michael Honsberger, a local merchant and Post Master in the Village of Jordan. 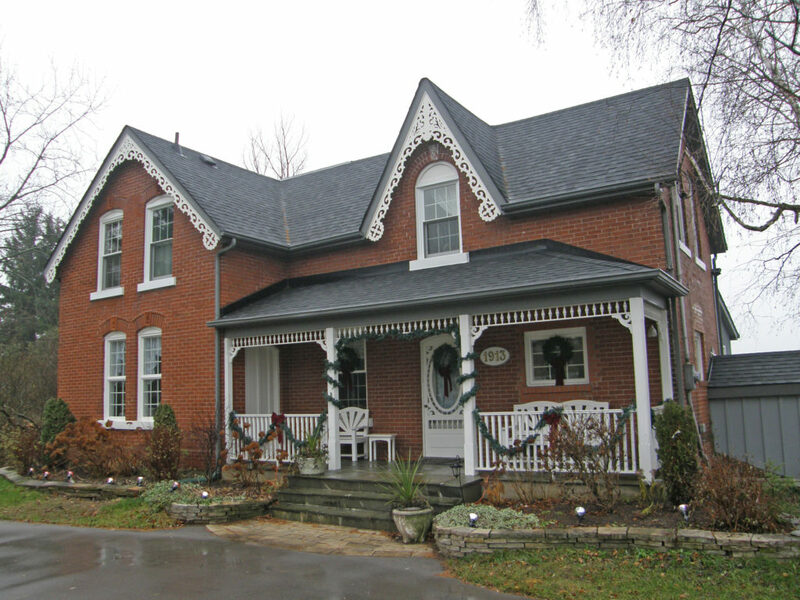 The house was built in the Georgian style using local bricks. 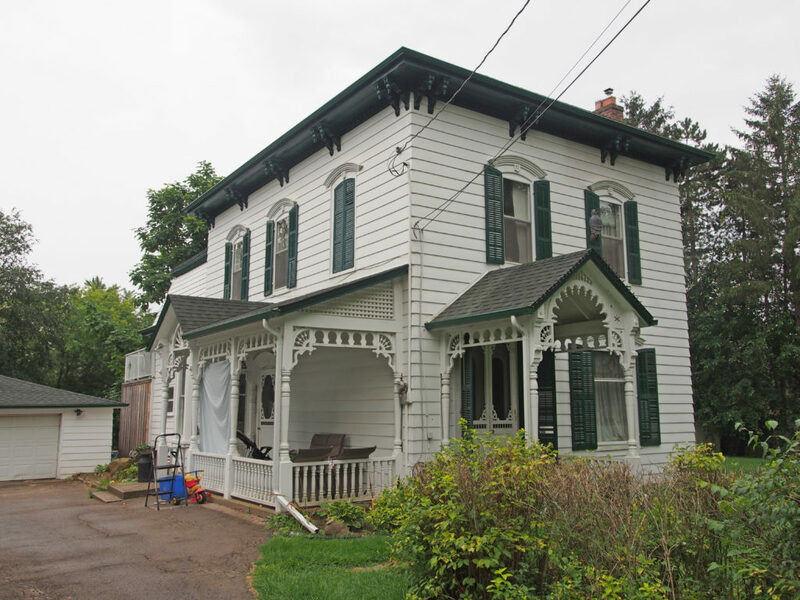 4225 Fly Road, Campden – The Henry W. Moyer-Humphrey House was built circa 1870 in the hamlet of Campden in the former Township of Clinton. 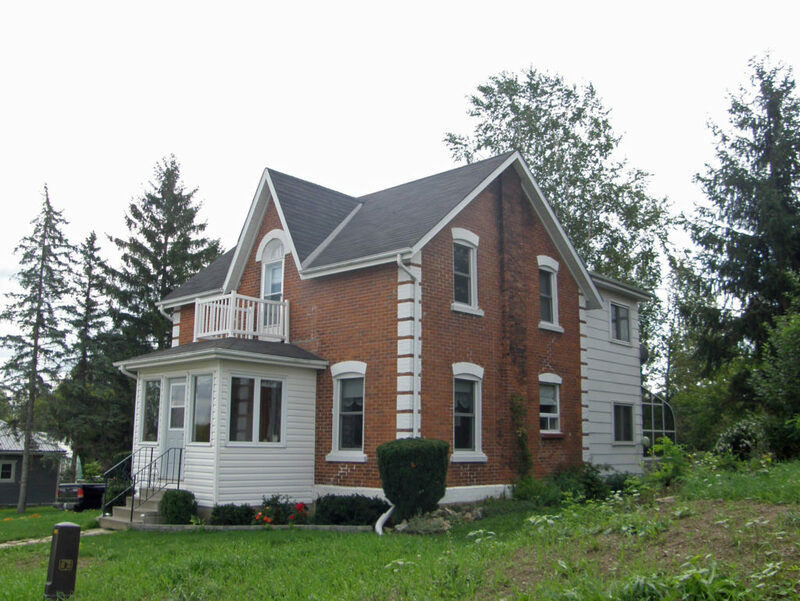 This house is believed to be the first brick house in the hamlet; several members of the Moyer family have lived in the house. Henry W. Moyer was a tinsmith, auctioneer, insurance agent and the first postmaster. 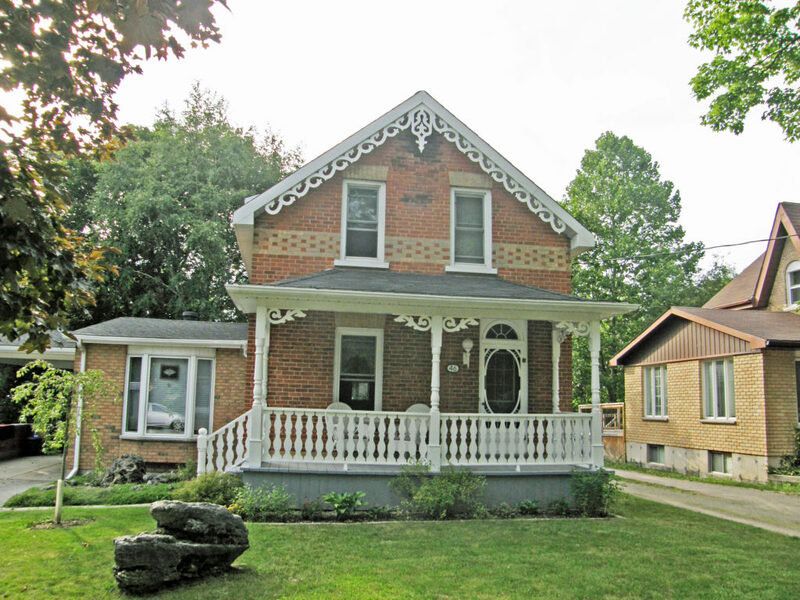 It is a classic 1½ storey farmhouse with Gothic ornamentation on the three gables and the full-width veranda. 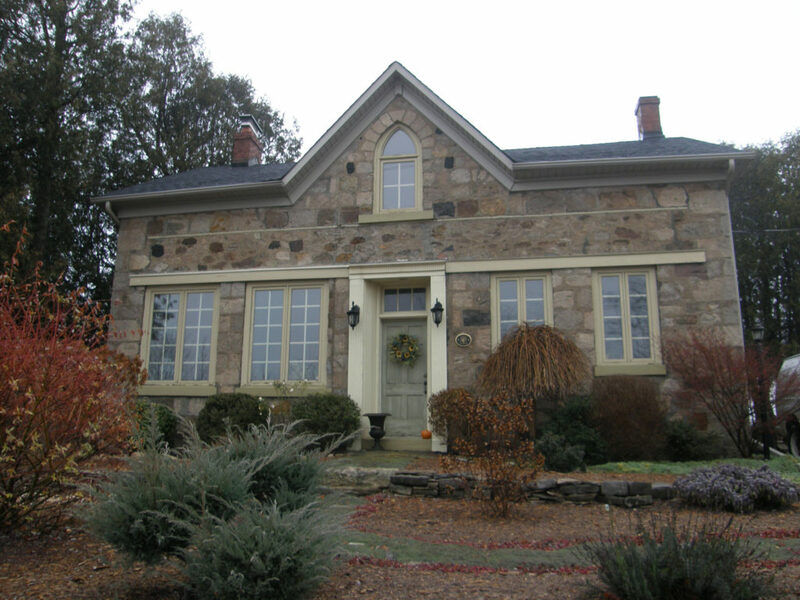 The front façade has two front doors and two windows with finished cut and tooled stone doorsteps and window sills. The steps are positioned to the right of centre. Each of the five square posts is decorated with spandrel brackets and decorative scrolls. 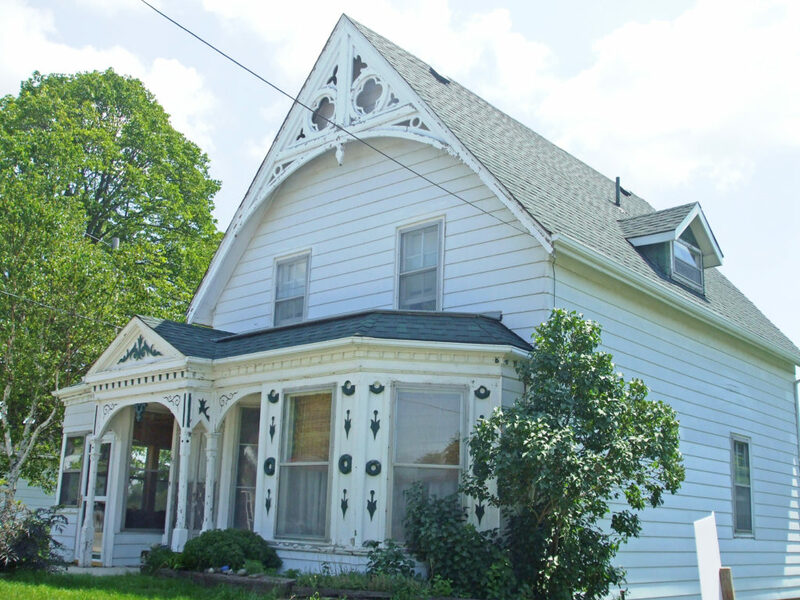 The pitched roof has a front central gable with a carved finial. 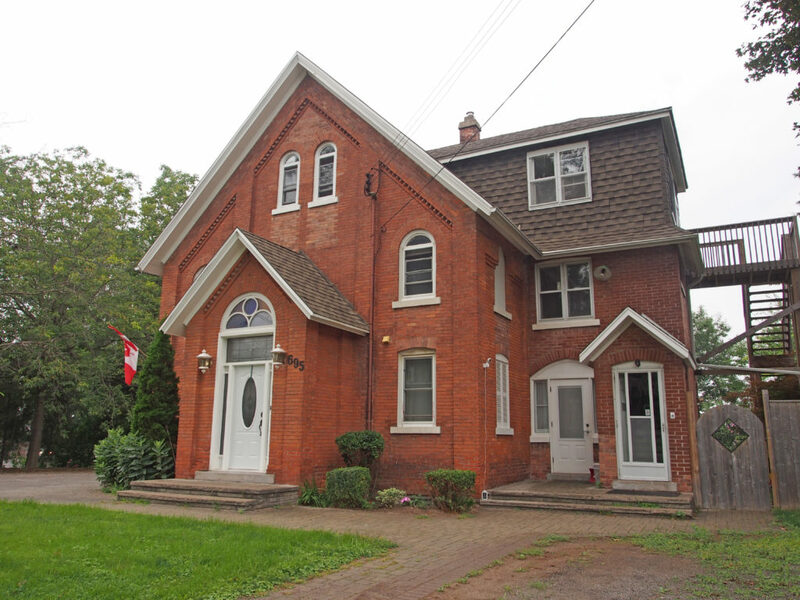 The center pointed arch window has sidelights supported by double header brick. The gable has decorative barge board. The windows are six-over-six panes.